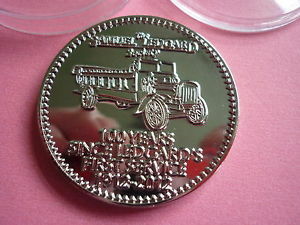 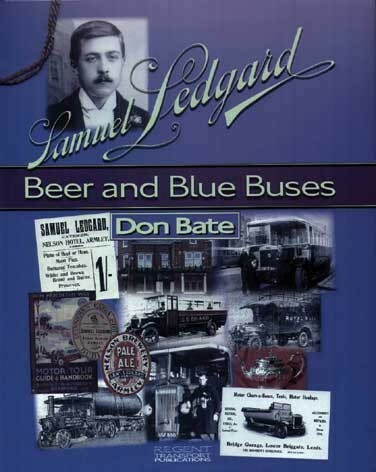 Samuel Ledgard (1874–1952) was a Leeds entrepreneur who became a major West Yorkshire Independent bus operator. 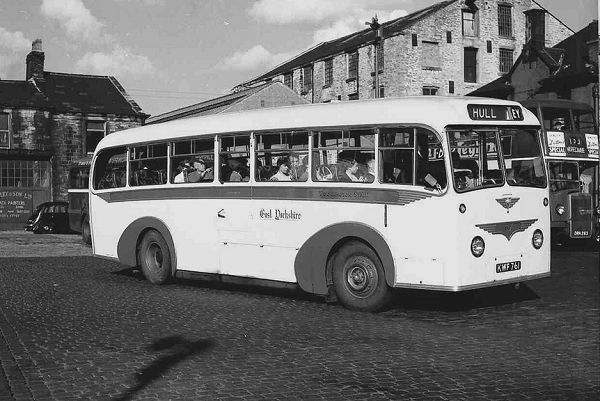 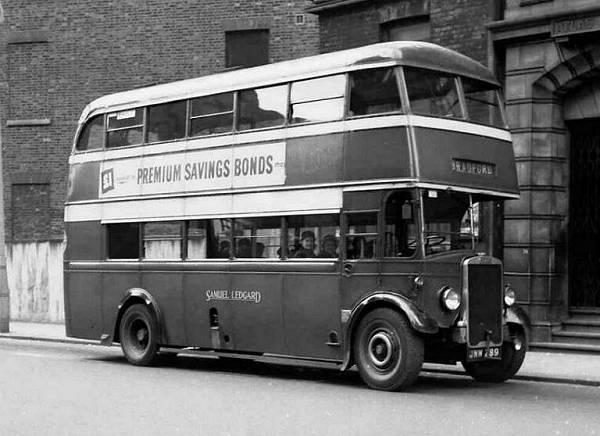 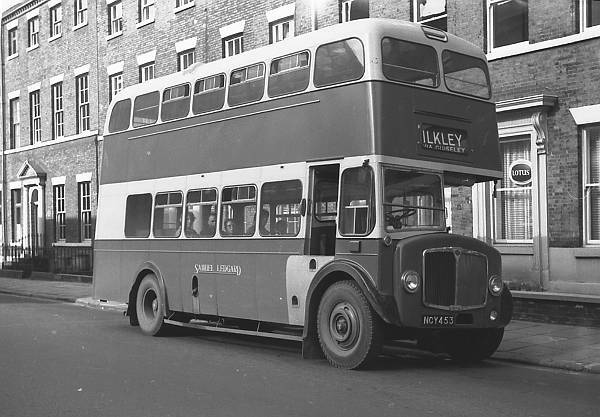 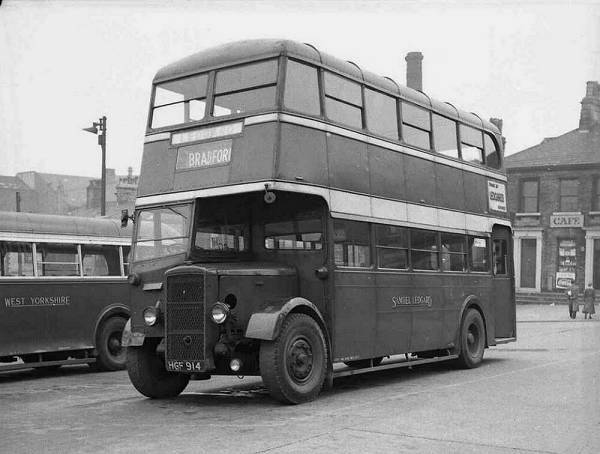 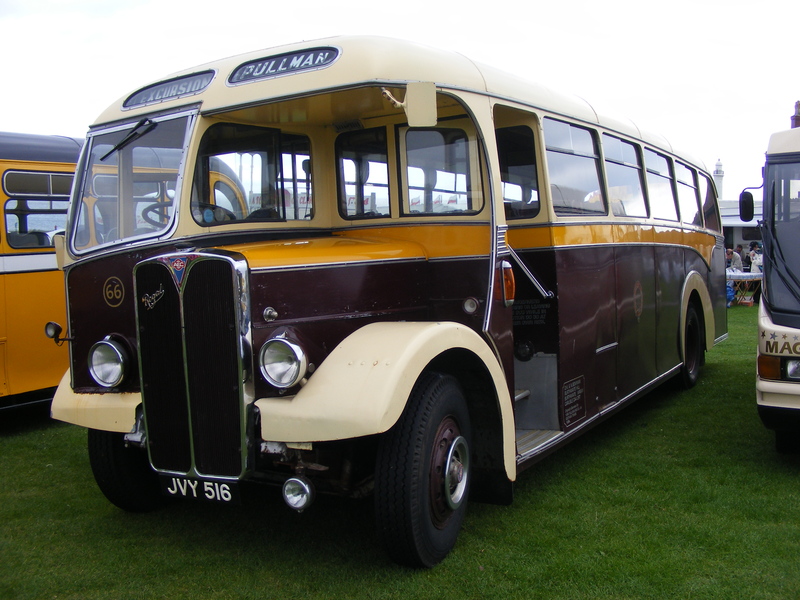 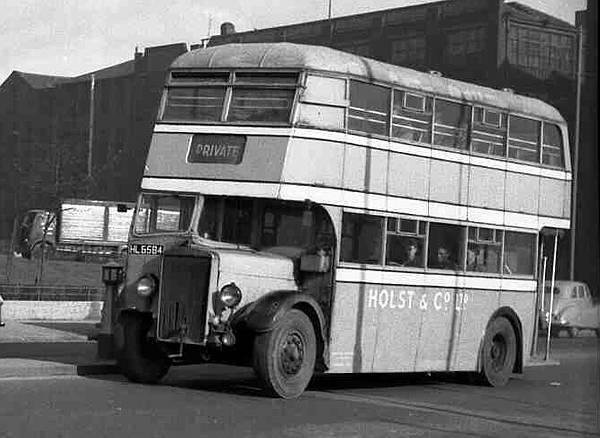 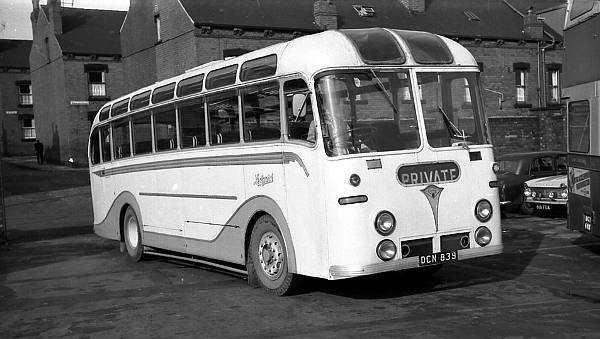 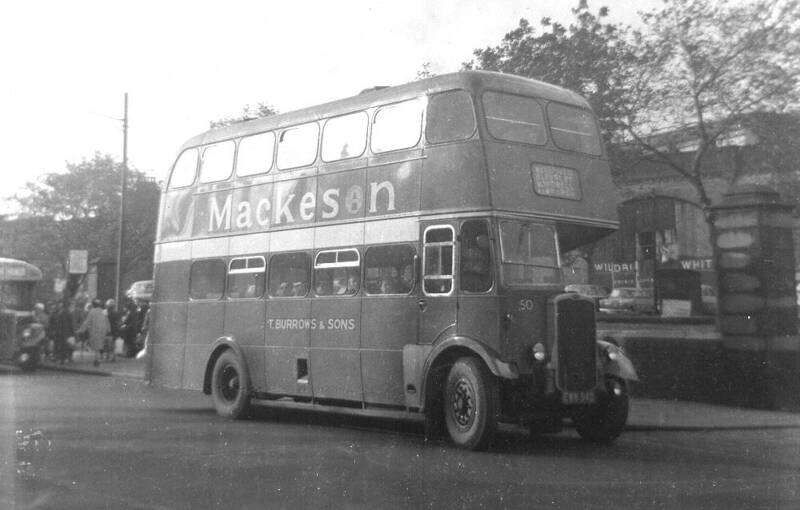 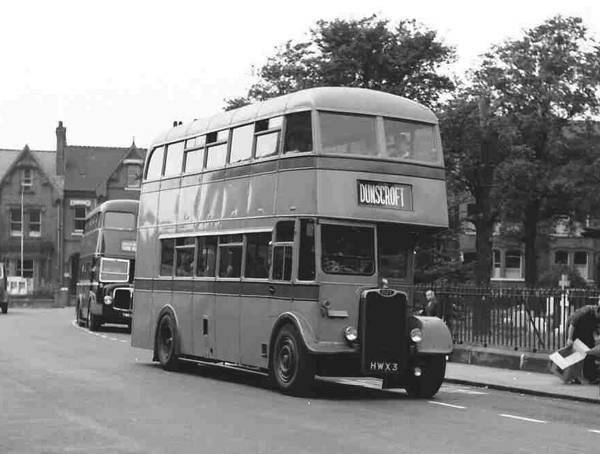 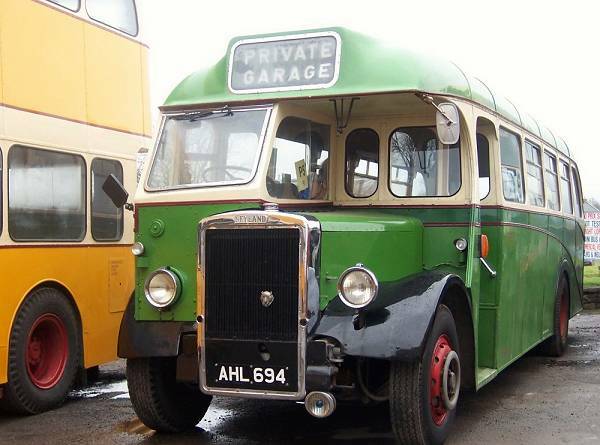 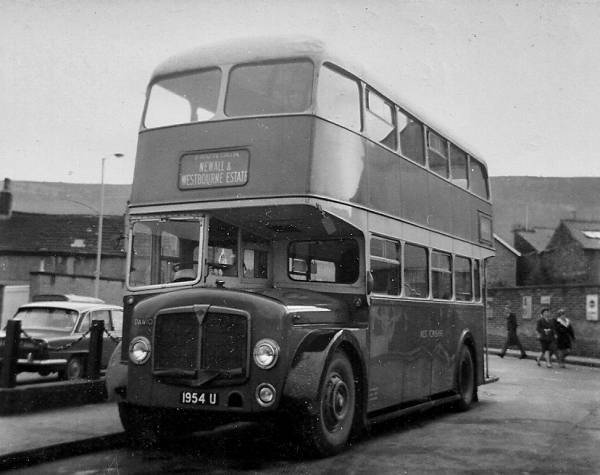 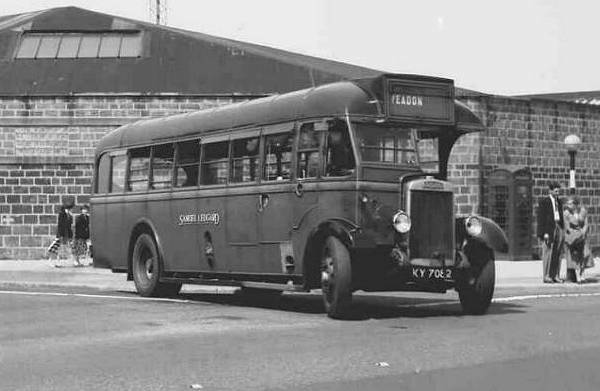 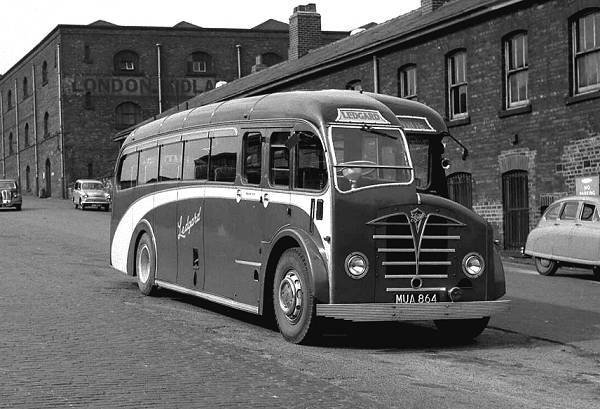 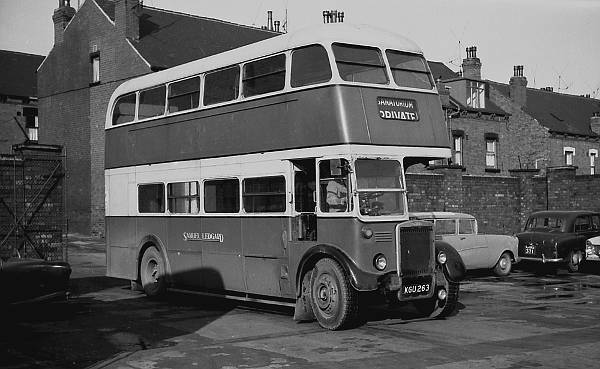 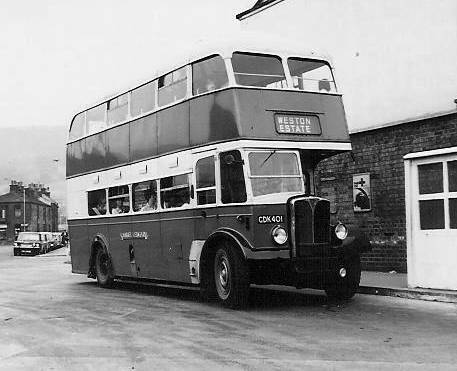 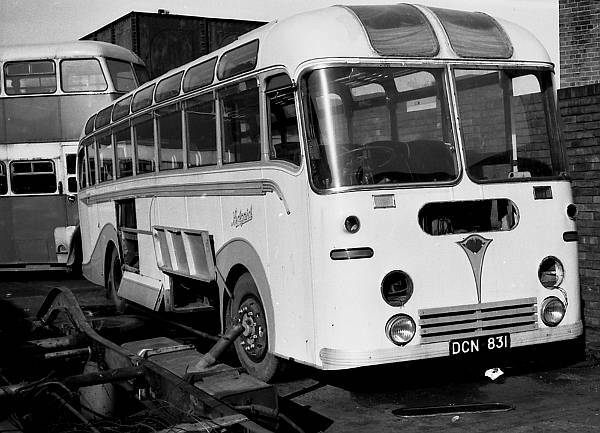 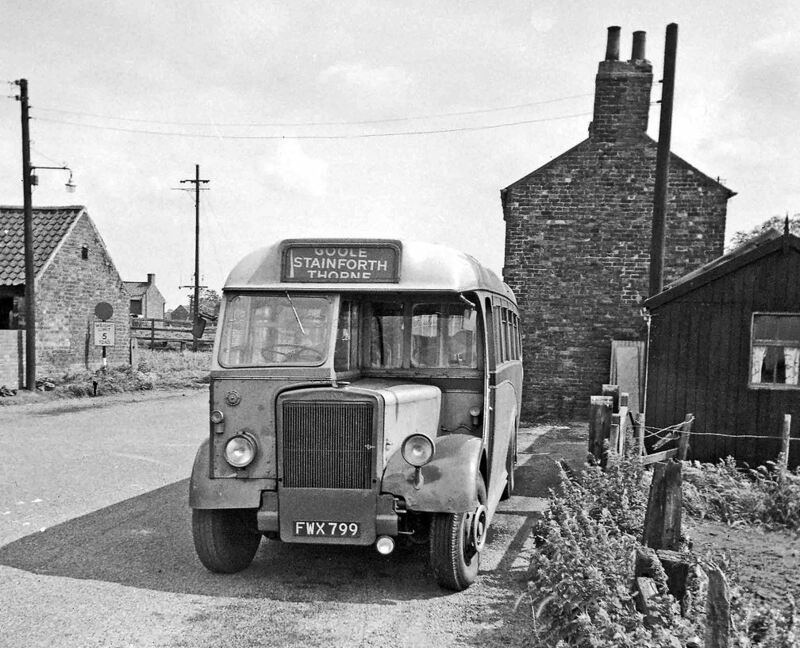 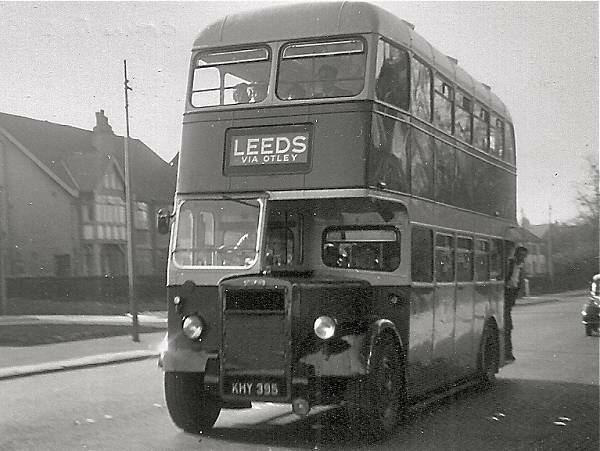 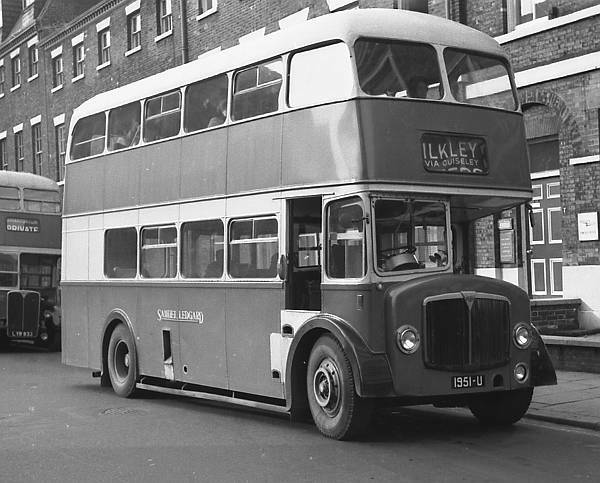 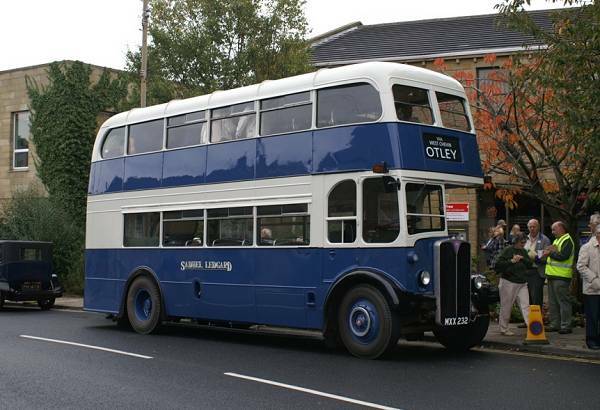 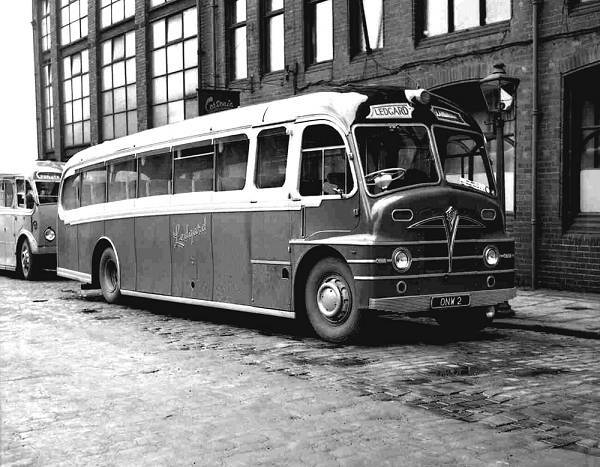 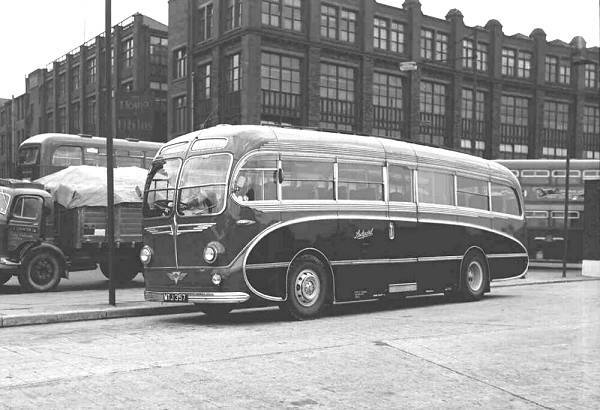 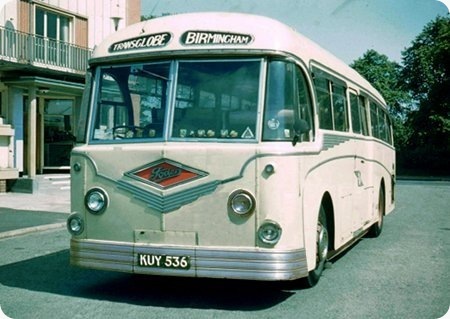 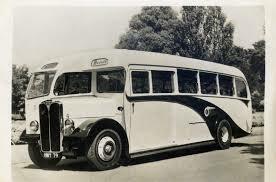 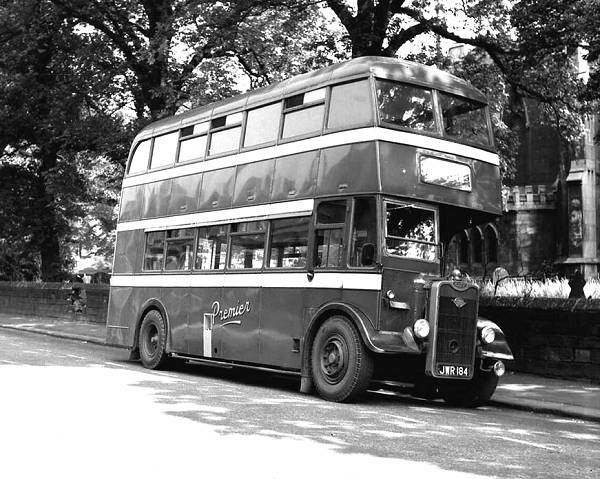 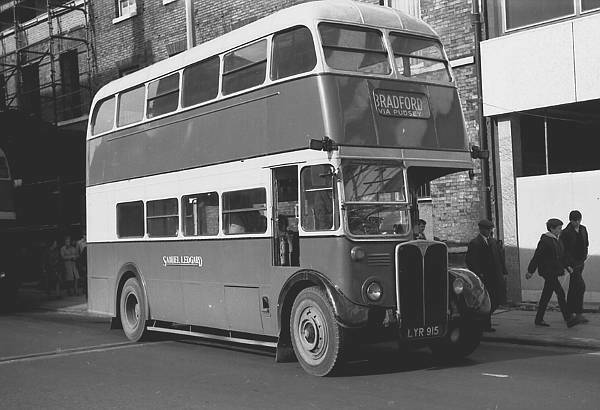 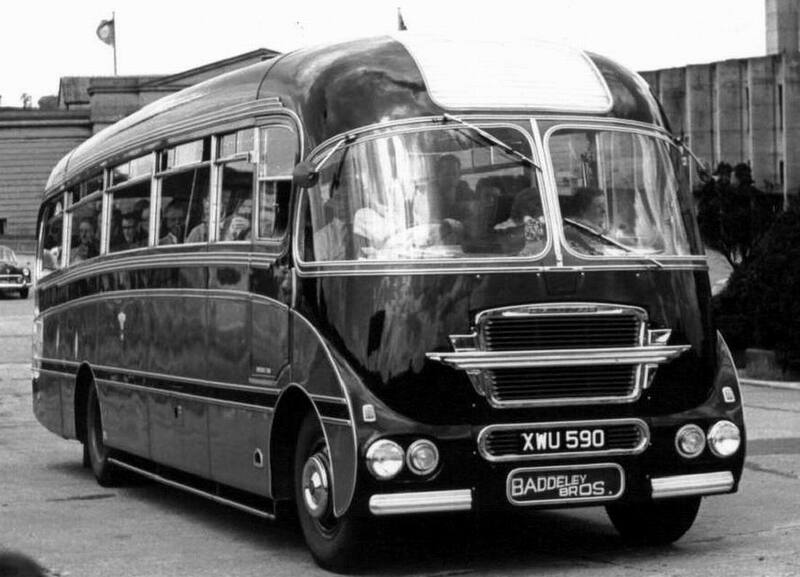 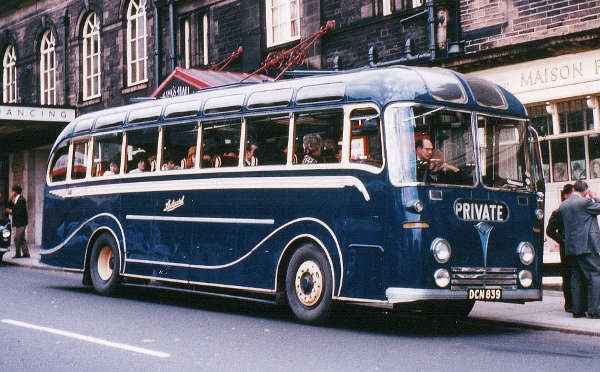 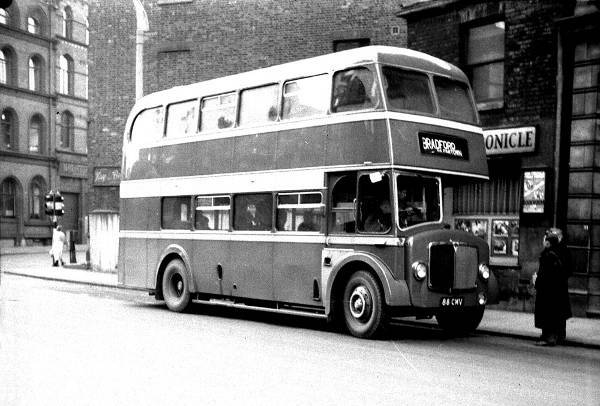 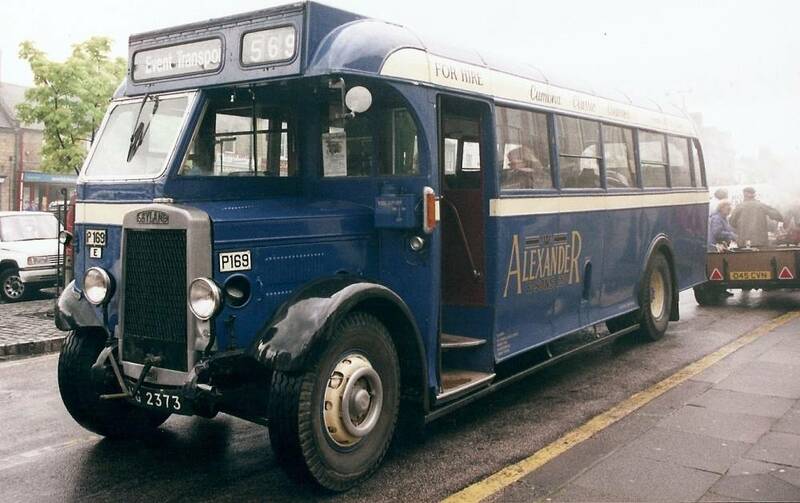 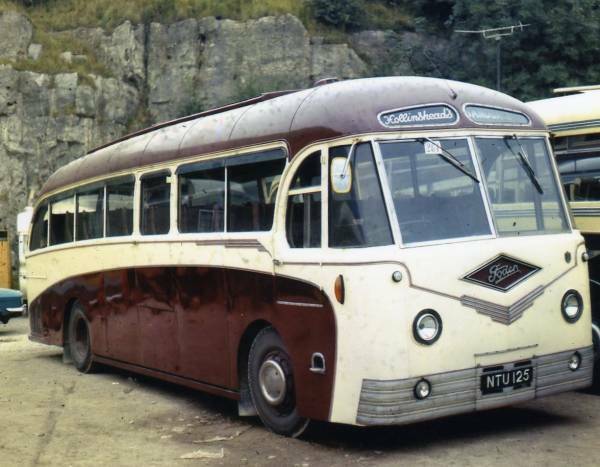 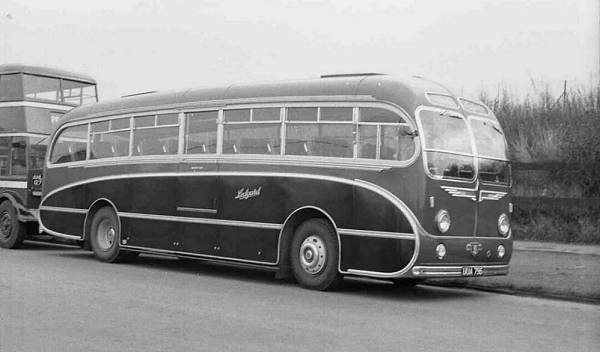 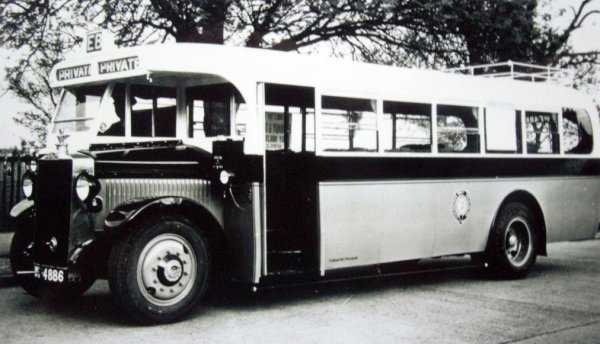 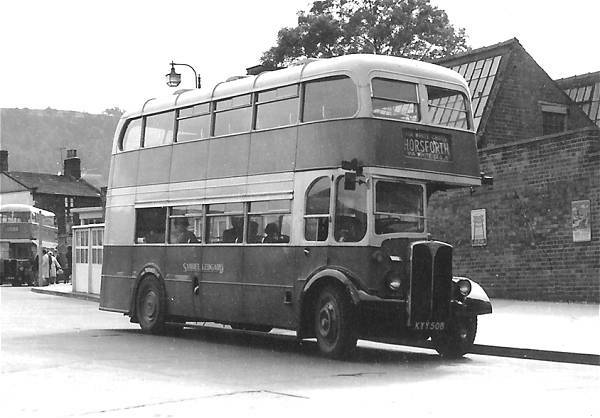 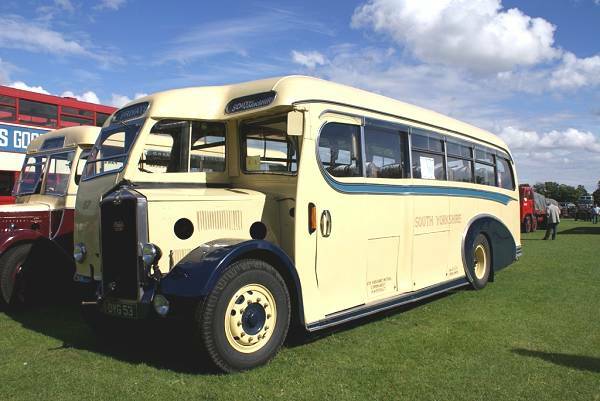 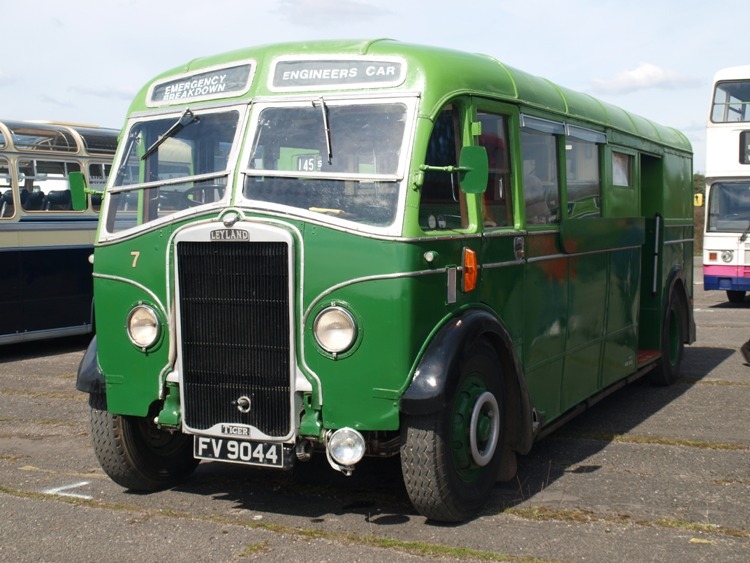 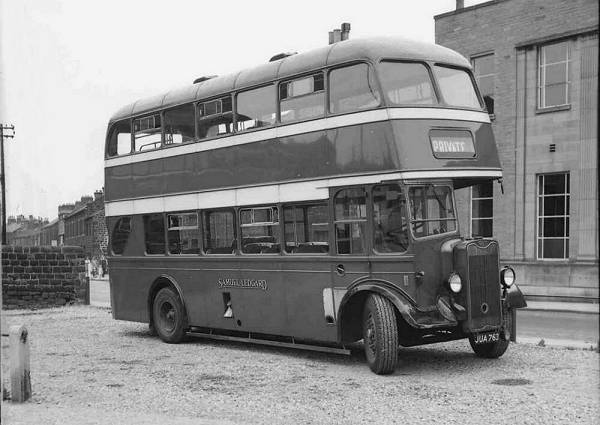 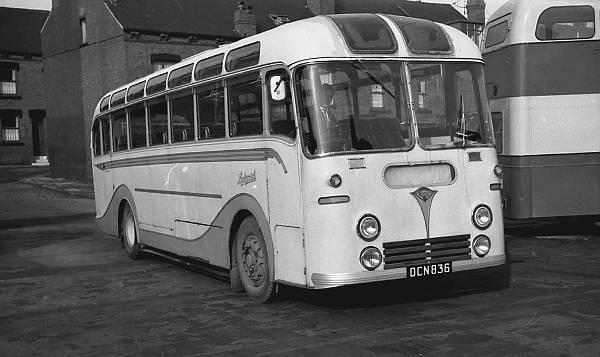 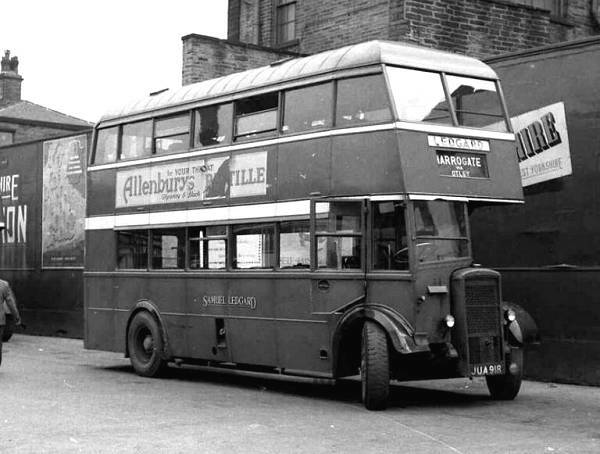 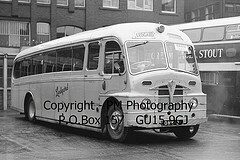 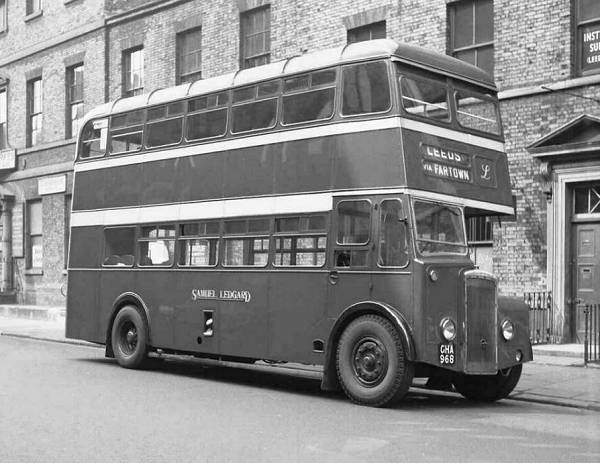 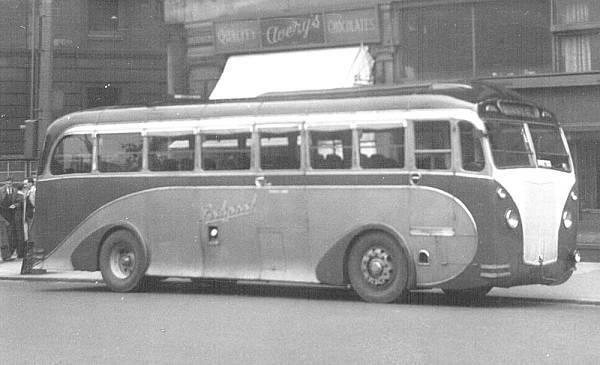 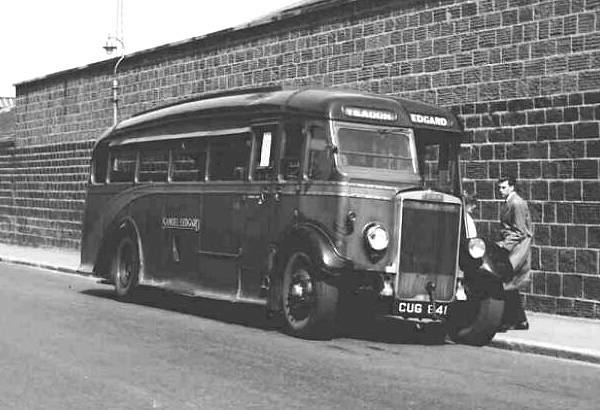 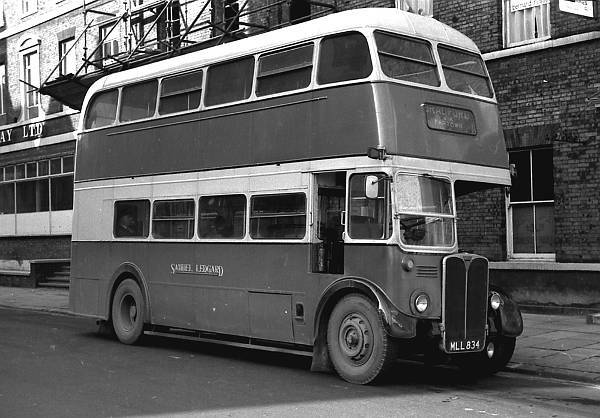 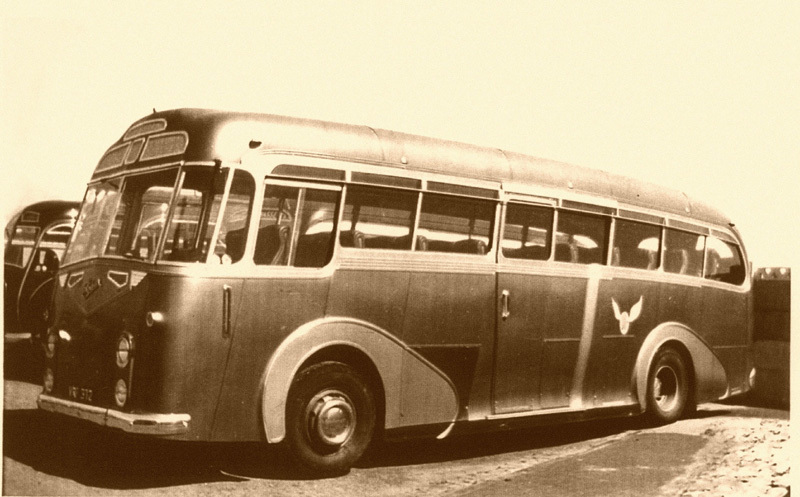 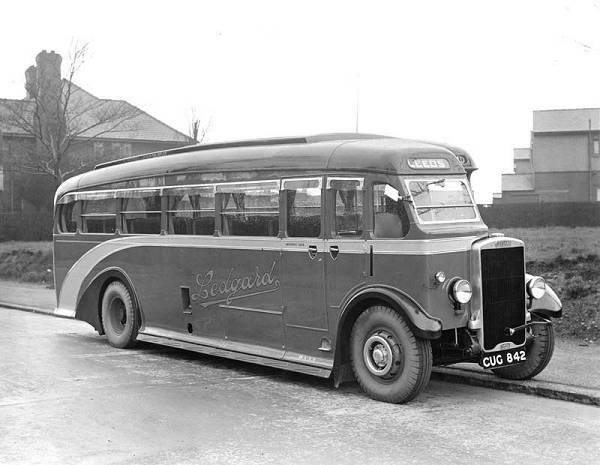 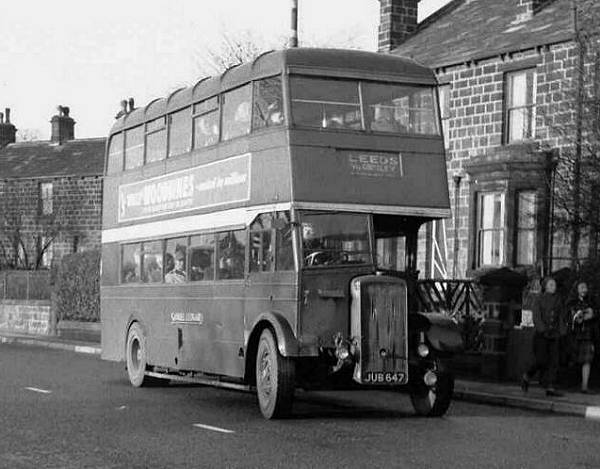 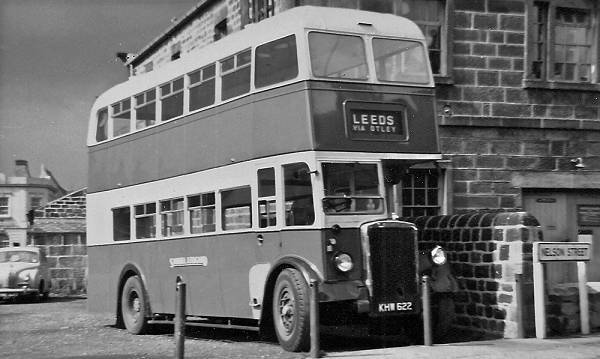 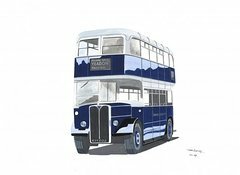 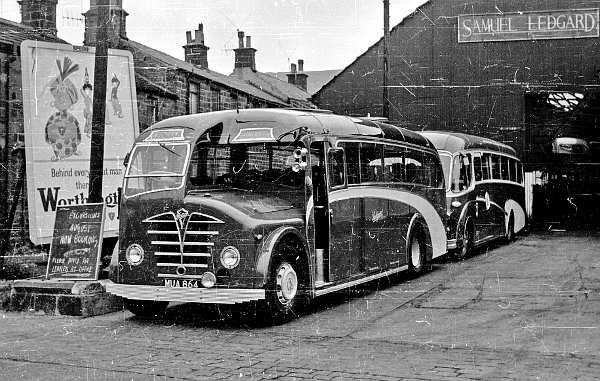 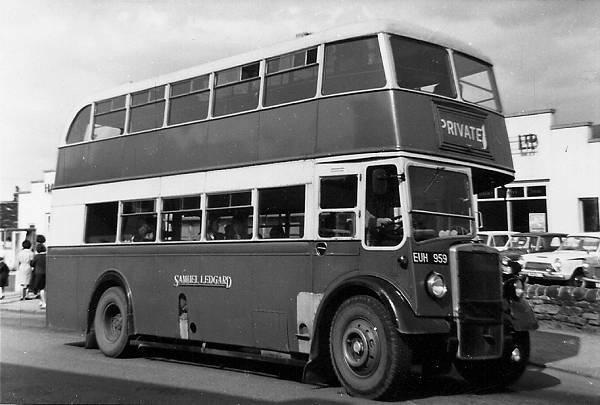 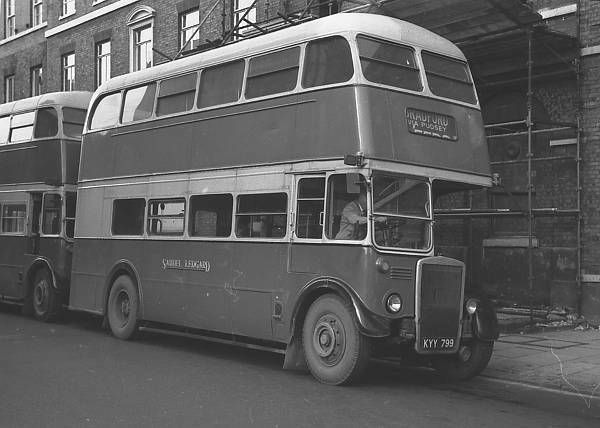 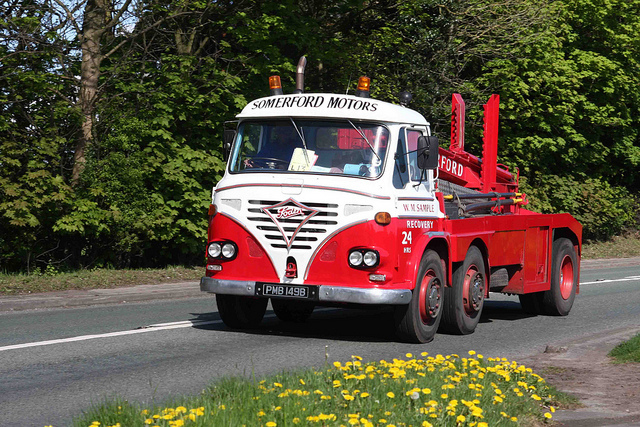 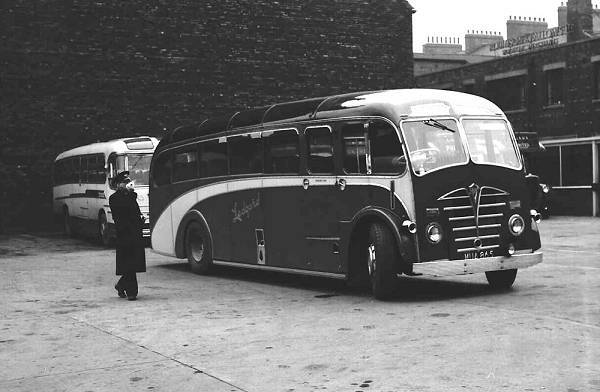 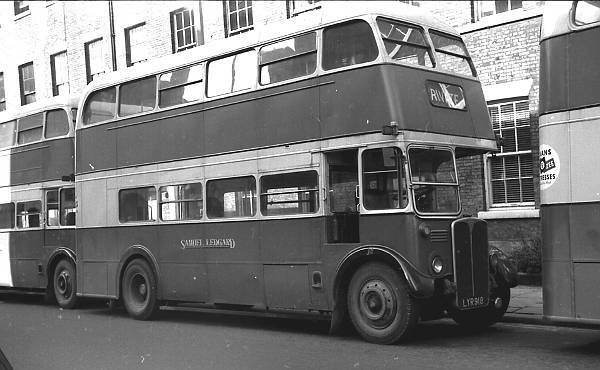 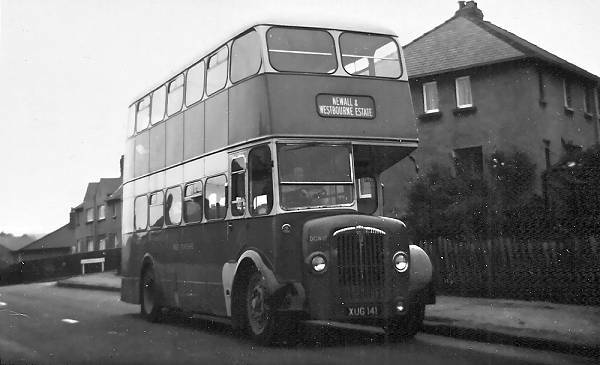 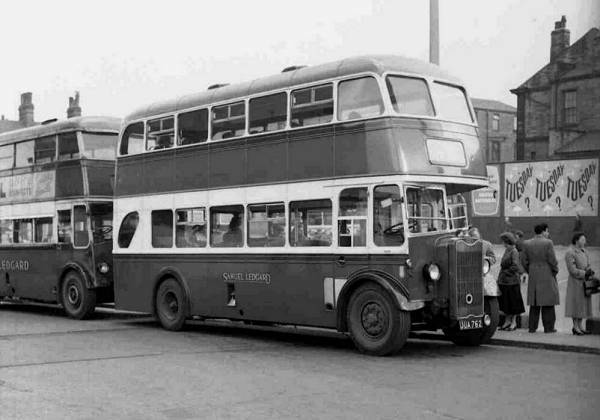 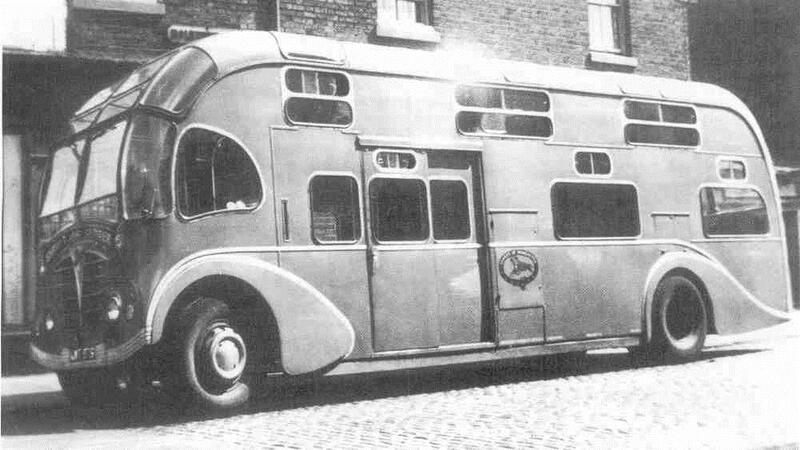 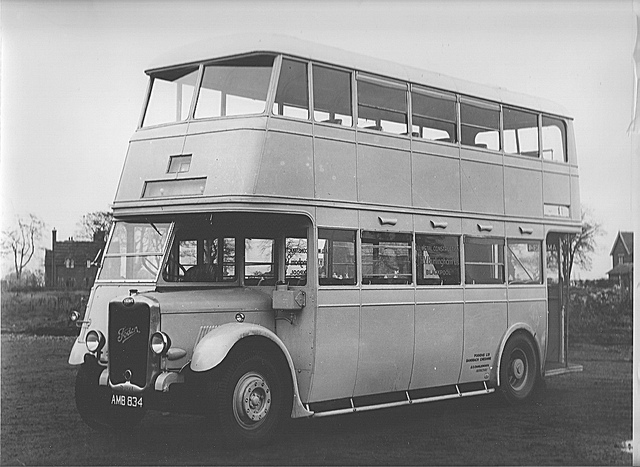 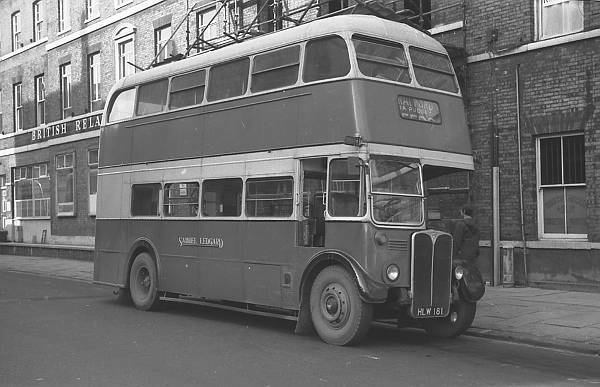 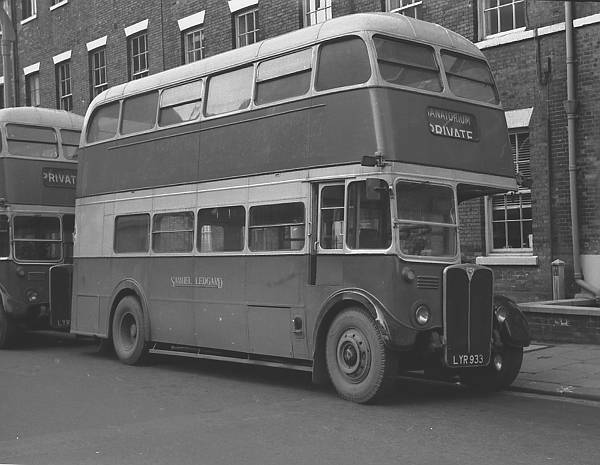 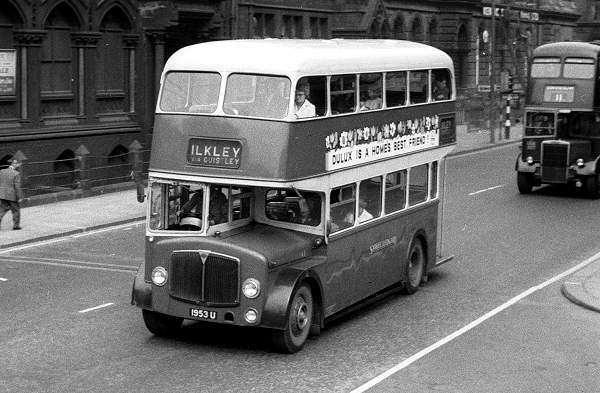 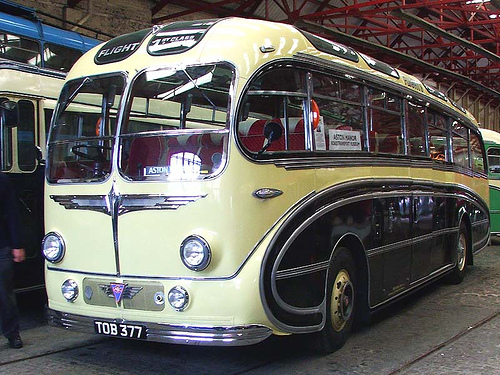 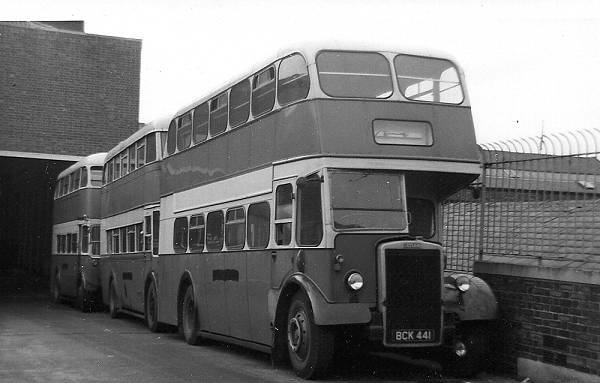 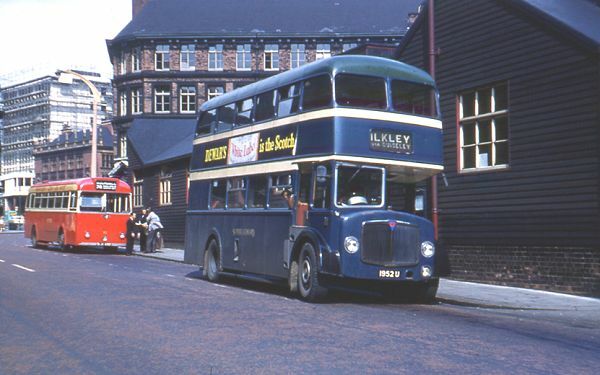 Following his death in 1952, his executors continued to operate the Samuel Ledgard bus company up until 1967, when it was acquired by the West Yorkshire Road Car Company. 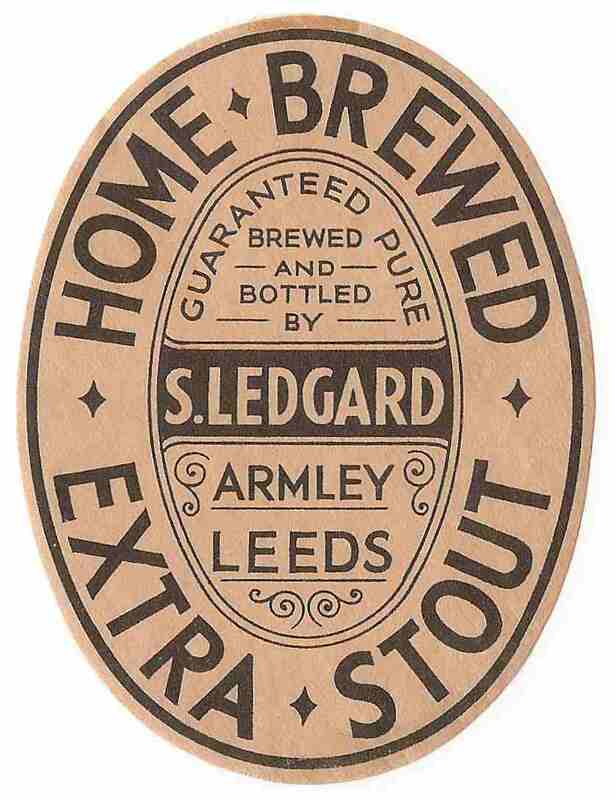 Samuel Ledgard was born in Leeds in 1874. 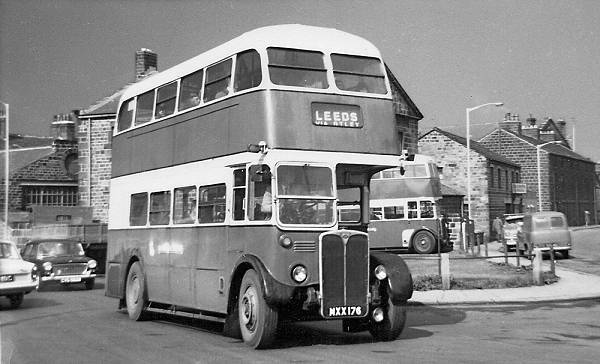 His business empire started in 1897 when he became the licensee of the Nelson Hotel in Armley, Leeds. 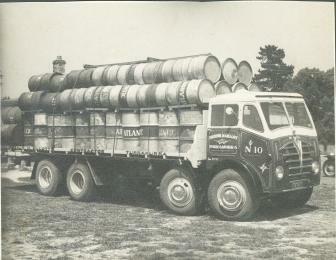 He also owned a brewery and bottling plant, located behind The Nelson and bottled bulk Guinness and Bass. 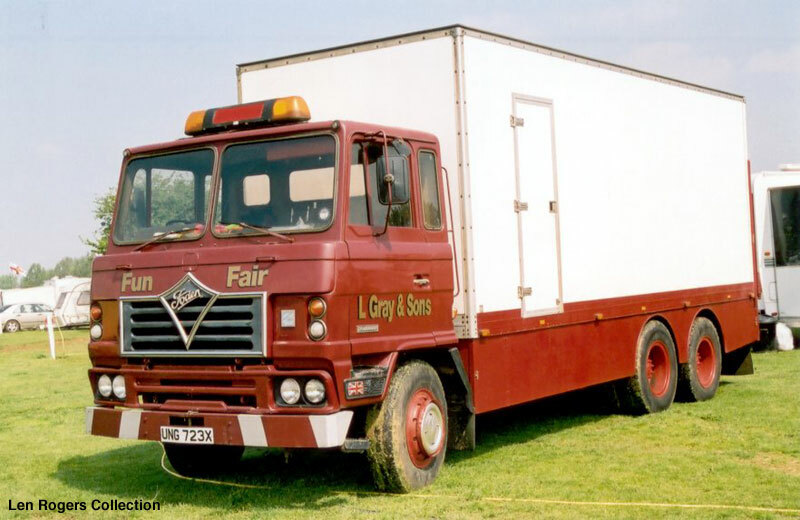 In expanding this business he provided outside catering at race meetings and local shows, and initially used a horse-and-cart to support this enterprise. 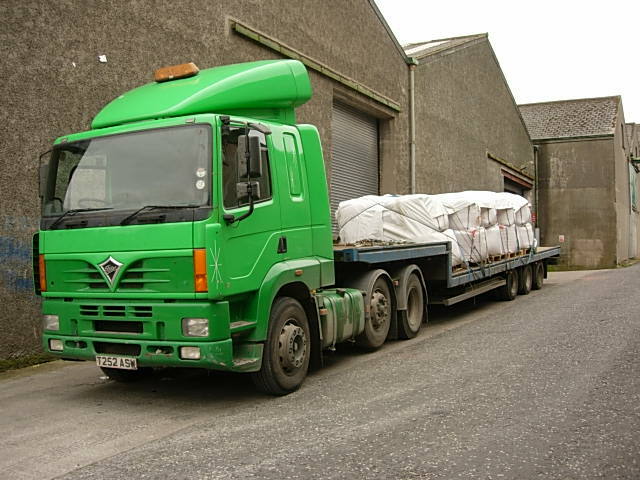 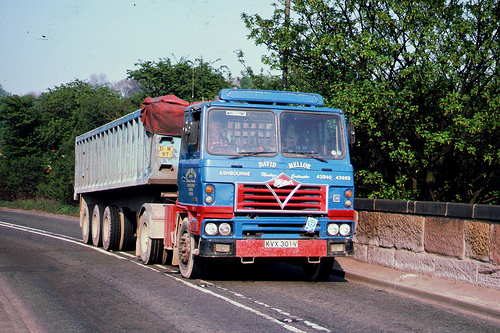 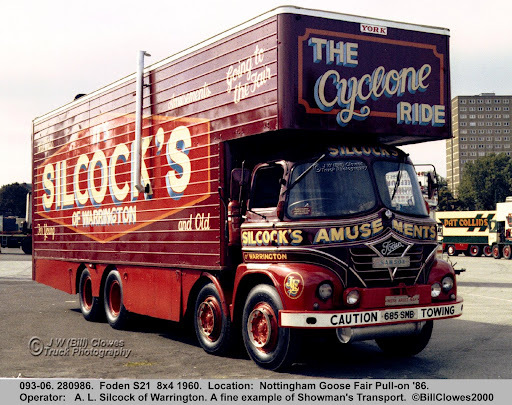 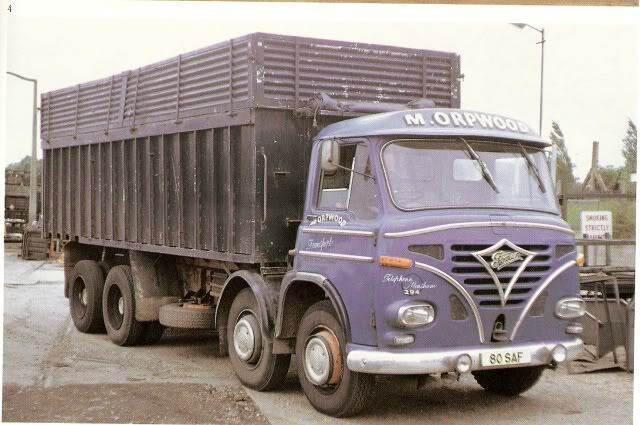 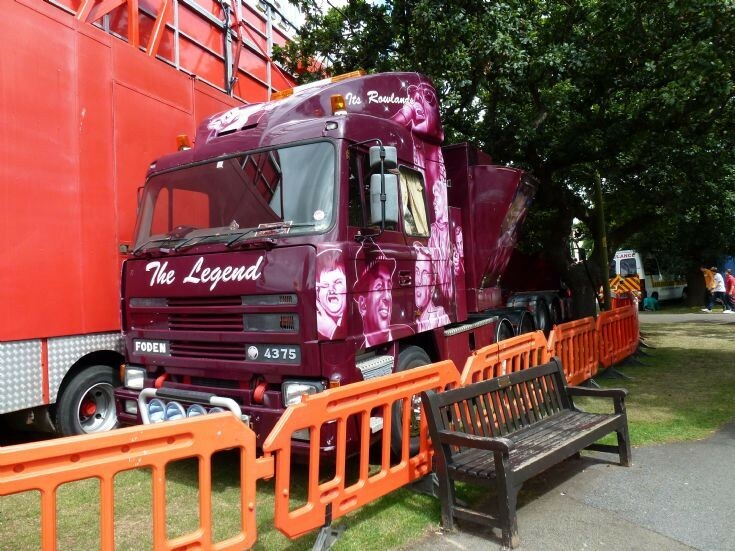 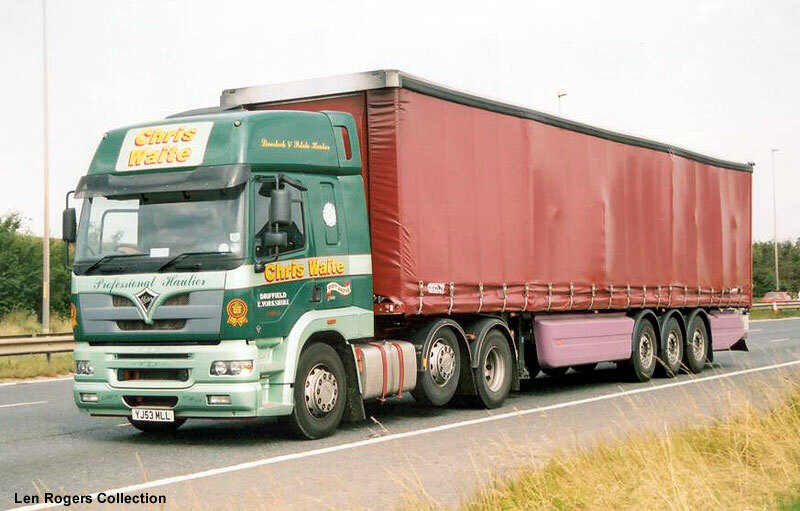 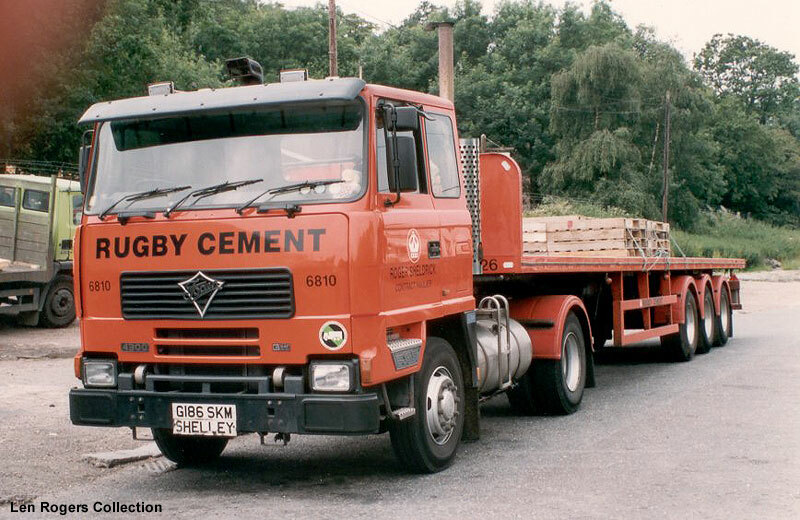 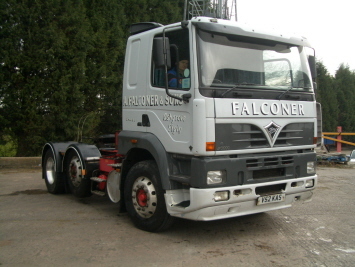 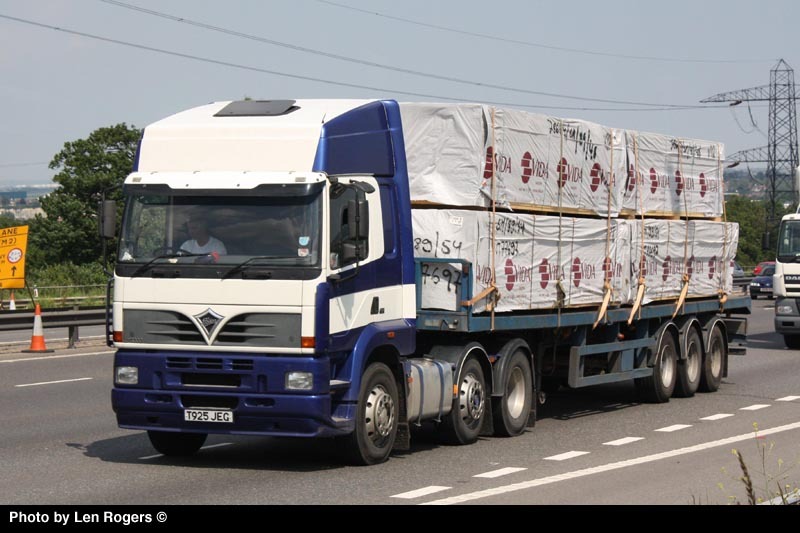 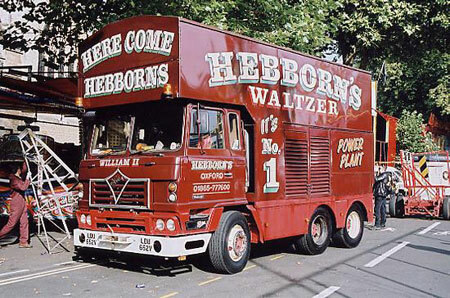 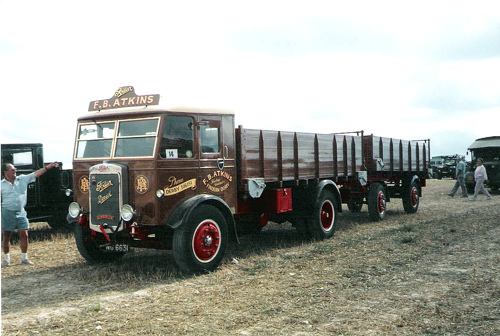 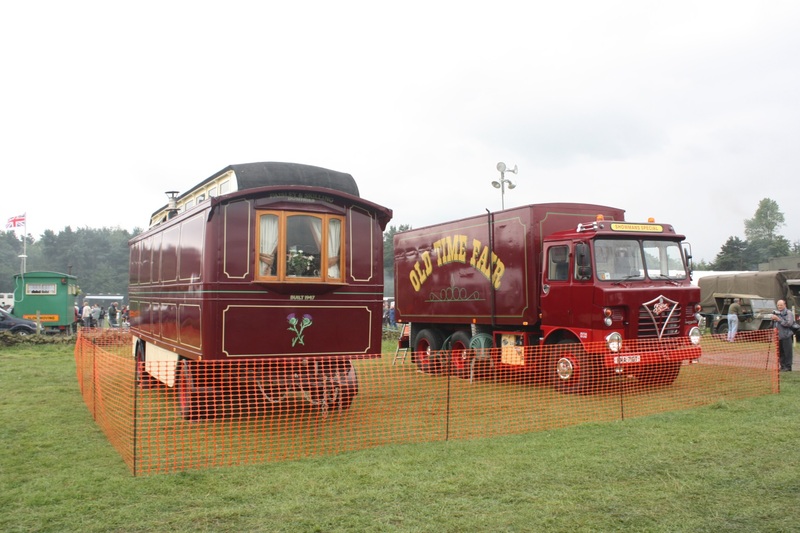 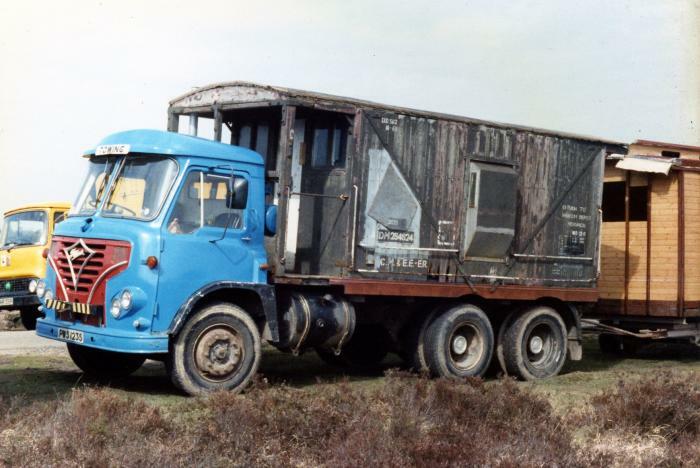 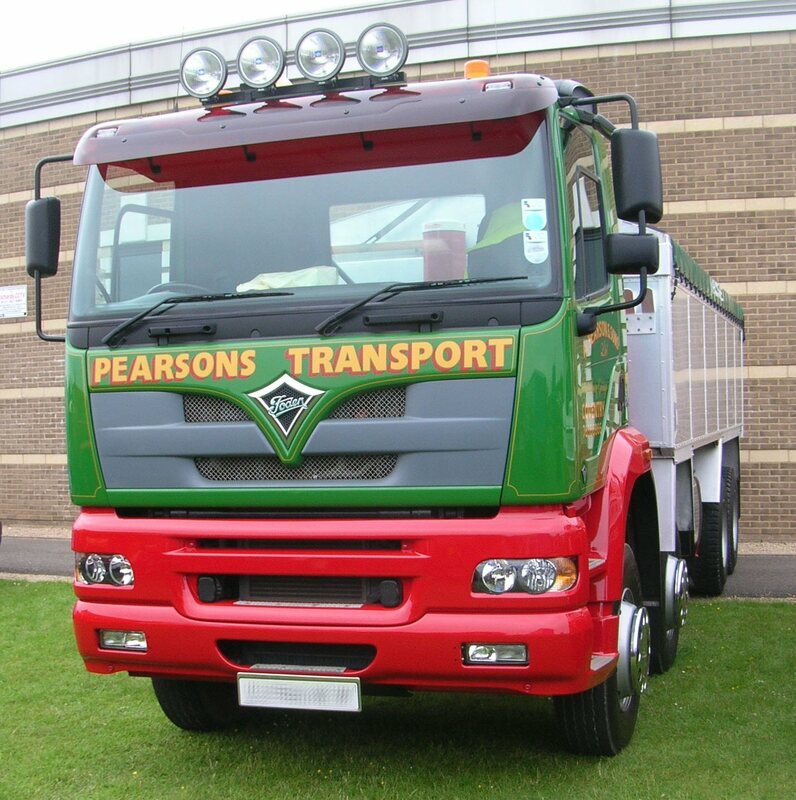 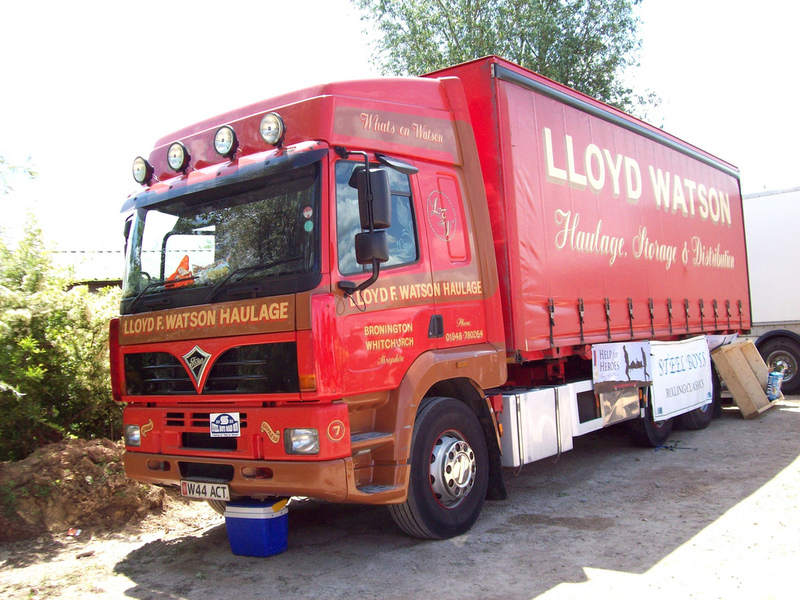 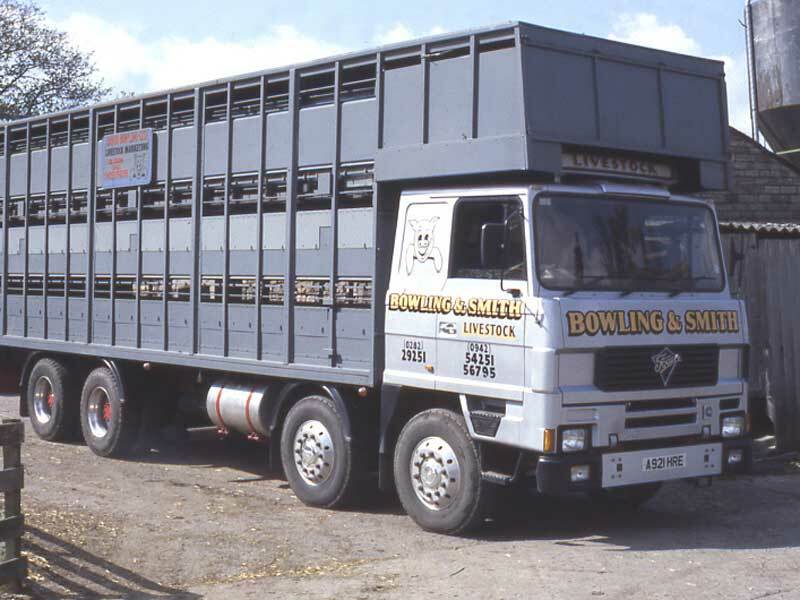 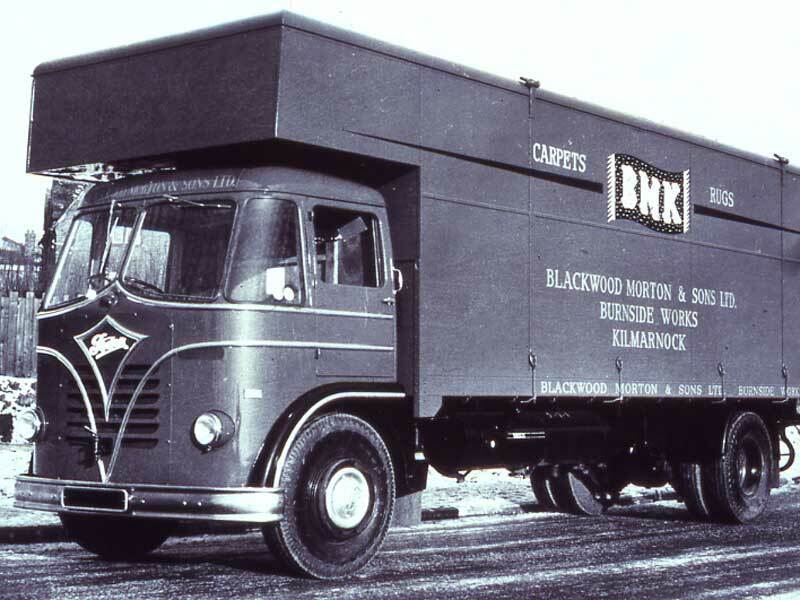 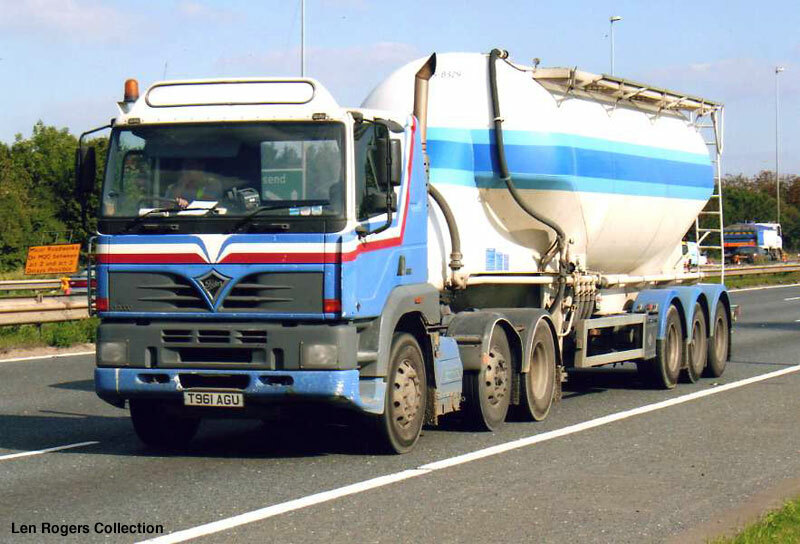 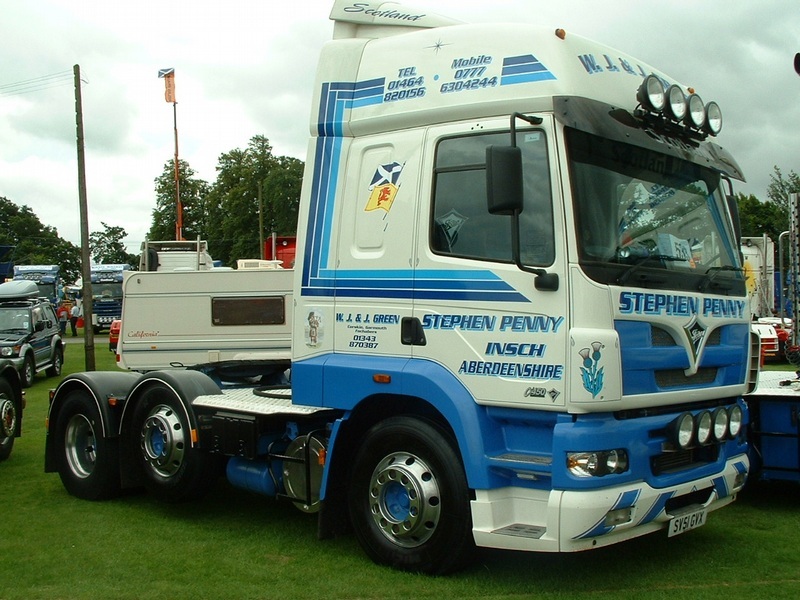 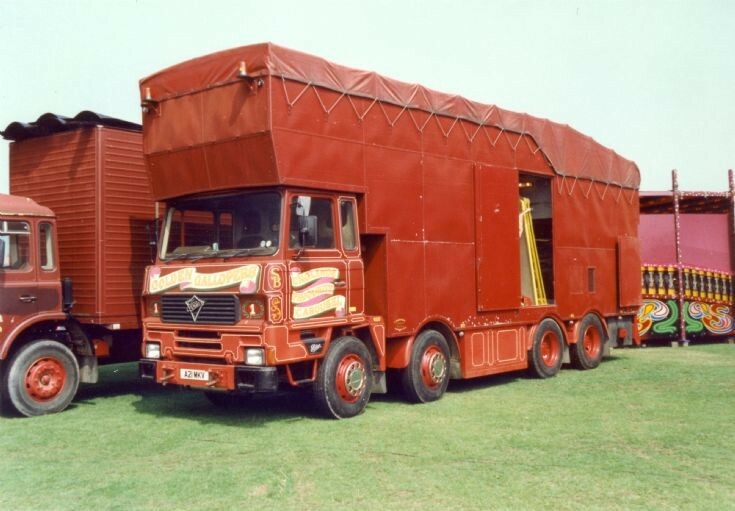 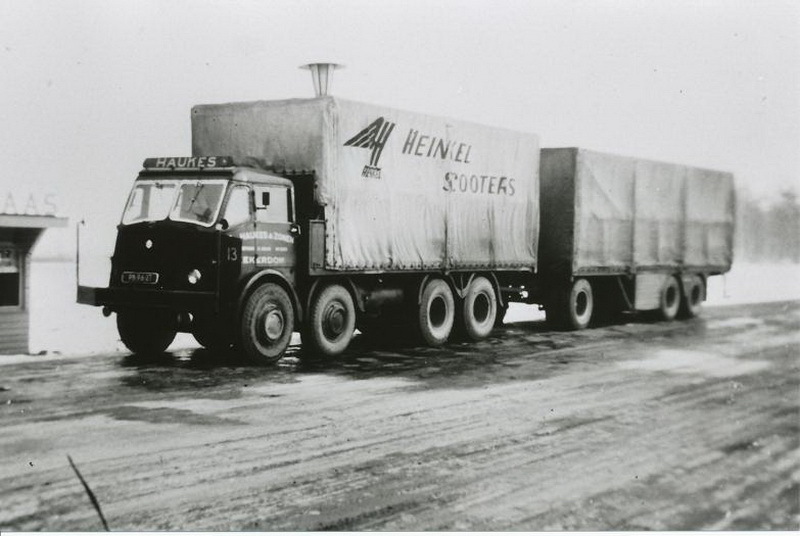 This led him to further expand into the haulage business – initially with his horses then, in 1906, with a steam lorry. 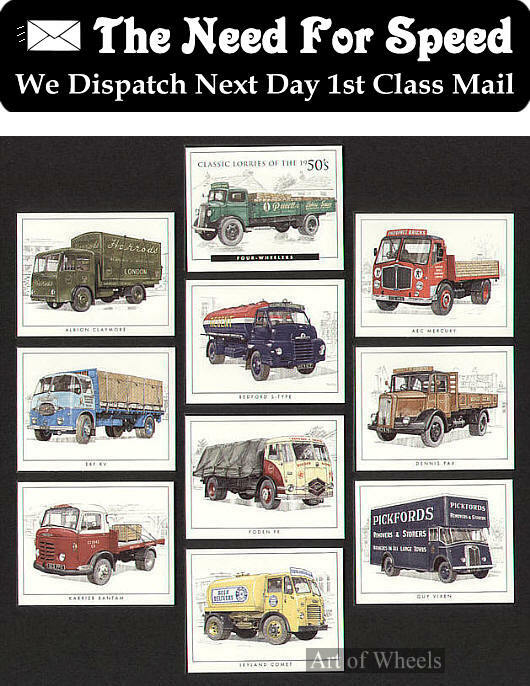 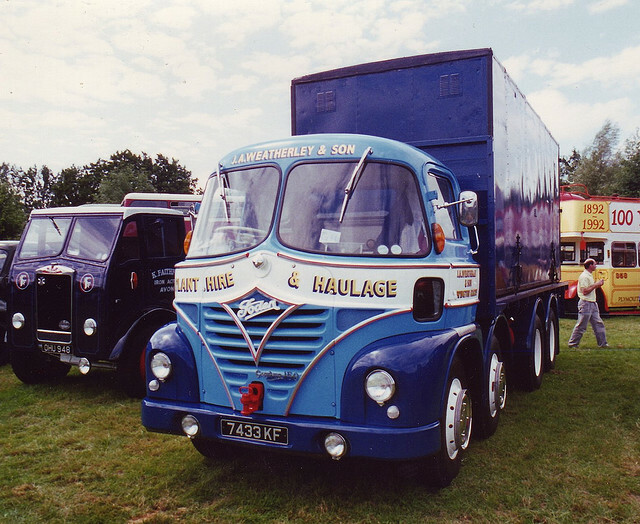 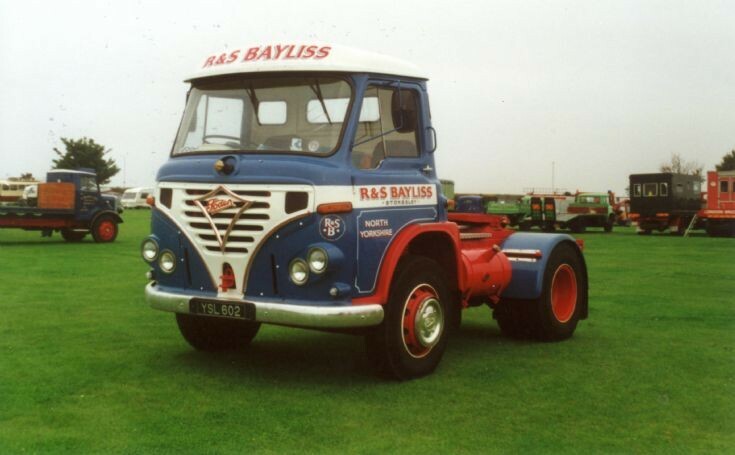 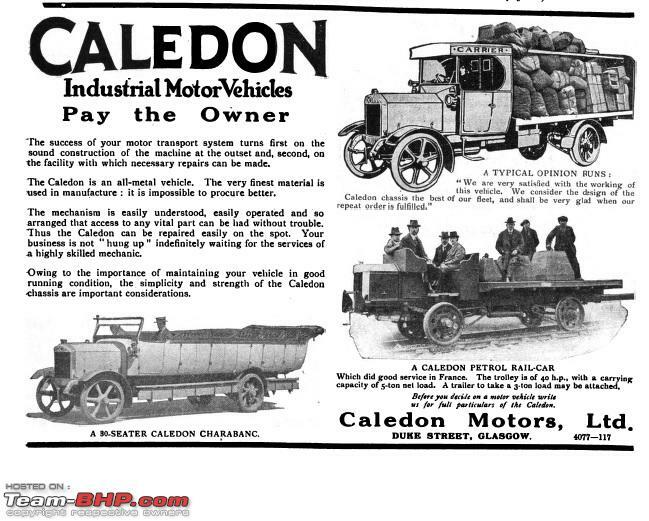 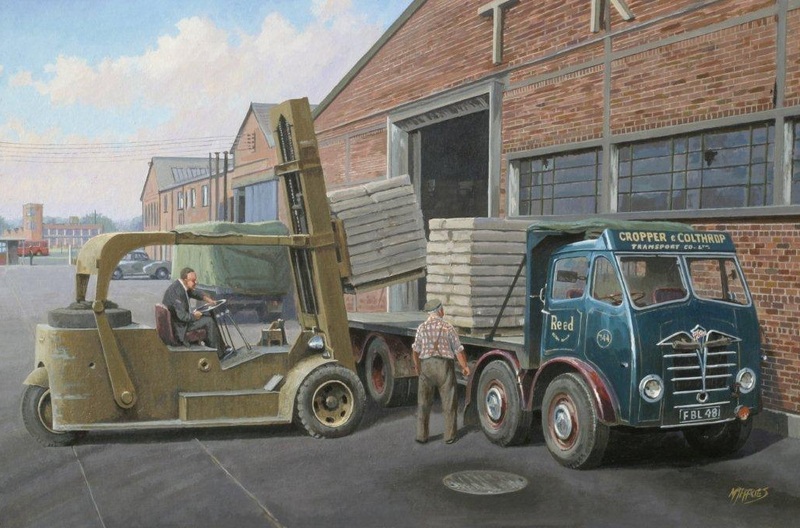 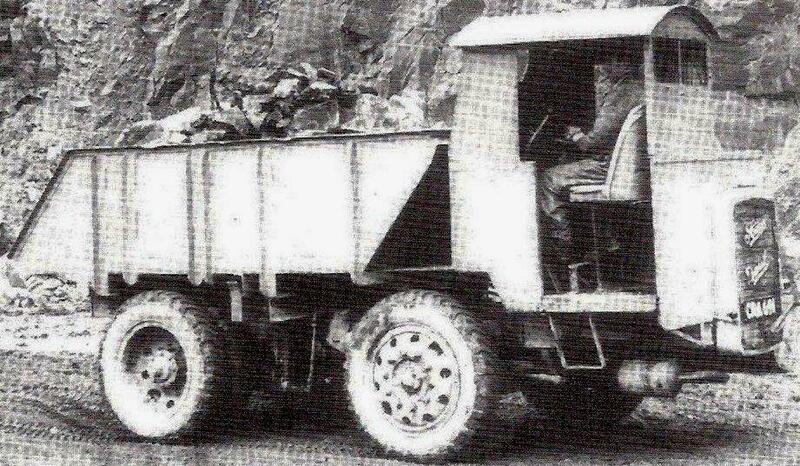 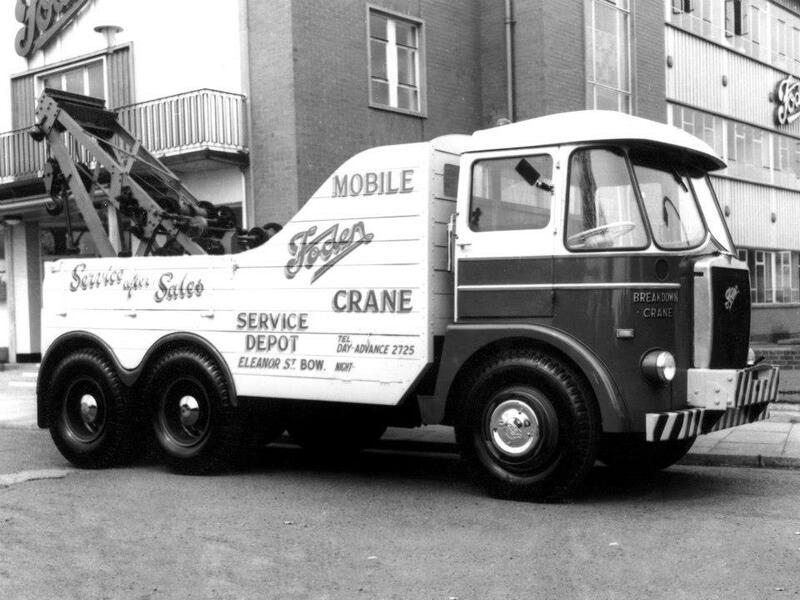 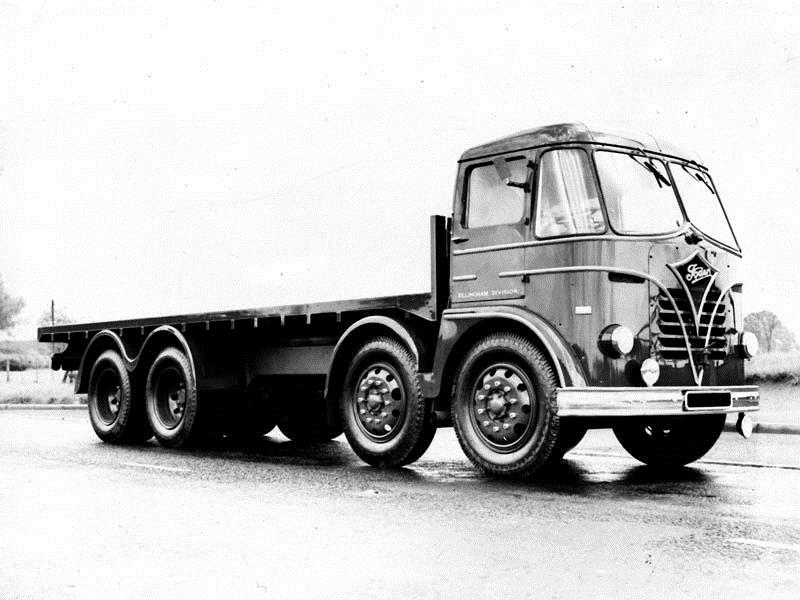 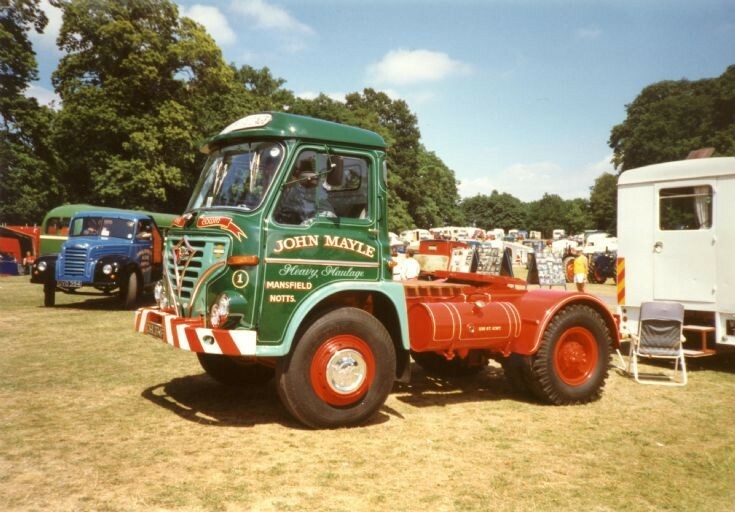 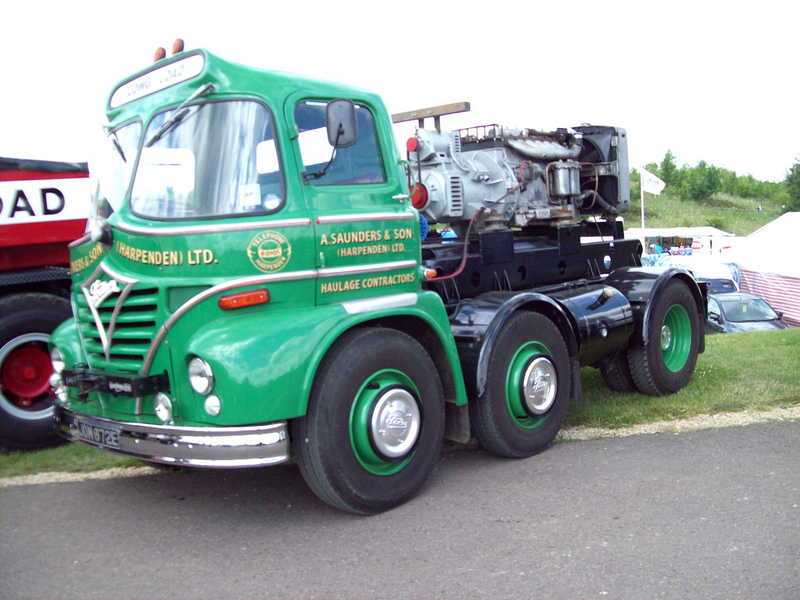 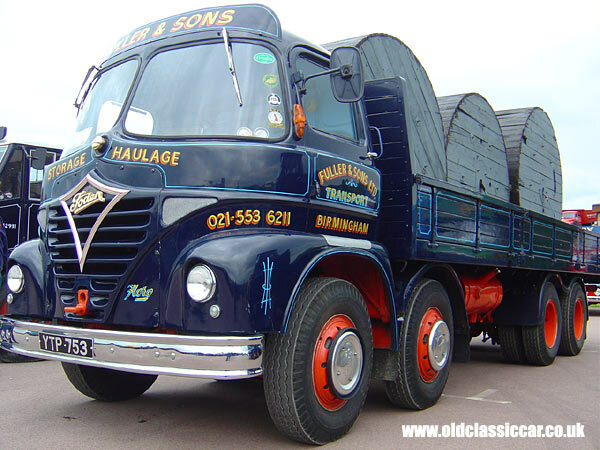 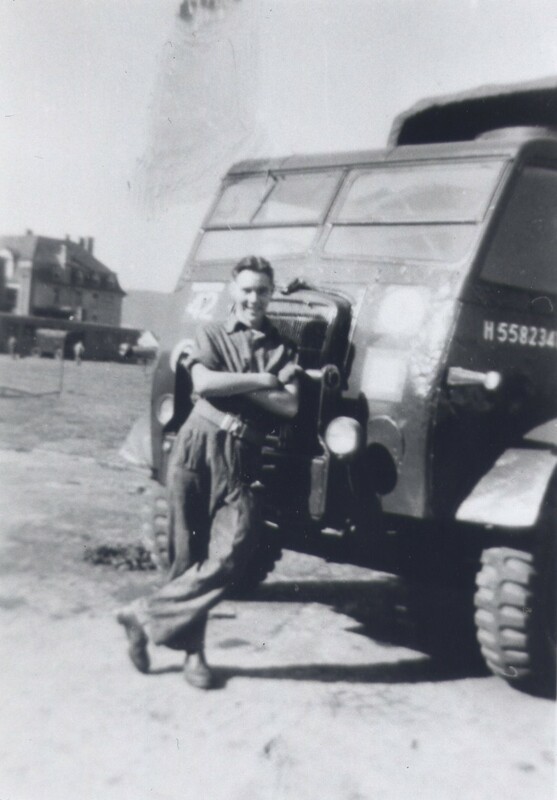 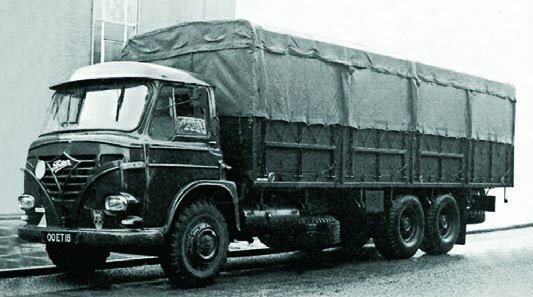 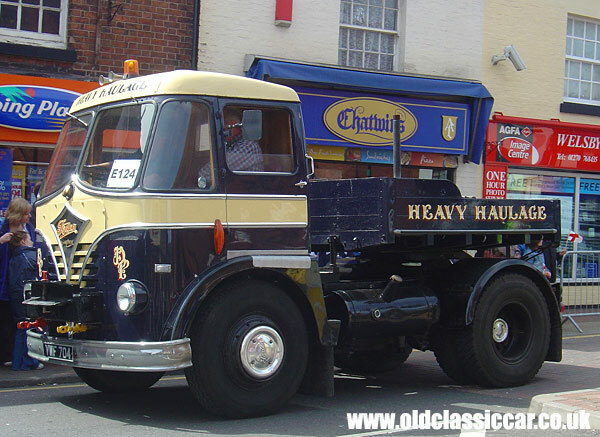 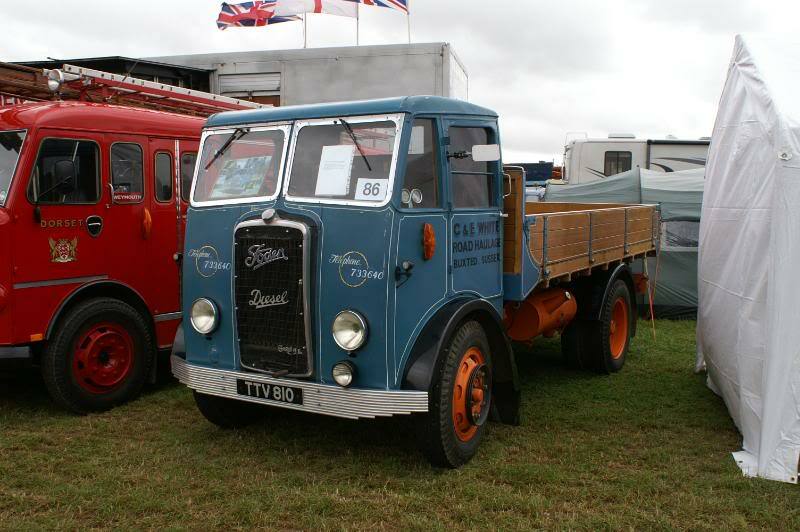 In 1912 he bought a Karrier petrol-engined lorry, registered U1949. 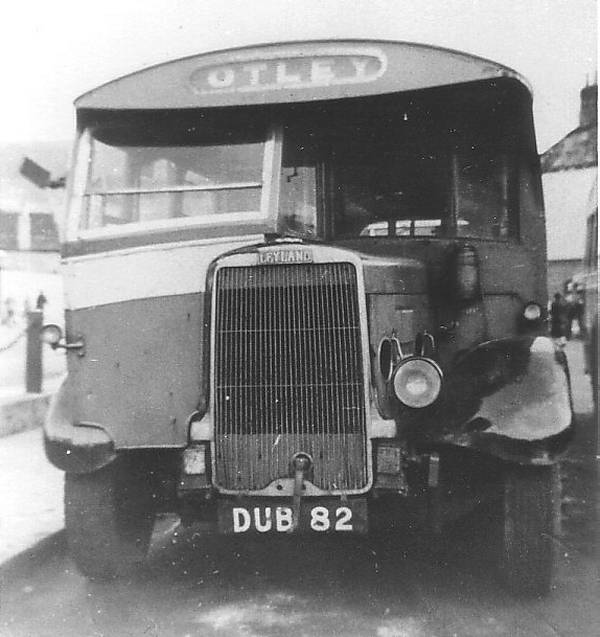 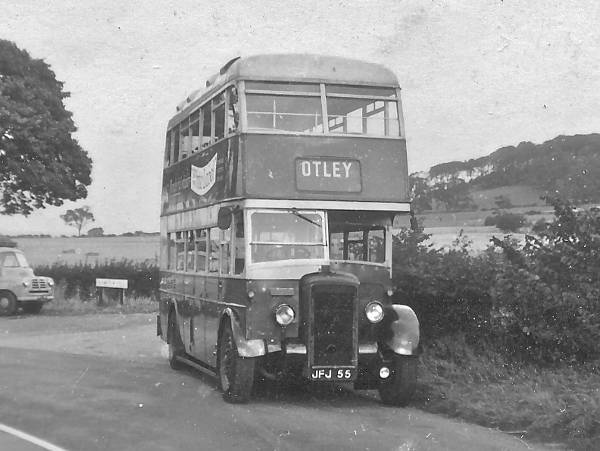 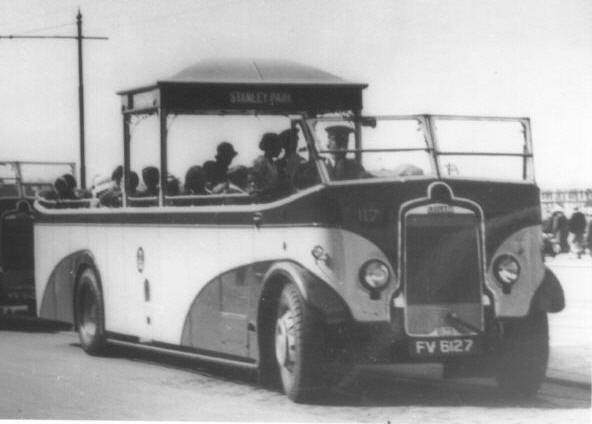 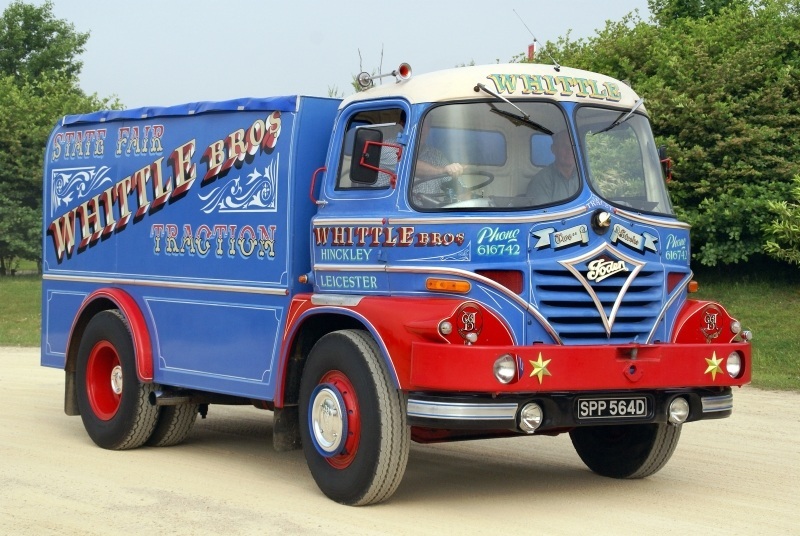 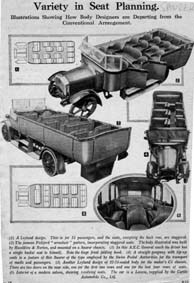 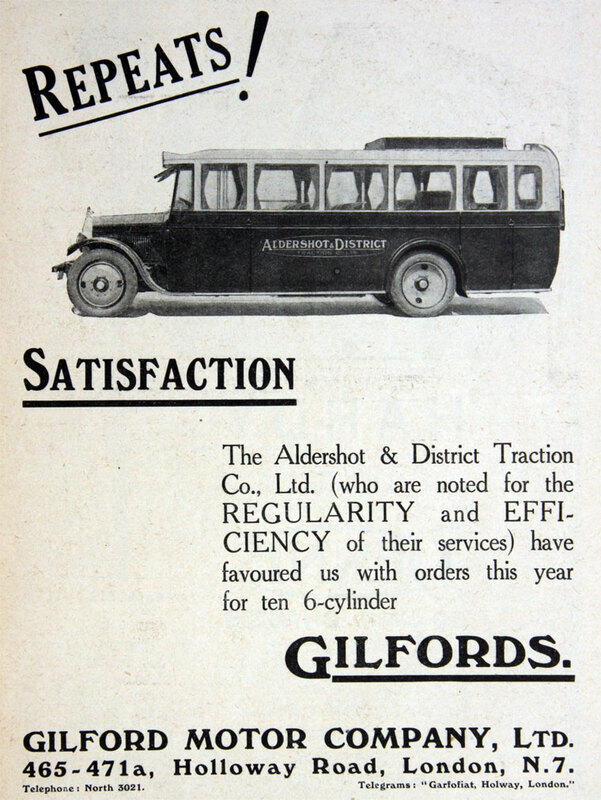 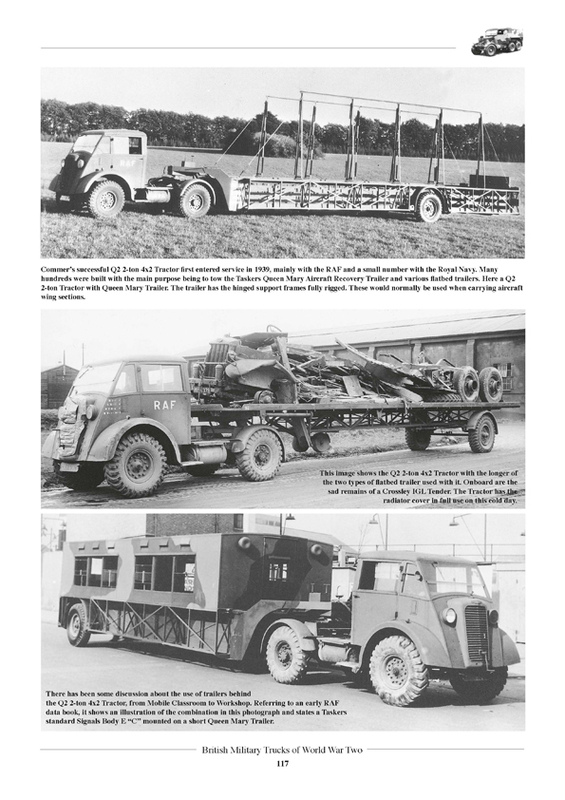 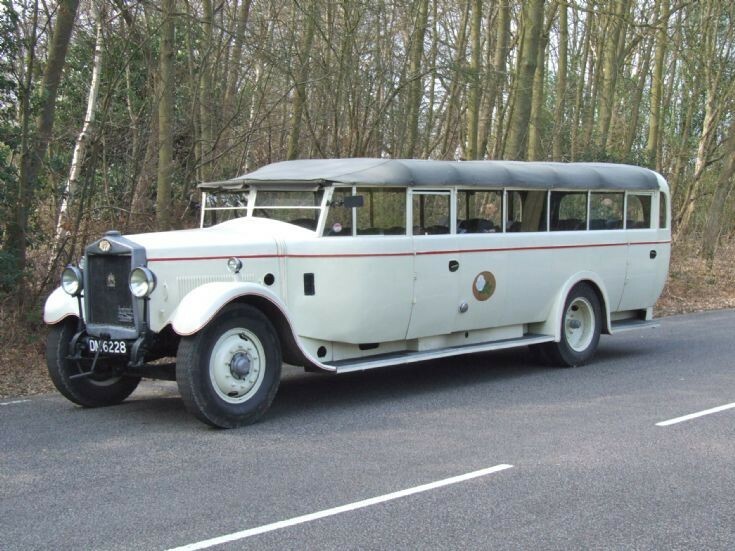 He then bought an interchangeable charabanc body, manufactured by William Nicholson of Otley, to be fitted to his lorry for carrying passengers at weekends when there was little haulage work. 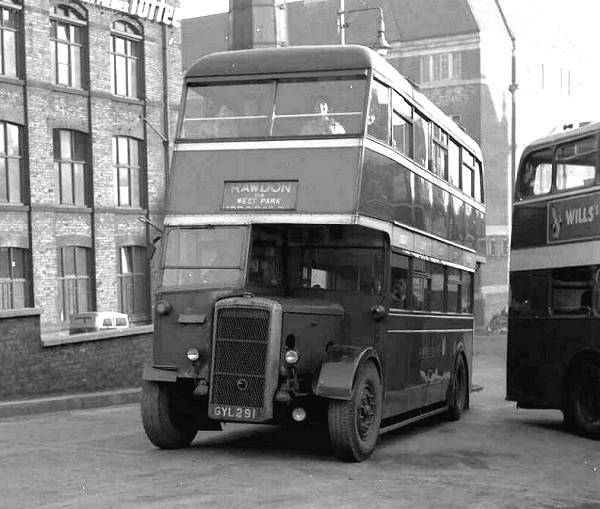 In 1913 he took over Bridge Garage in Leeds to service and repair his own, and others, vehicles. 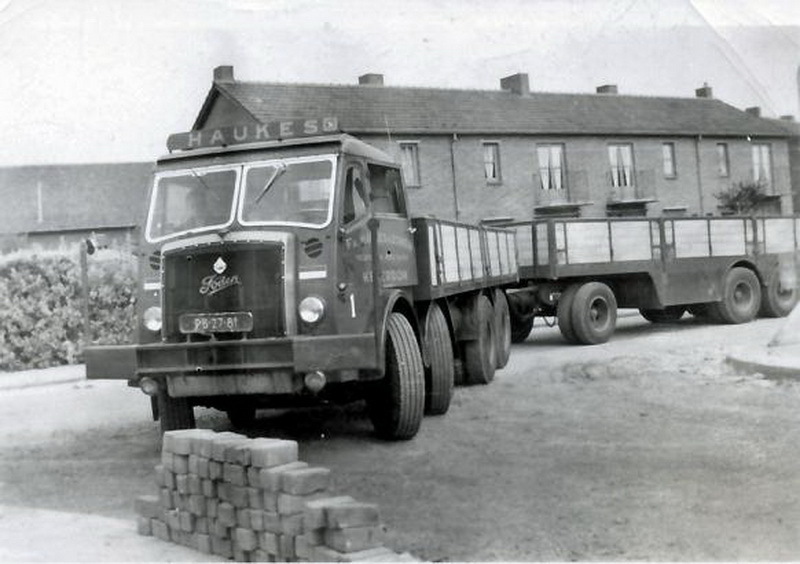 His other businesses included cattle dealing and farming, quarrying and gravel extraction. 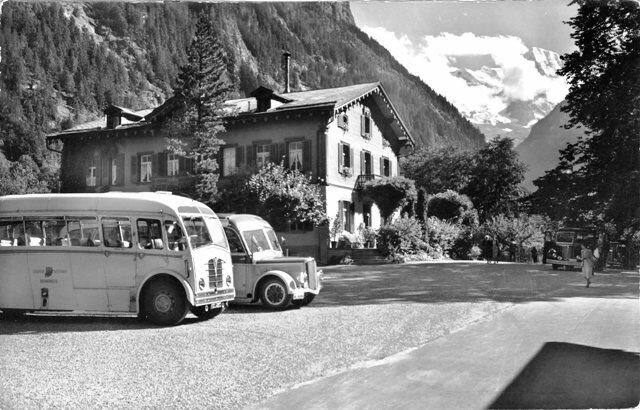 He also bought property around his hotel, which eventually provided space for his bus garage. 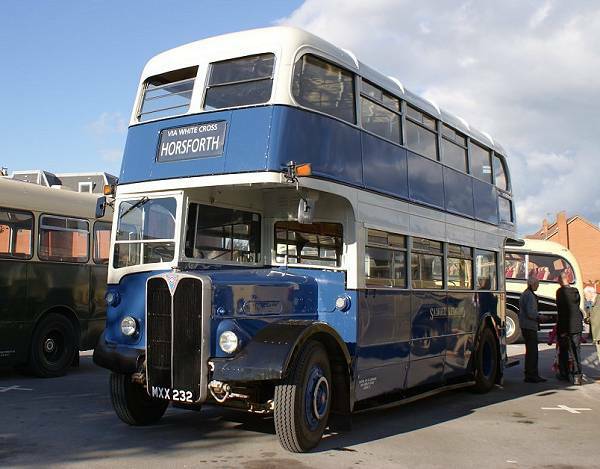 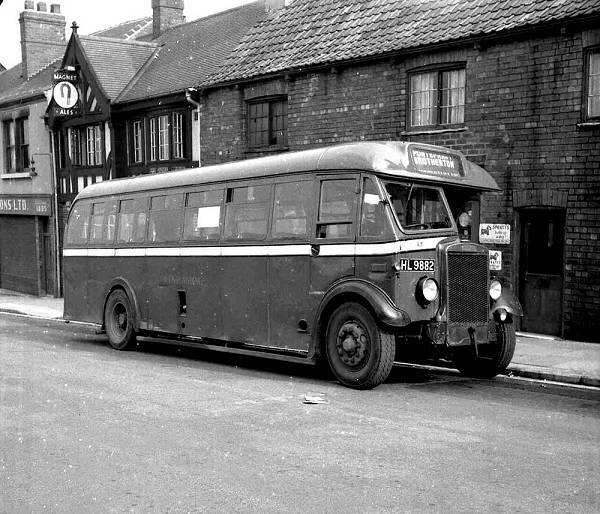 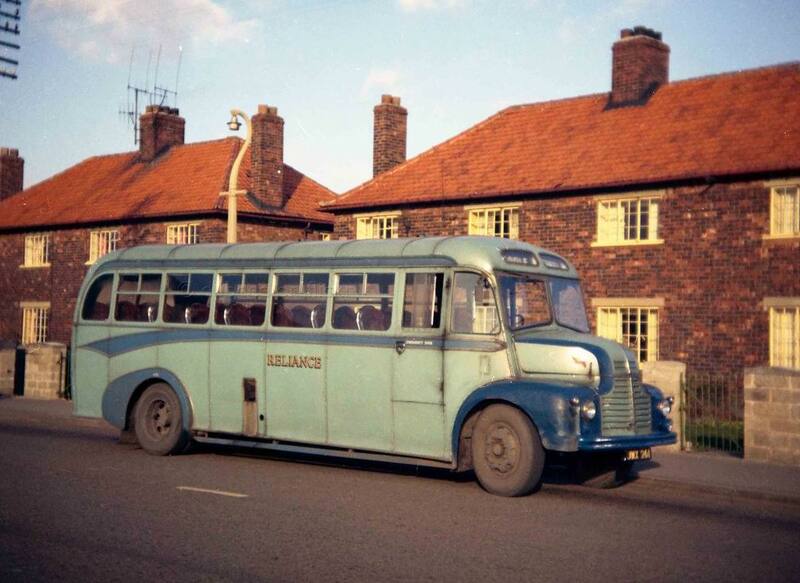 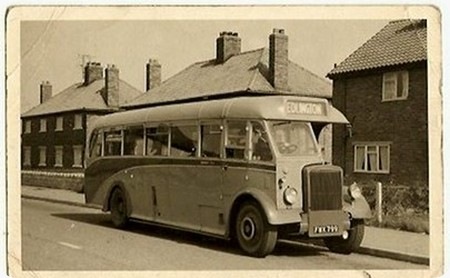 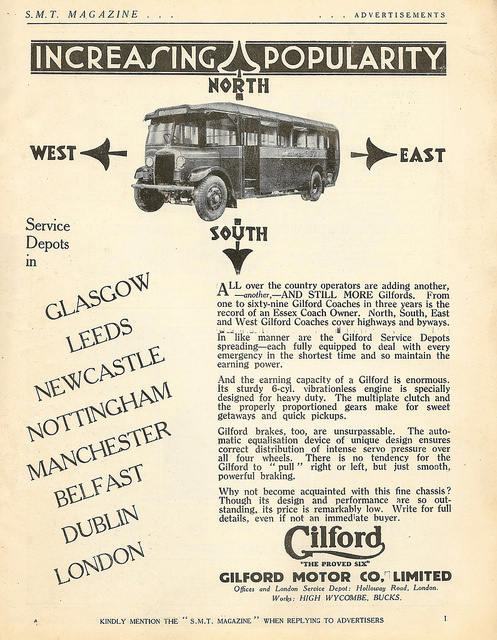 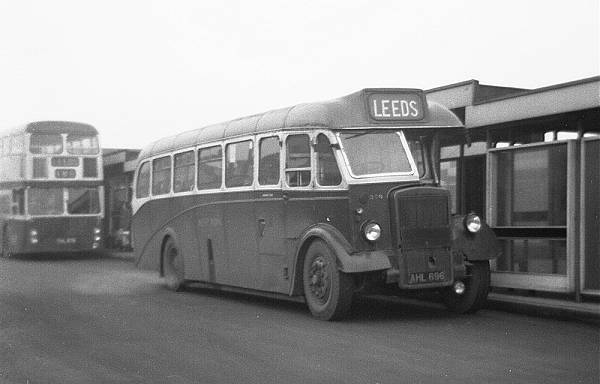 His move into bus service was in 1924 with a Horsforth to Leeds service. 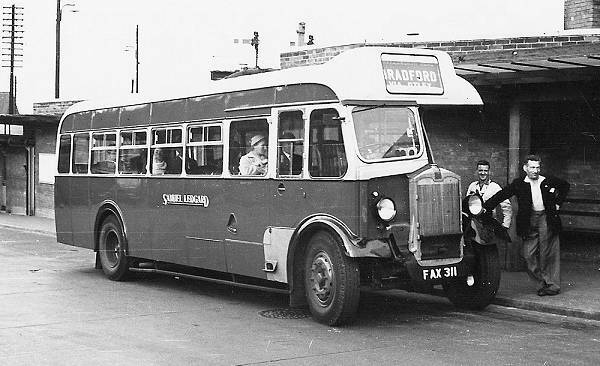 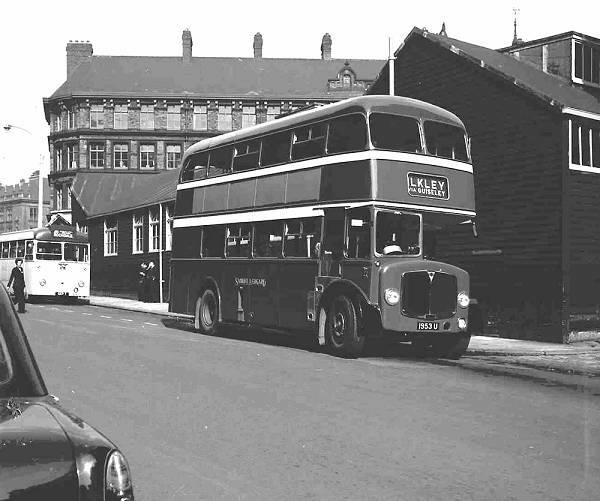 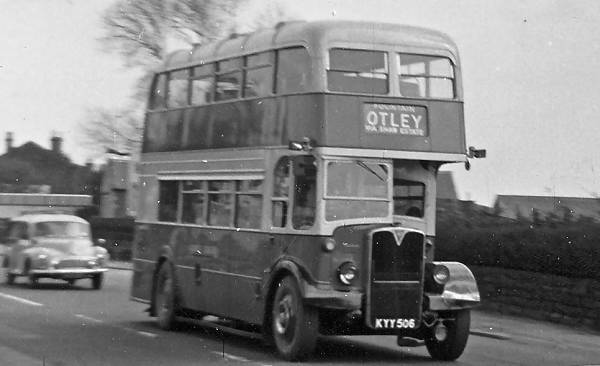 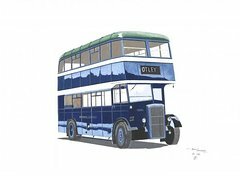 He expanded both organically and by taking over a number of other bus companies from 1924 to 1943, by which time Samuel Ledgard buses were well established, operating from the main depot in Armley, and from other depots in Otley, Yeadon, Ilkley and Bradford. 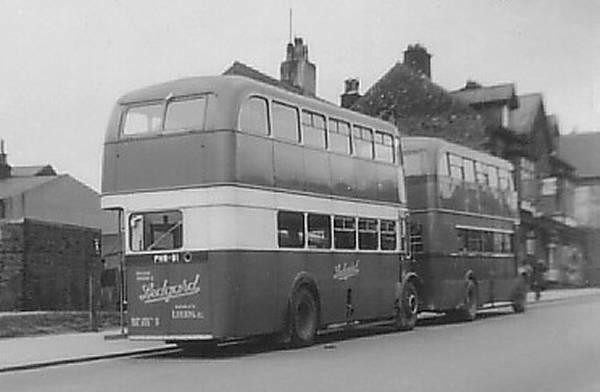 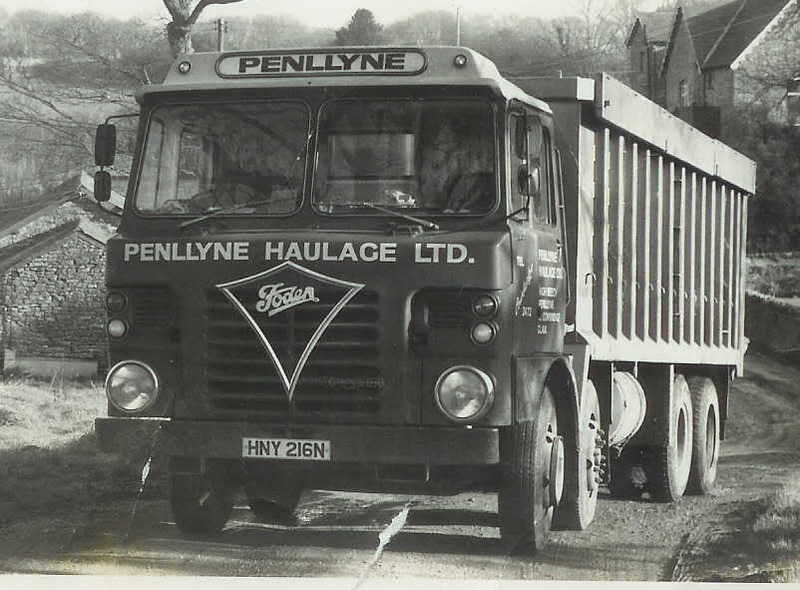 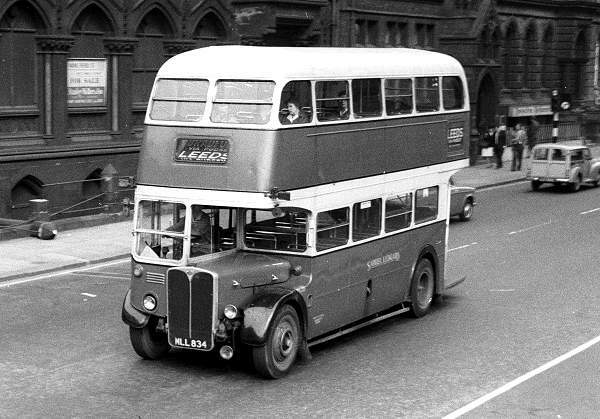 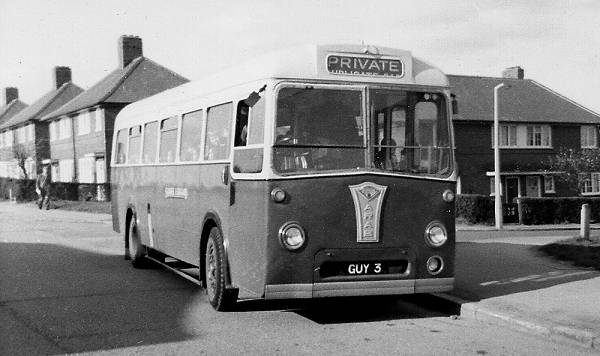 The Ledgard fleet was predominantly Leyland and the last buses ordered by Samuel Ledgard were three Leyland Titan PD2/12s. 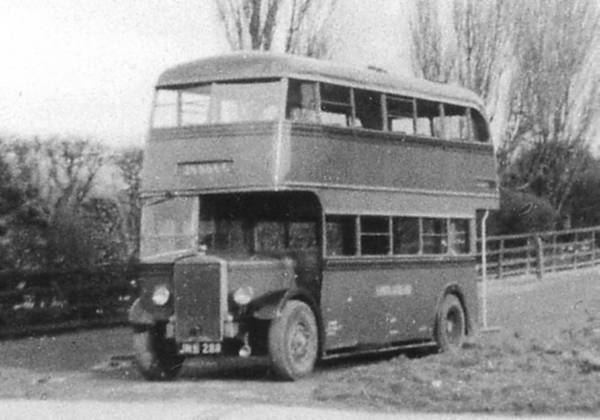 These entered service a mere month before he died in April 1952. 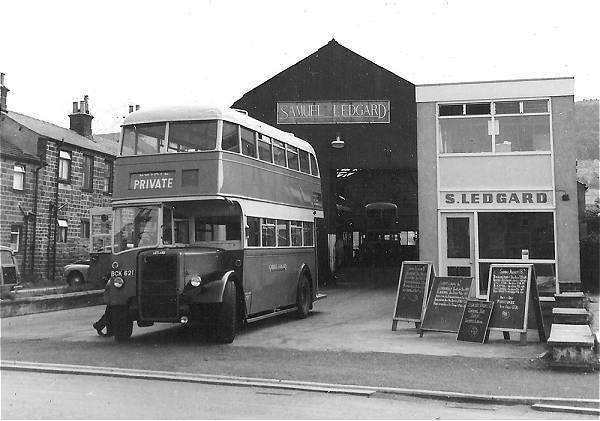 Samuel Ledgard’s estate totalled £129,491. 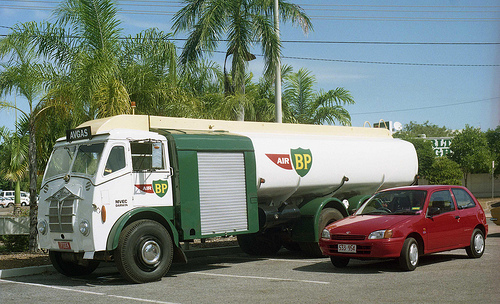 As the company was still owned by him, it formed part of his personal assets. 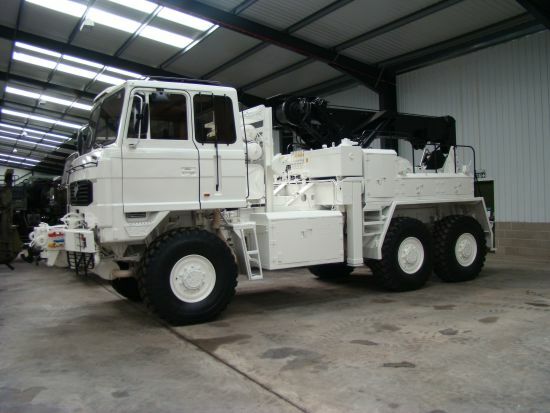 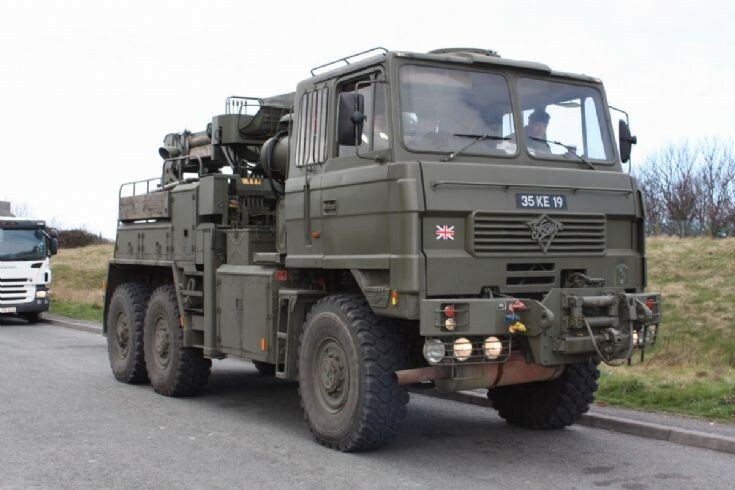 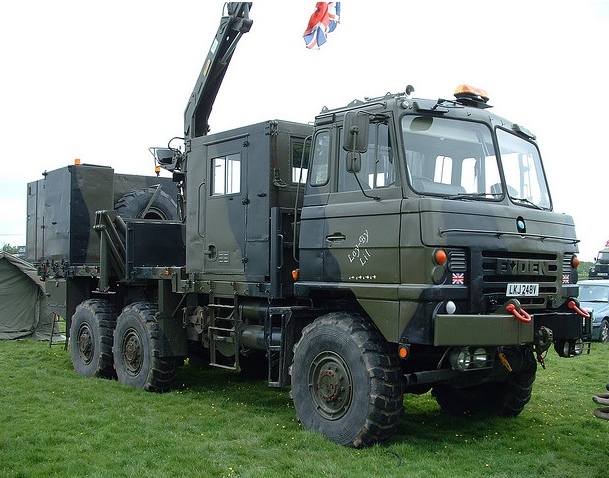 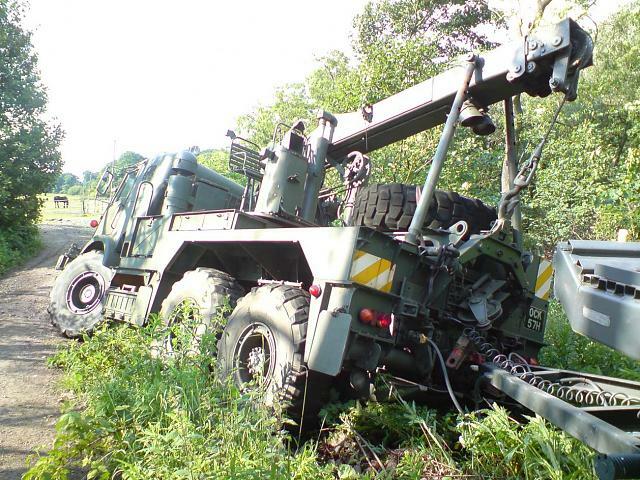 The death duties on this amounted to £29,883, which threatened the continuance of the business and meant that, when looking to update the fleet, the executors had to look to the second-hand market. 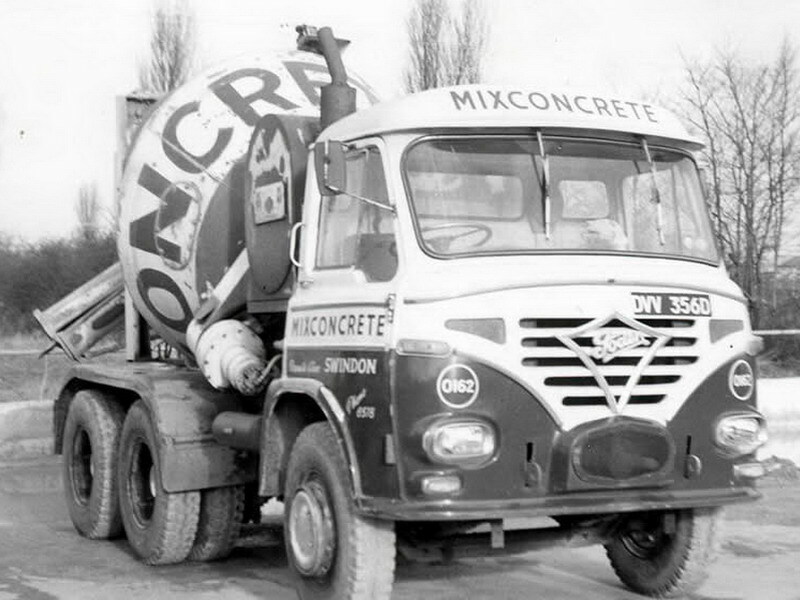 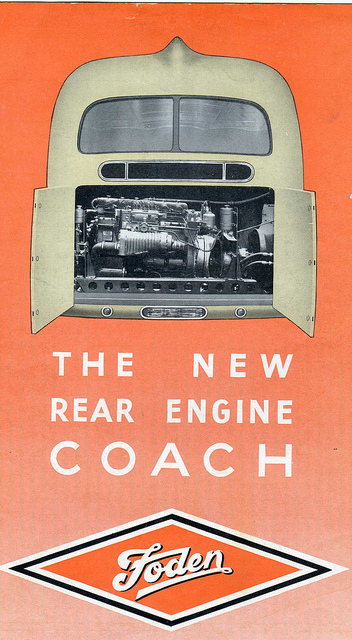 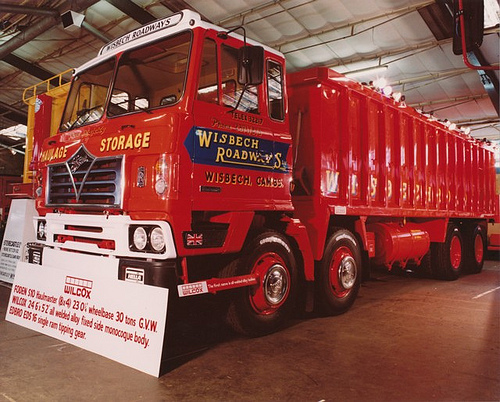 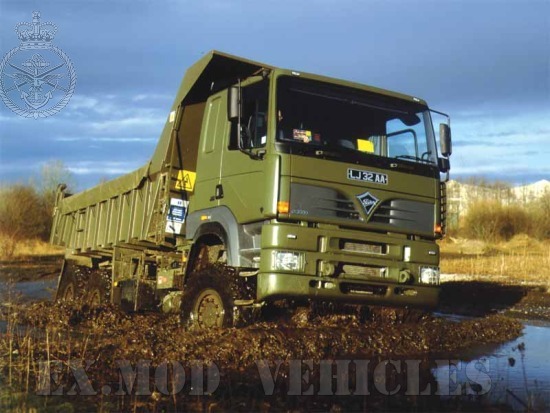 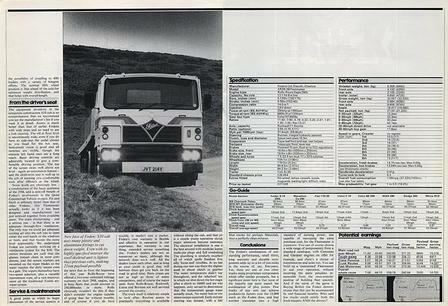 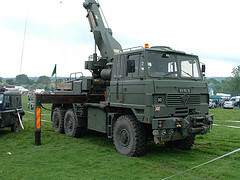 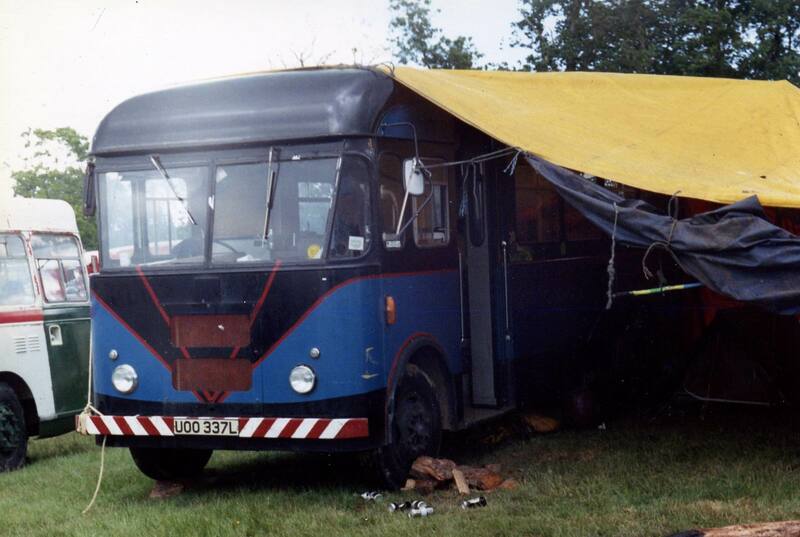 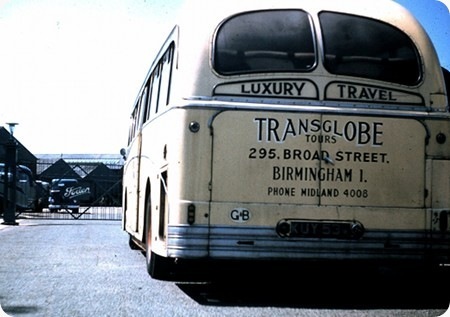 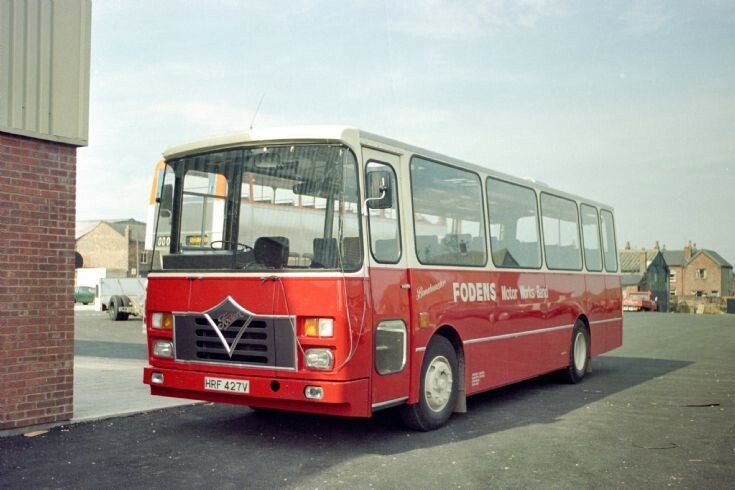 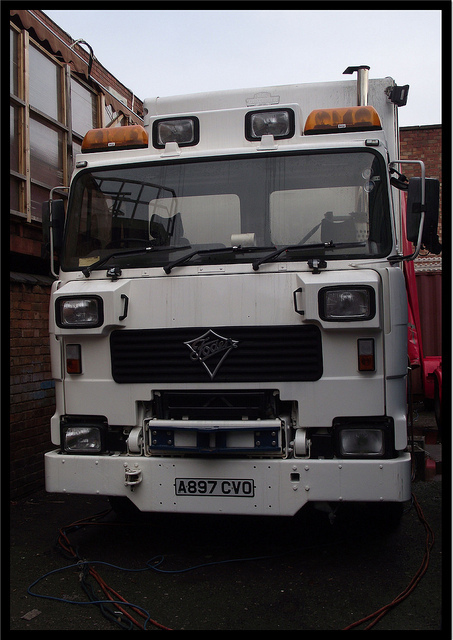 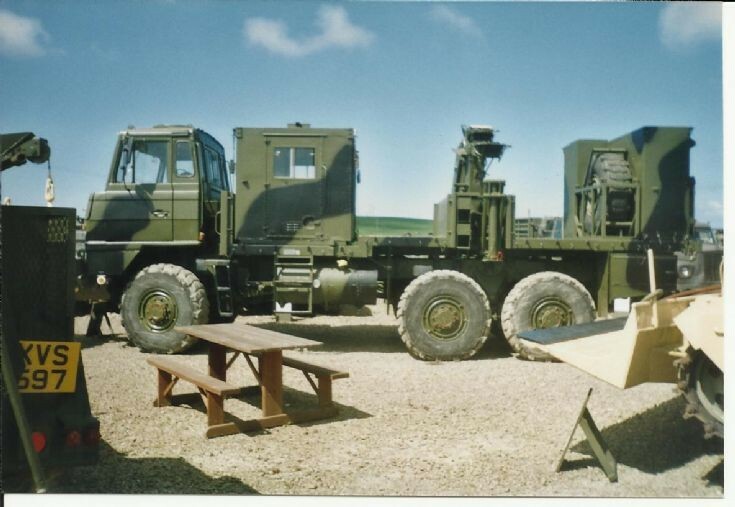 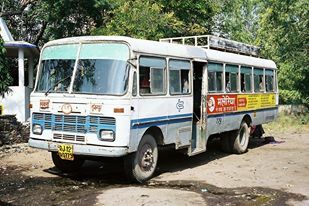 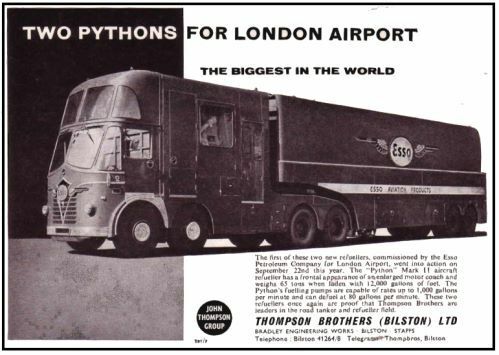 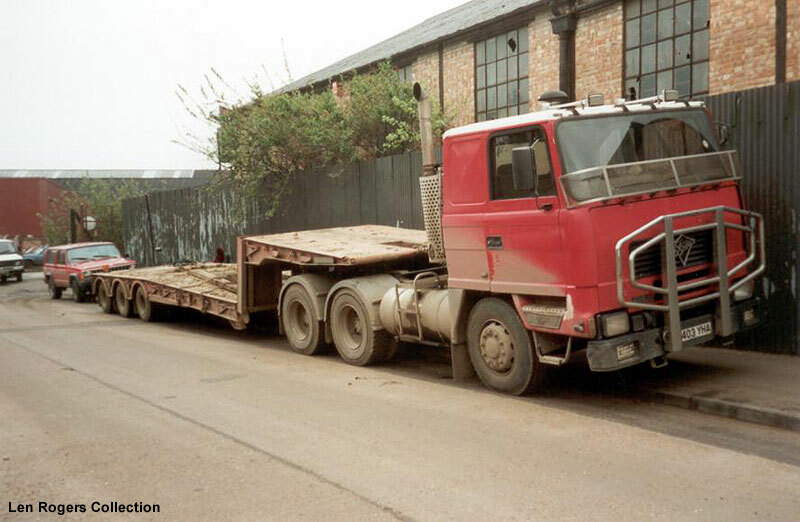 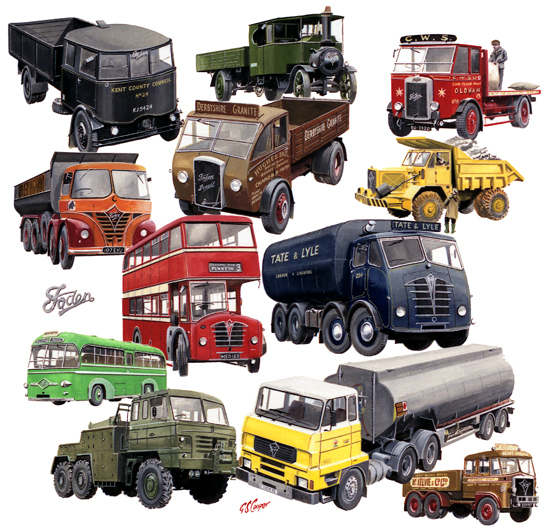 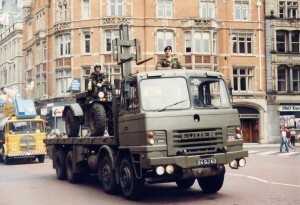 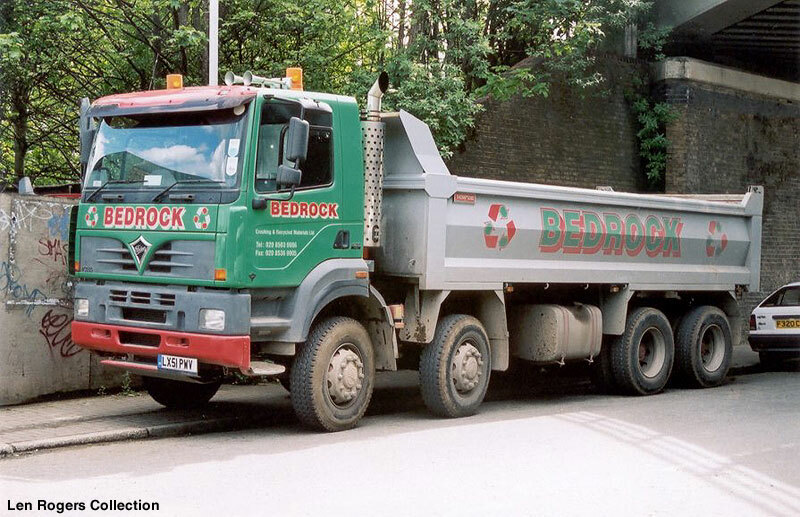 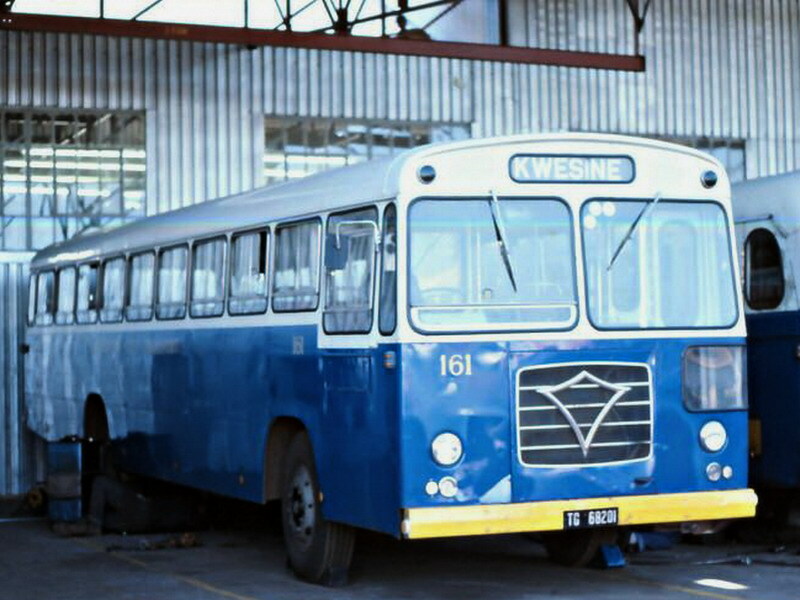 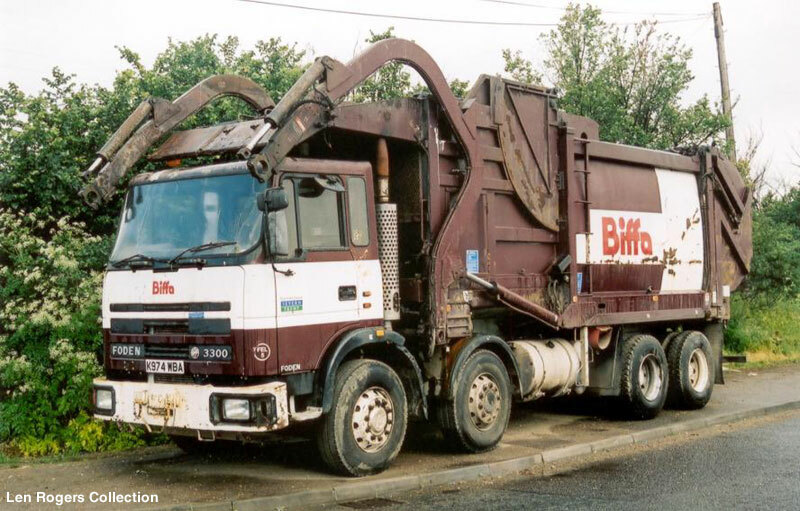 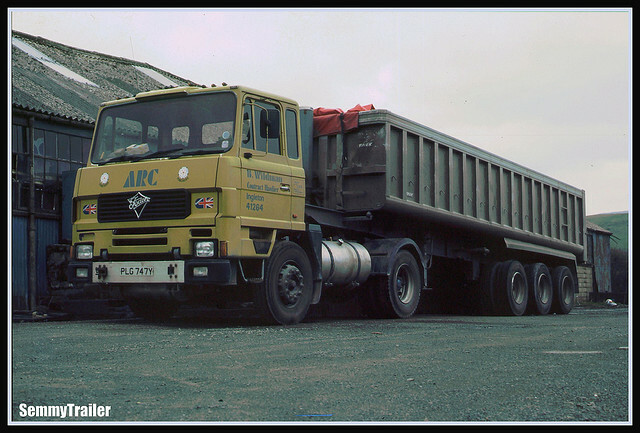 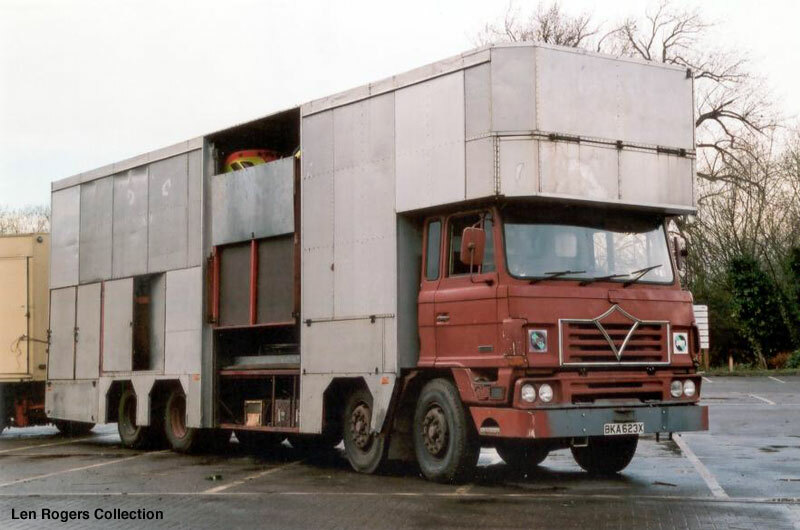 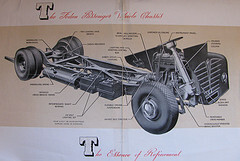 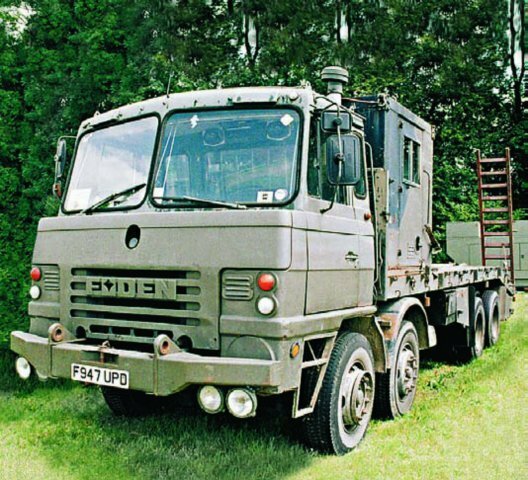 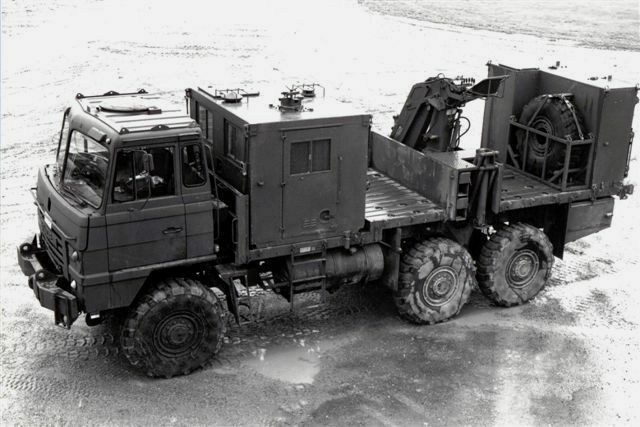 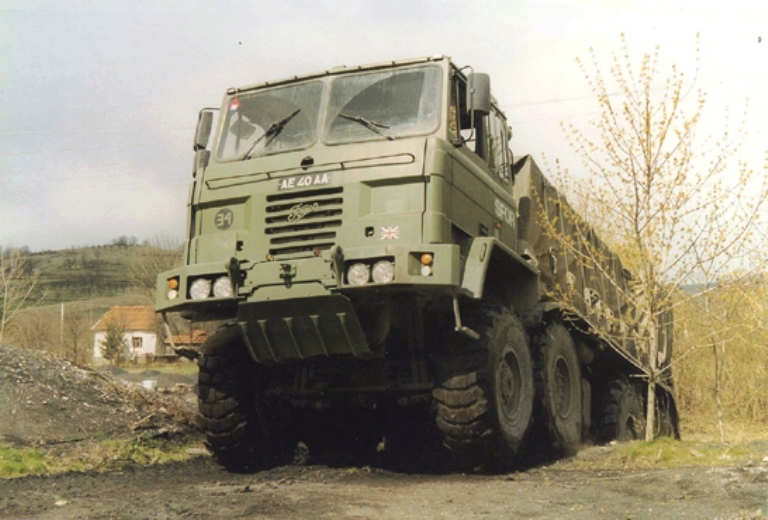 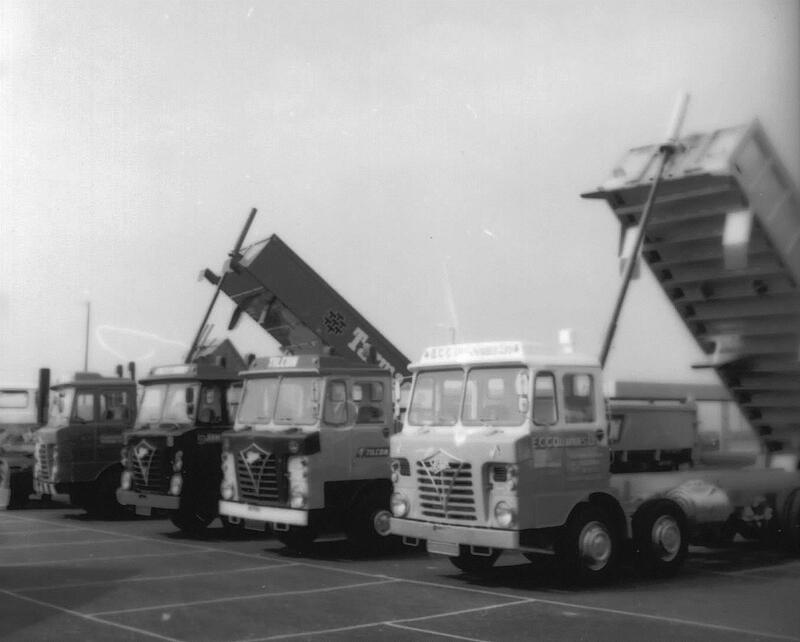 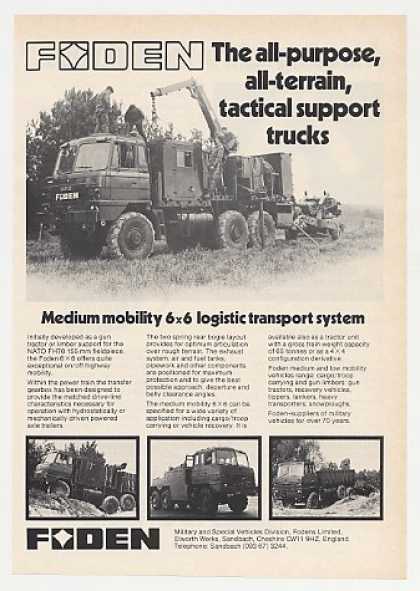 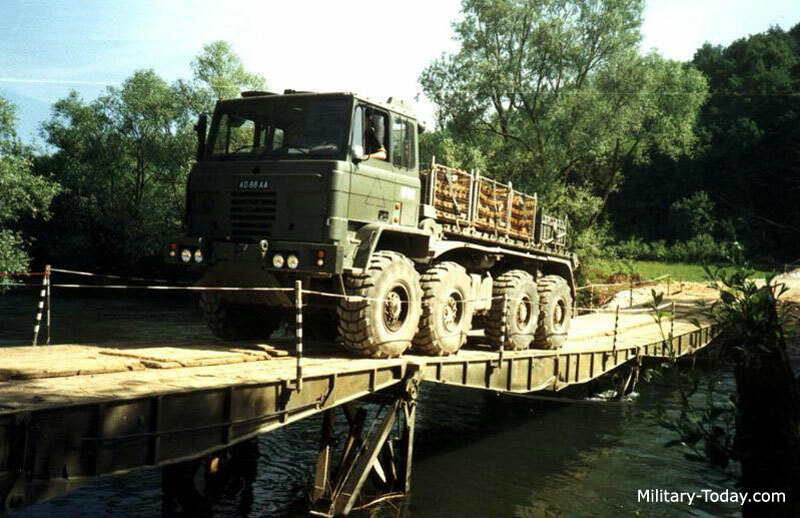 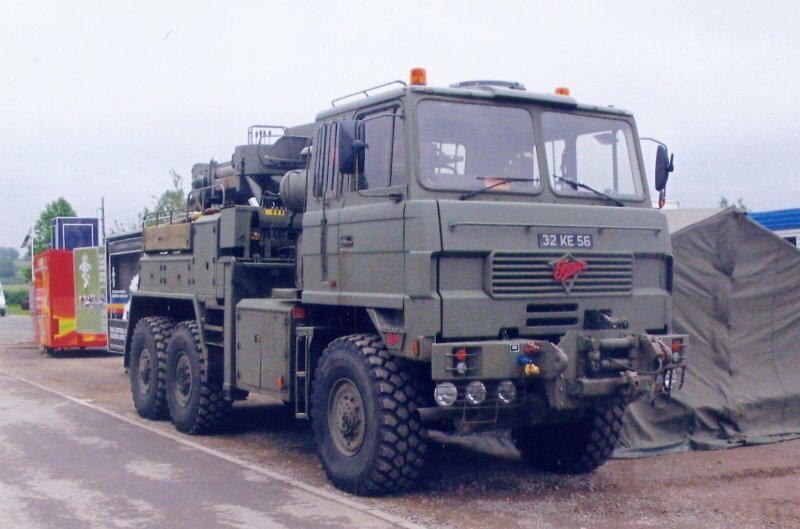 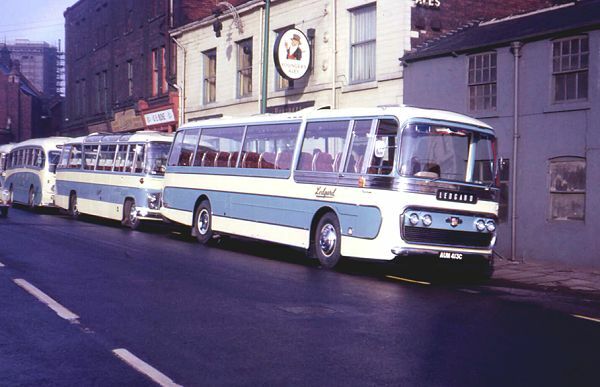 This strategy resulted a wide range of vehicles from various manufacturers entering service, including buses from: AEC, Albion, Bristol, Daimler and Leyland. 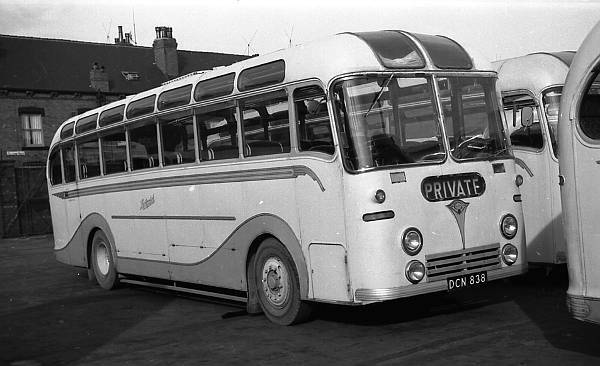 A significant influx was 23 ex-London Transport ‘austerity’ Daimler CWA6’s with Park Royal bodywork during 1953-1954, 22 of which went into service unmodified, save for platform doors being fitted. 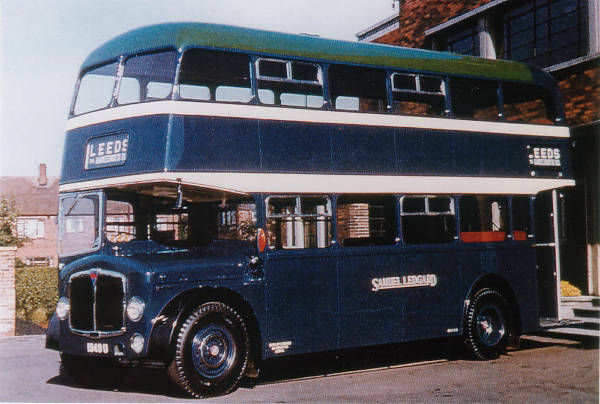 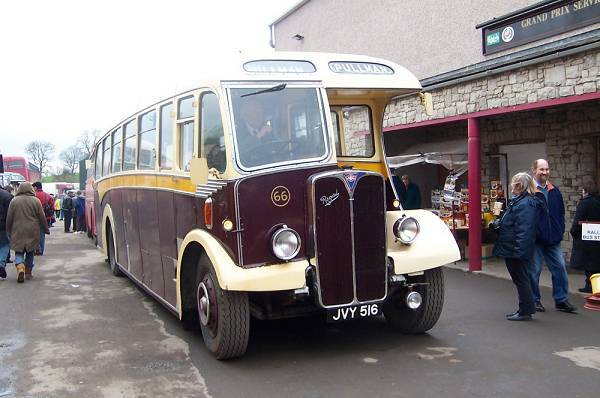 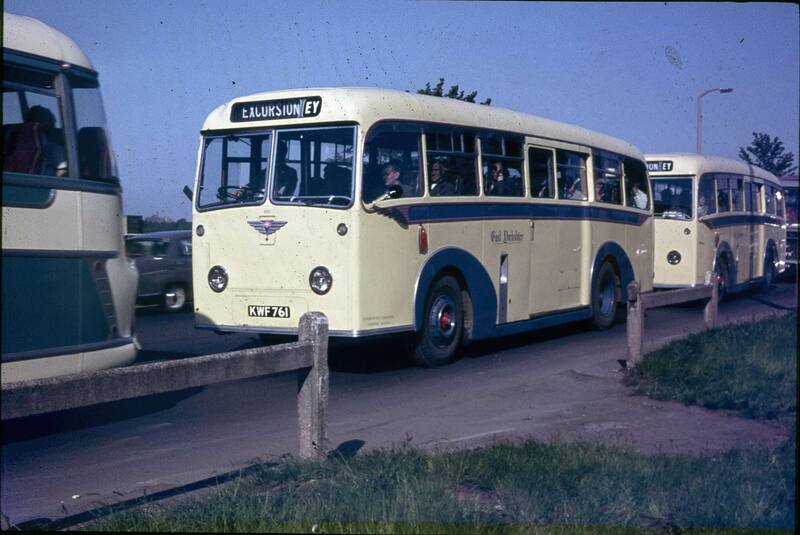 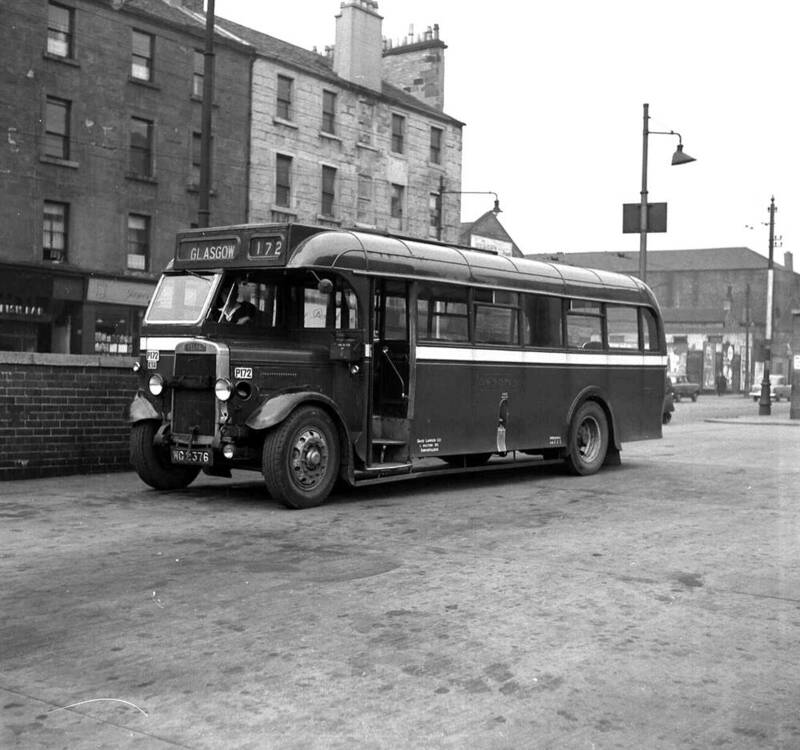 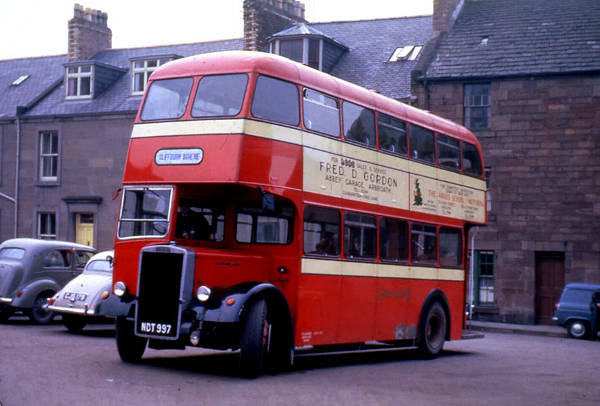 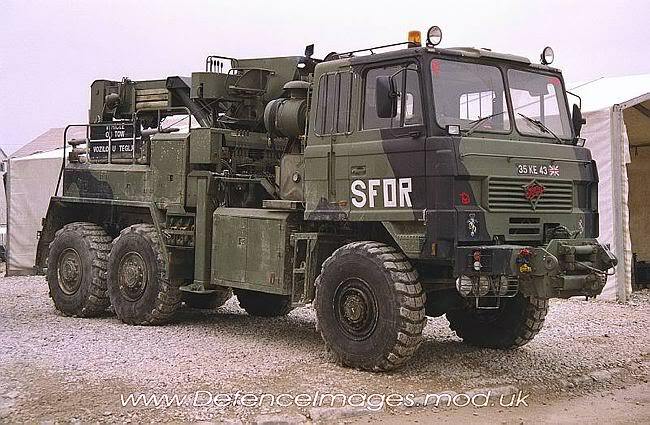 They gave stirling service until the last one was withdrawn in 1962. 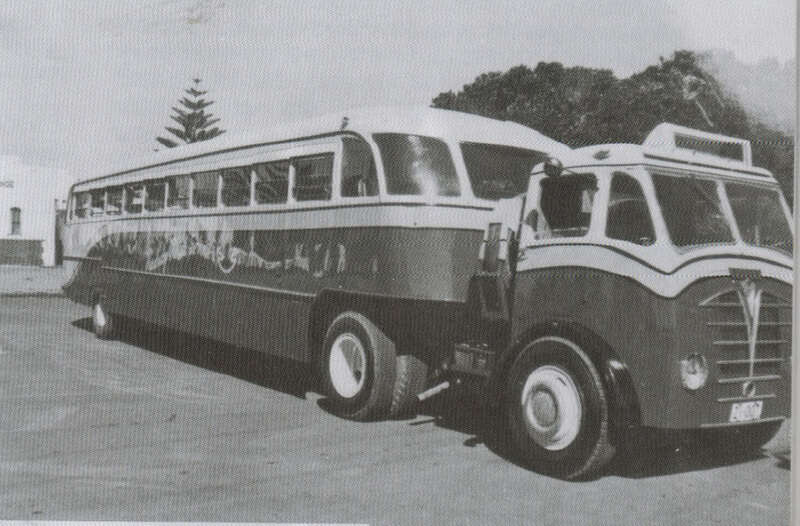 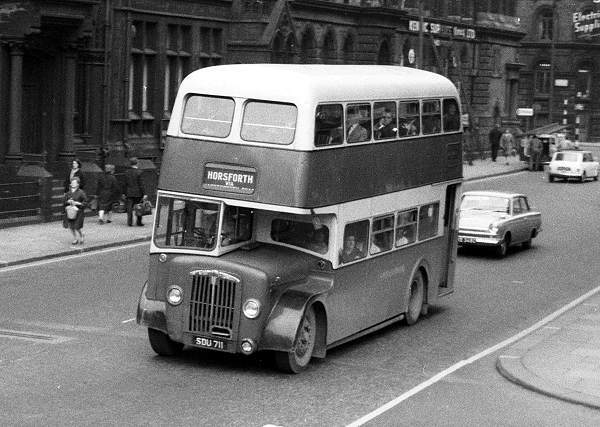 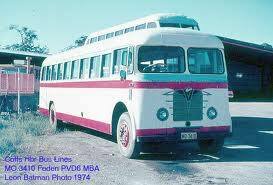 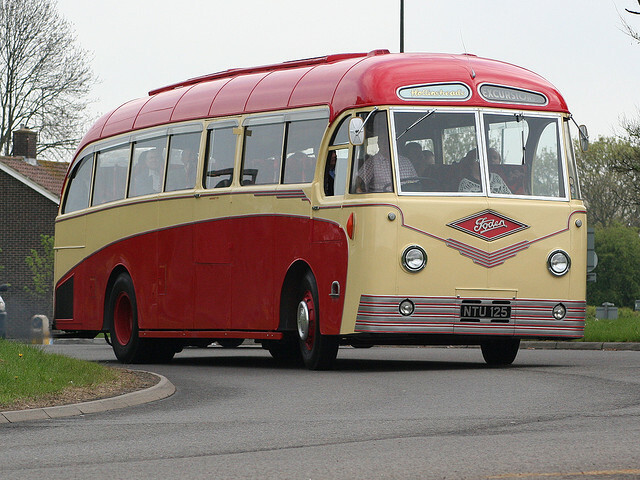 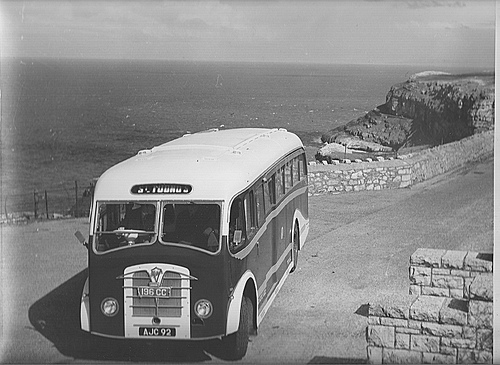 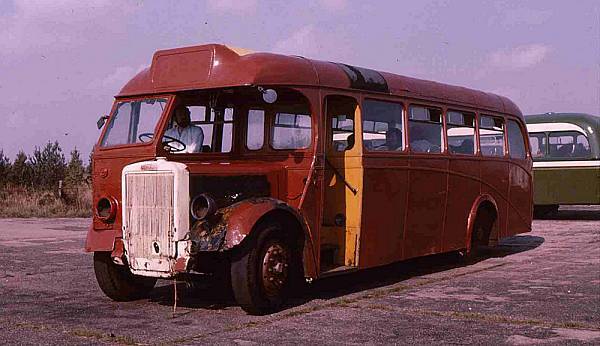 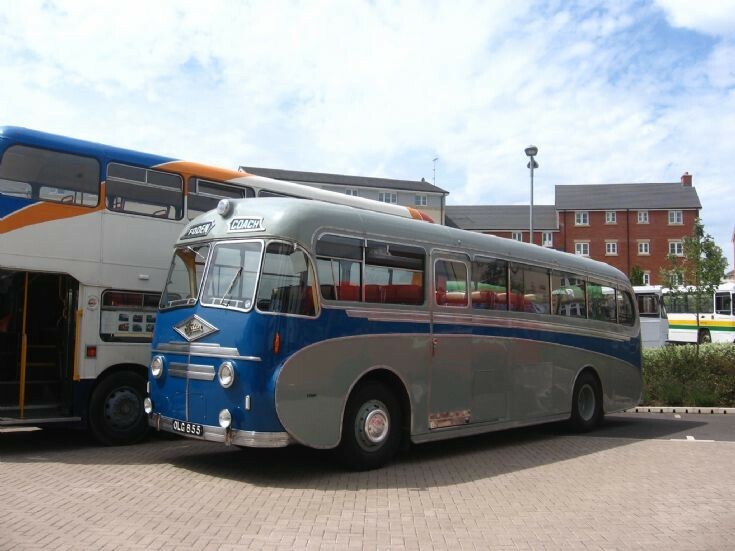 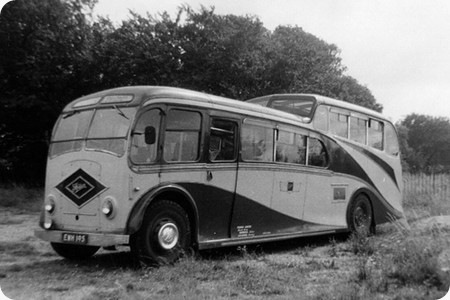 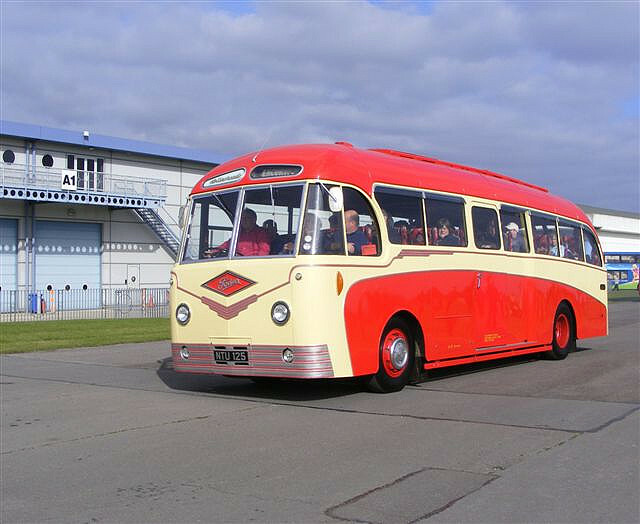 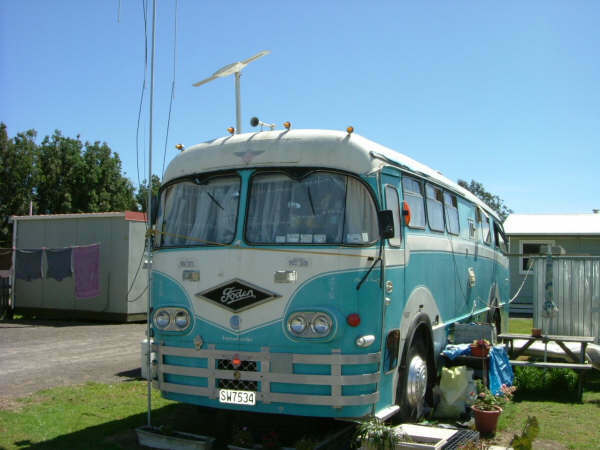 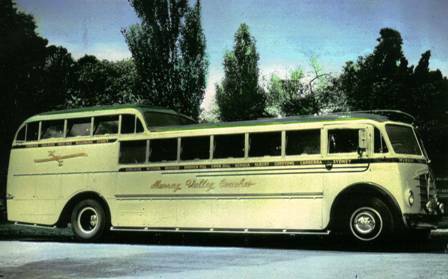 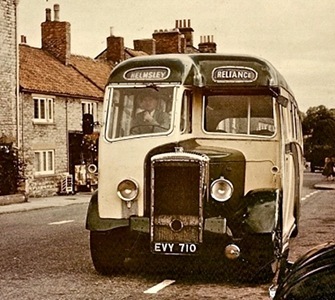 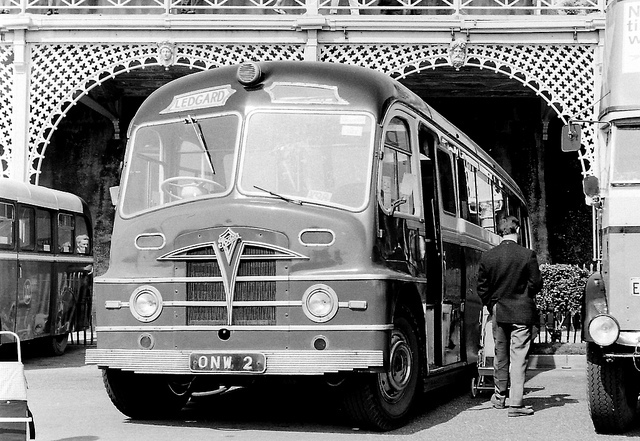 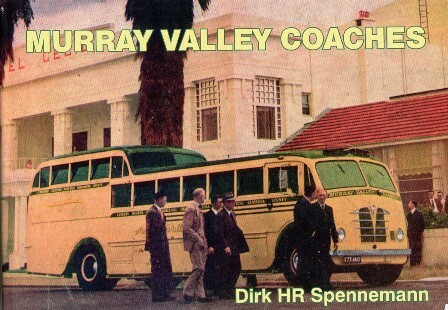 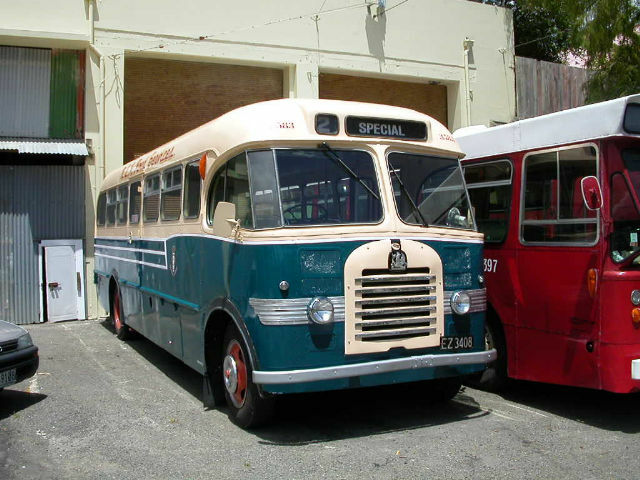 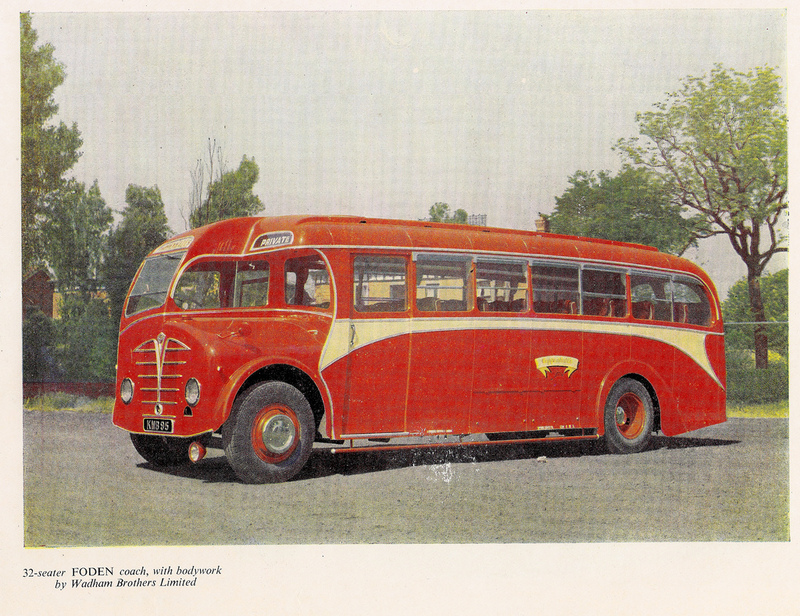 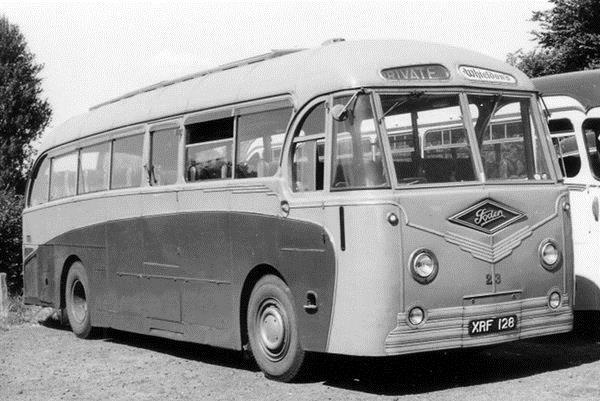 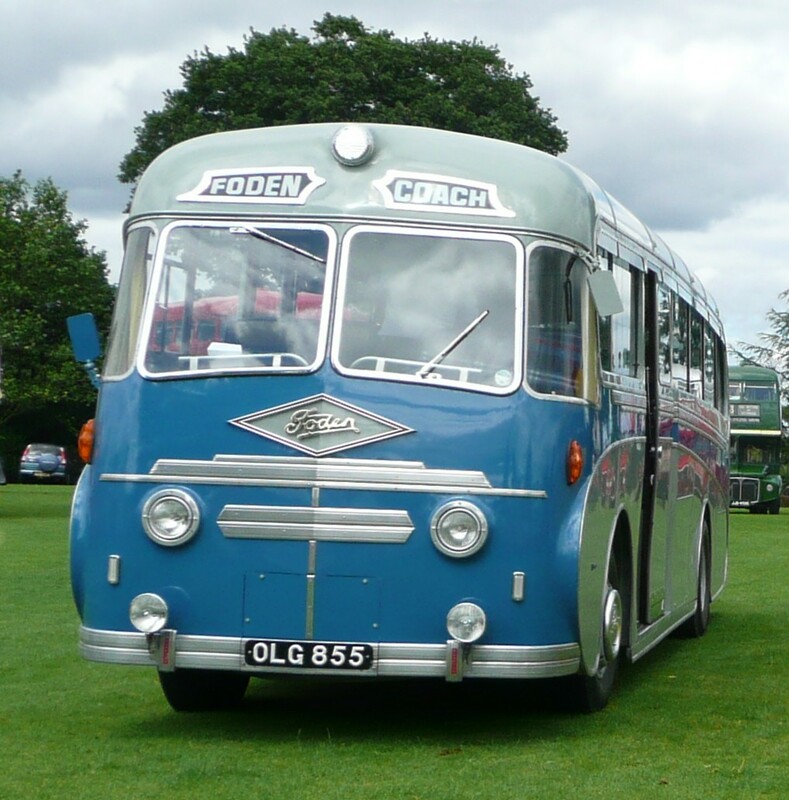 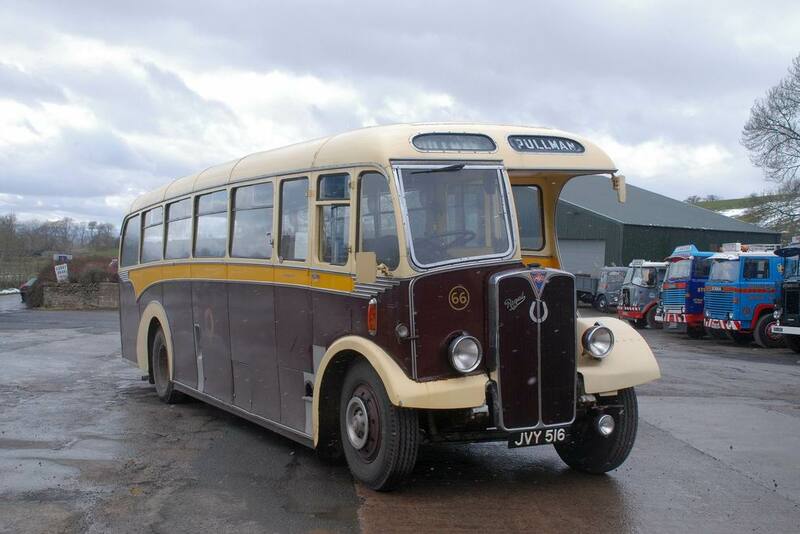 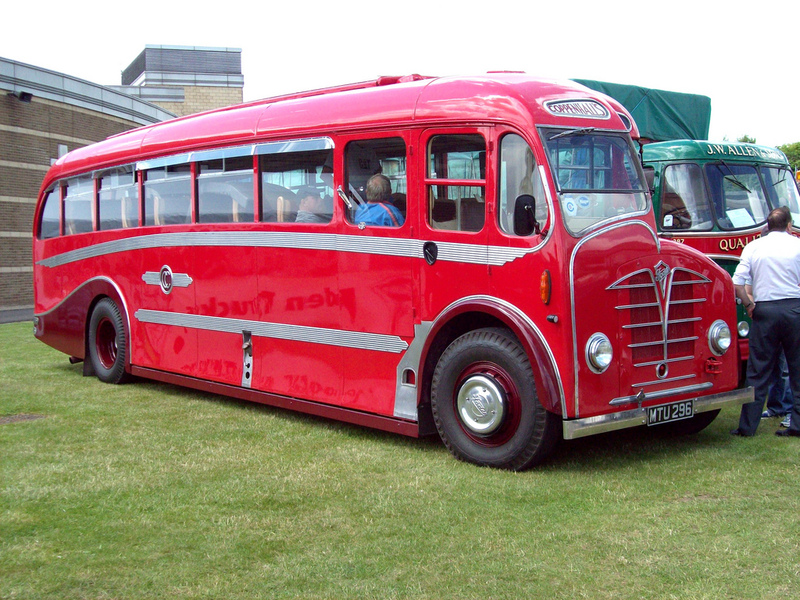 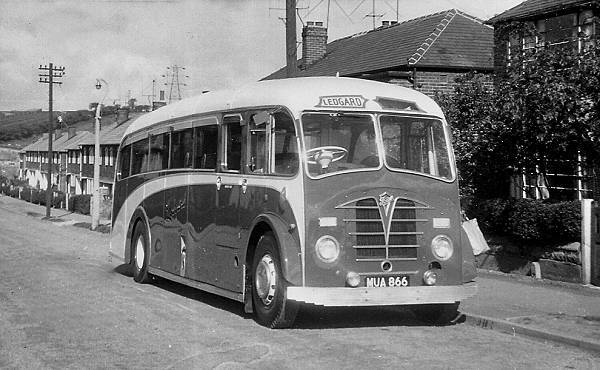 However, one notable exception to the second-hand purchases, was six new AEC Regent V buses with Roe bodywork which were delivered in 1957. 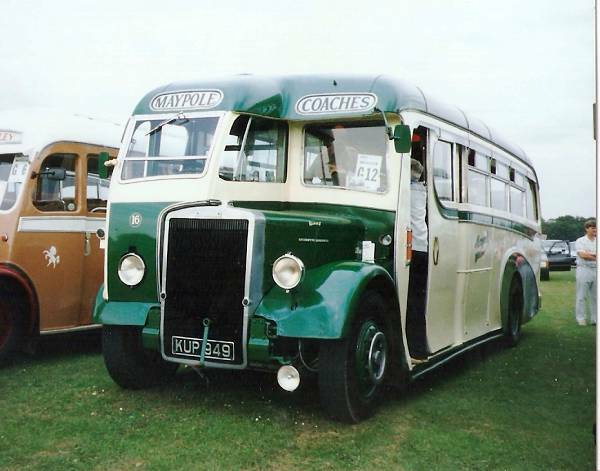 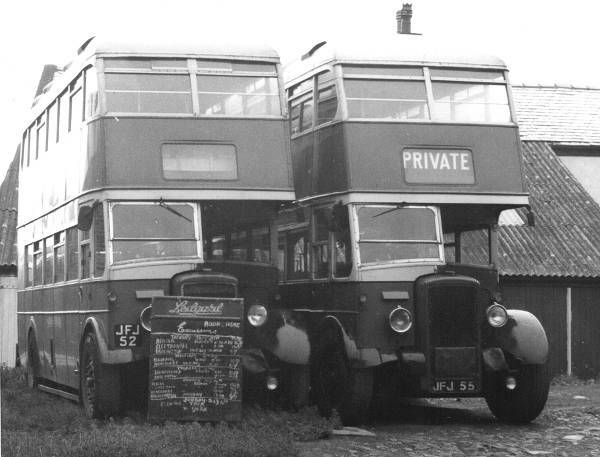 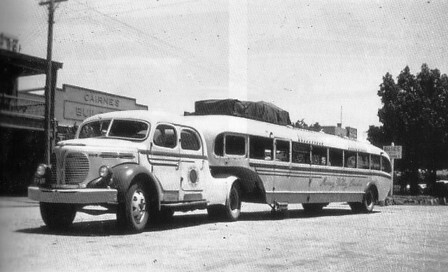 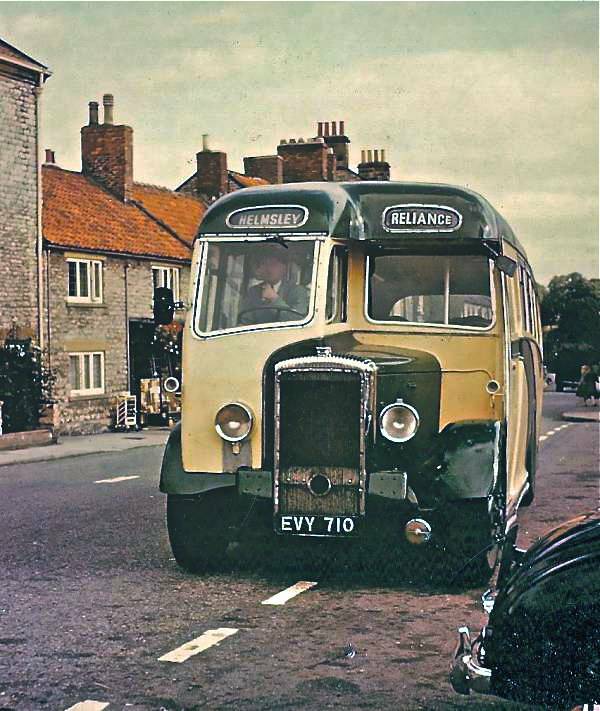 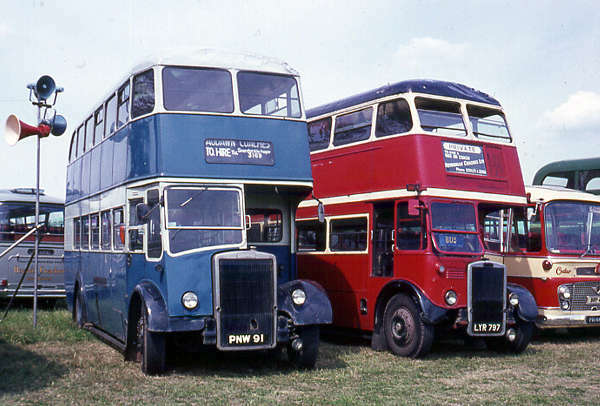 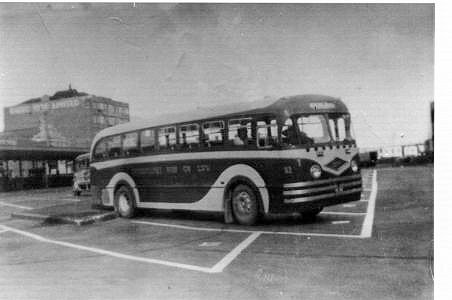 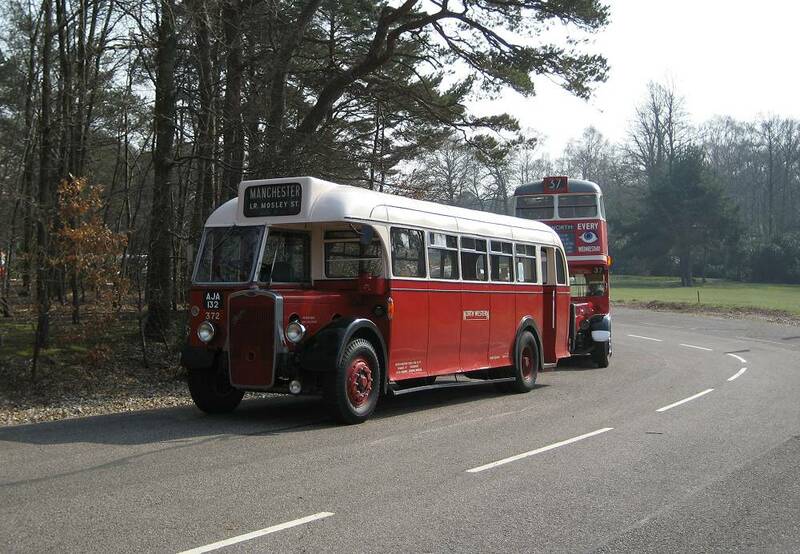 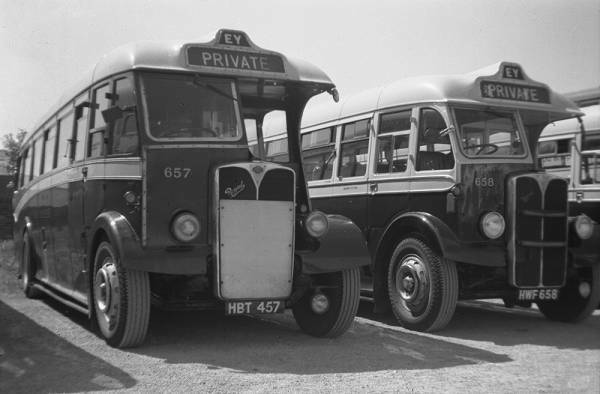 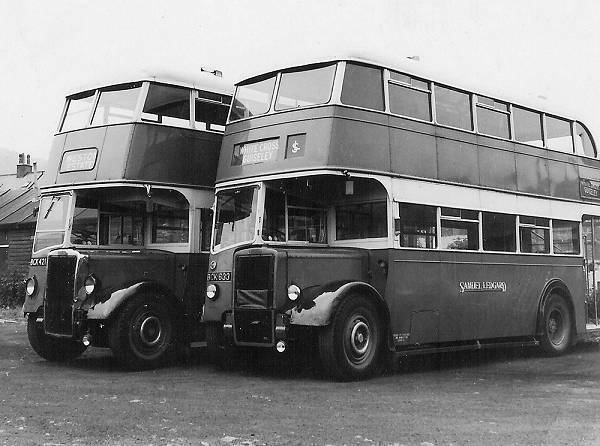 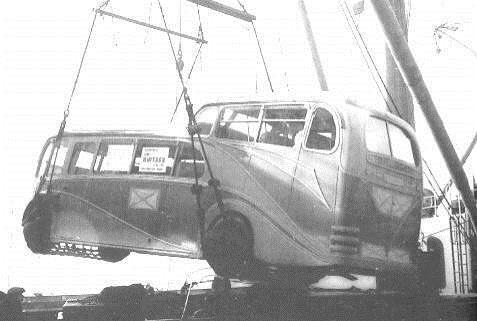 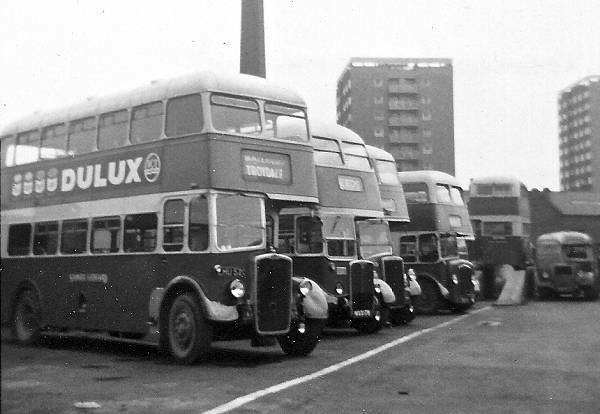 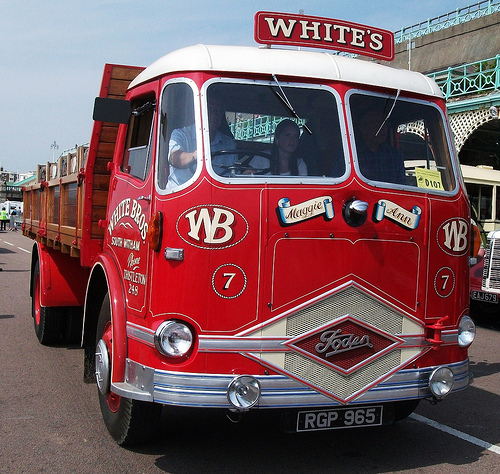 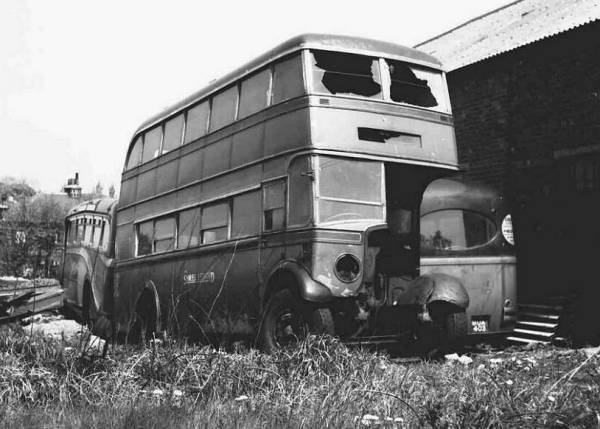 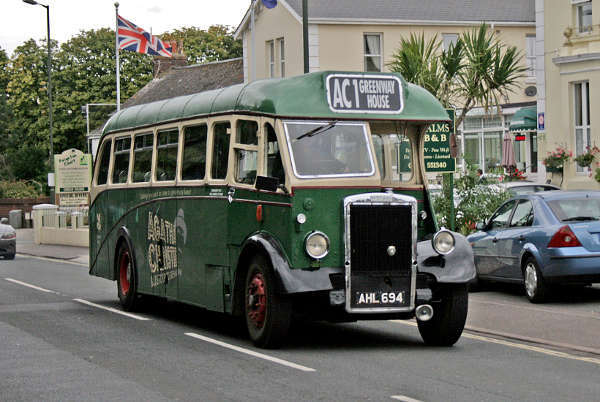 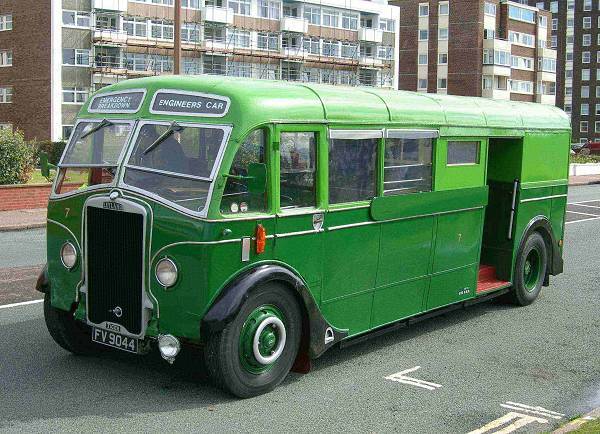 One of these buses was registered 1949U – a reversal of the registration on Samuel’s first petrol lorry, in 1912. 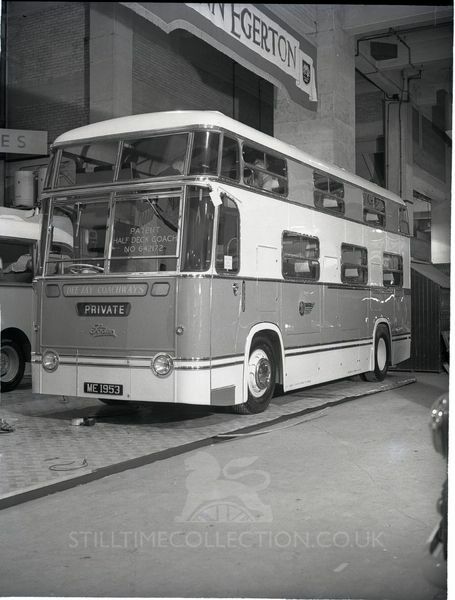 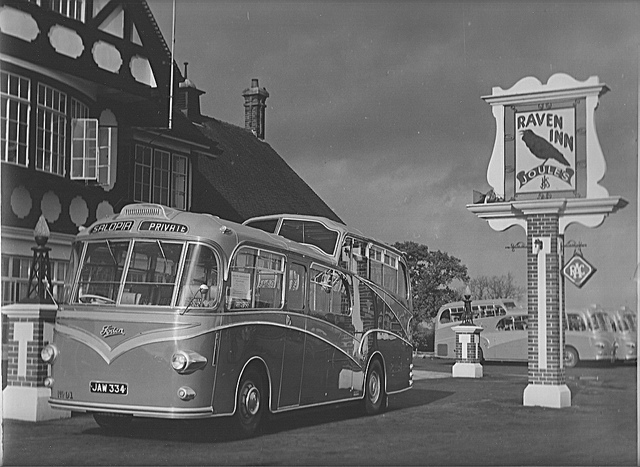 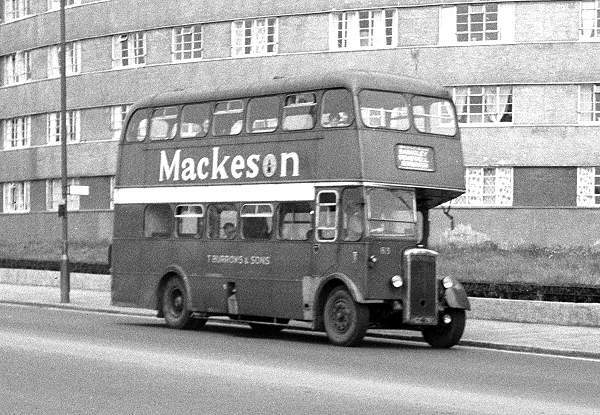 In an attempt to standardise such a diverse fleet, 1963 saw the first of many ex-London Transport RT-type AEC Regent III buses being purchased. 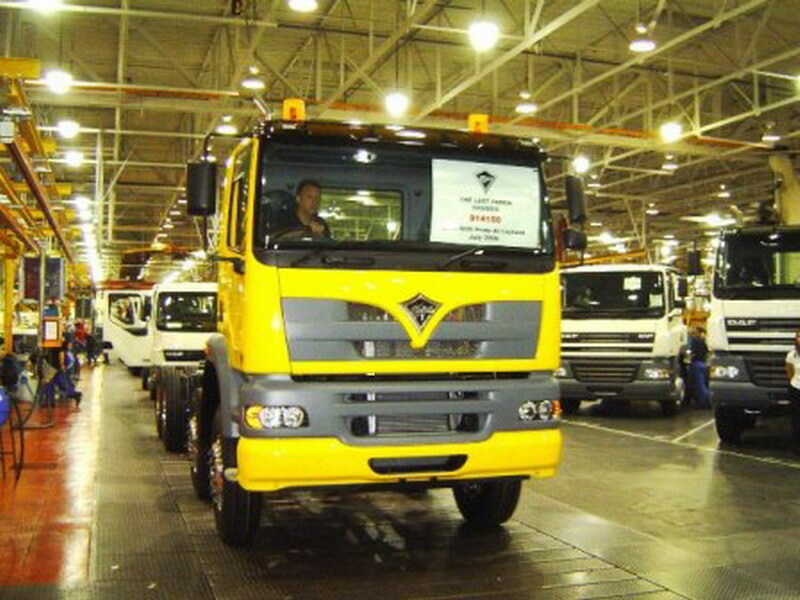 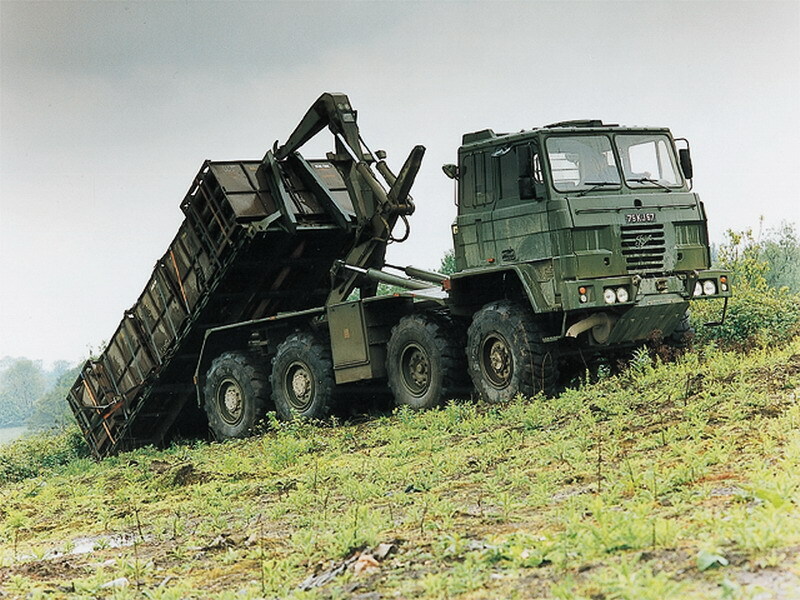 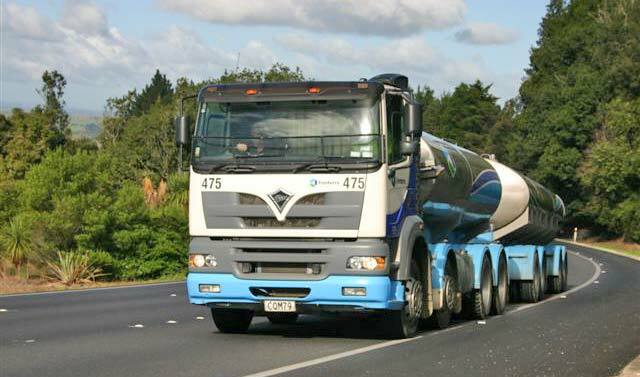 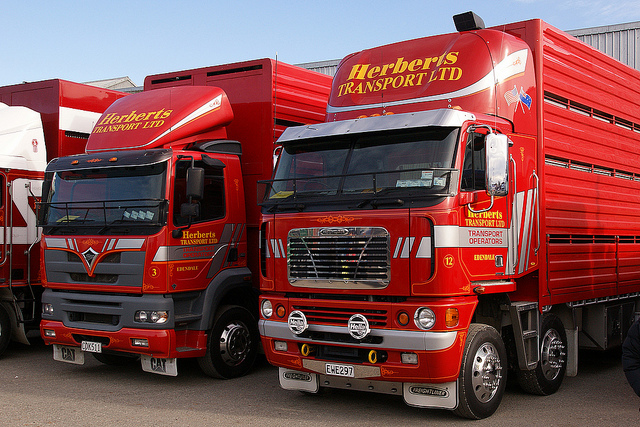 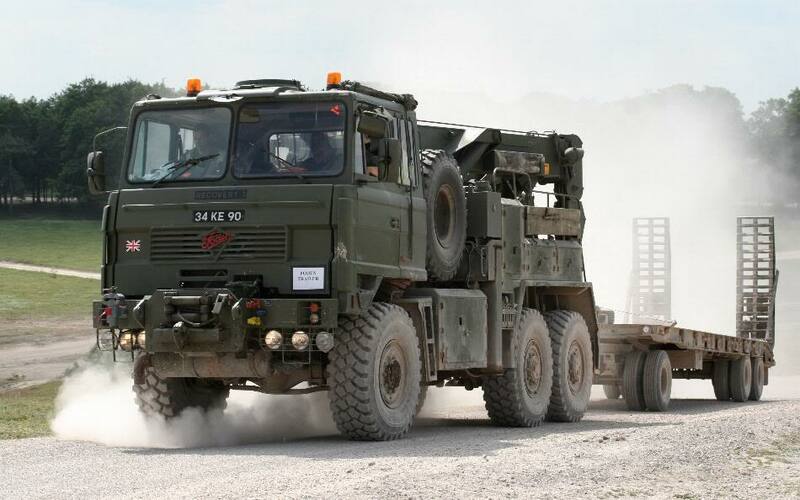 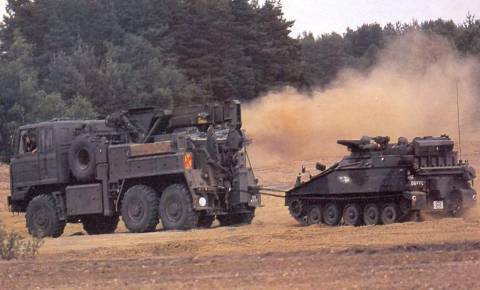 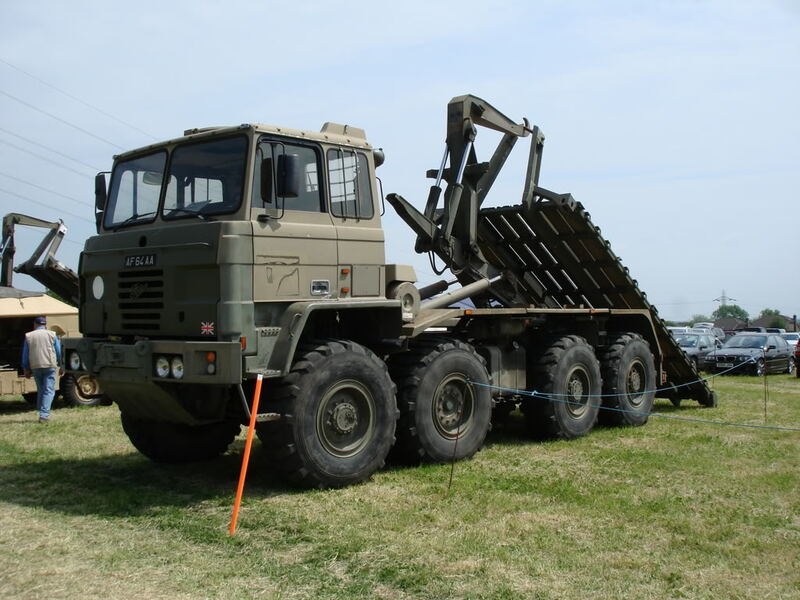 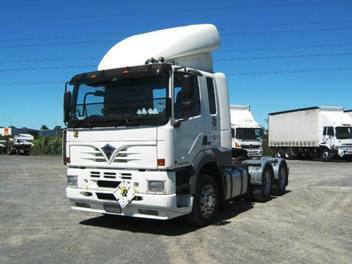 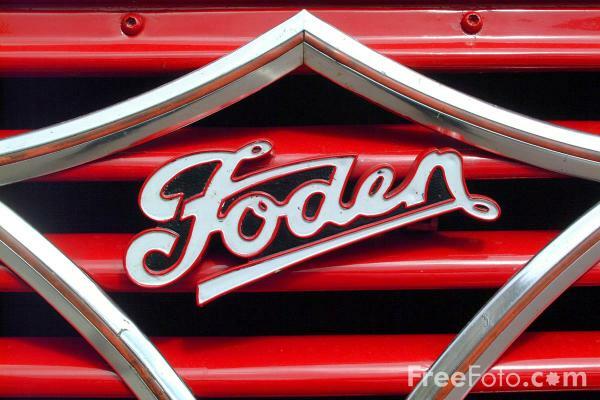 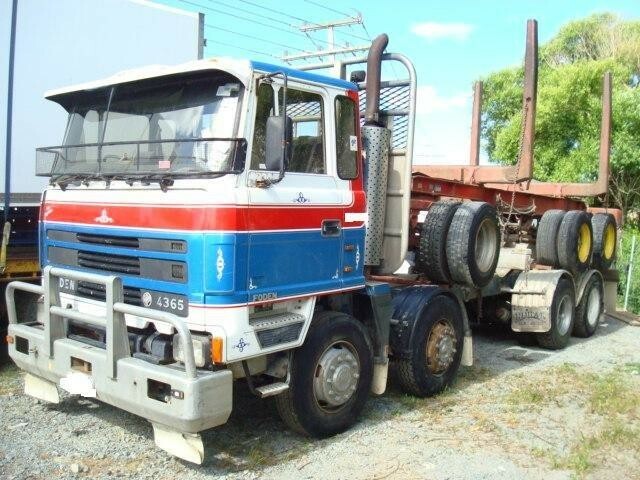 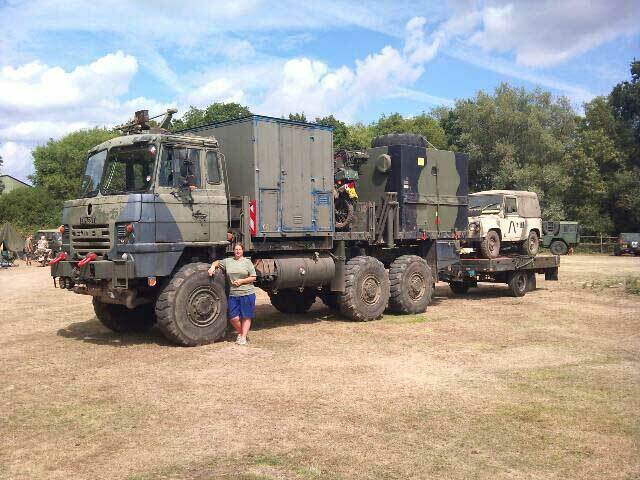 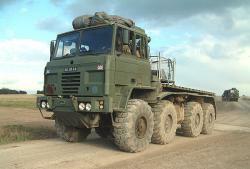 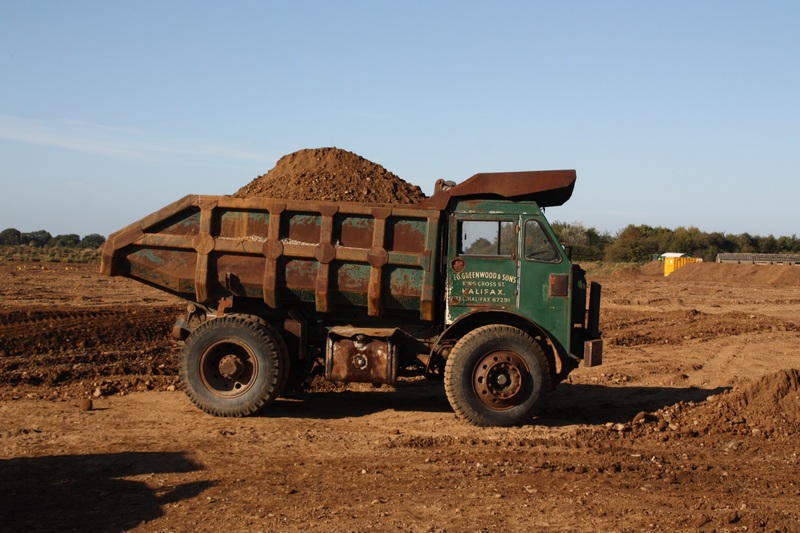 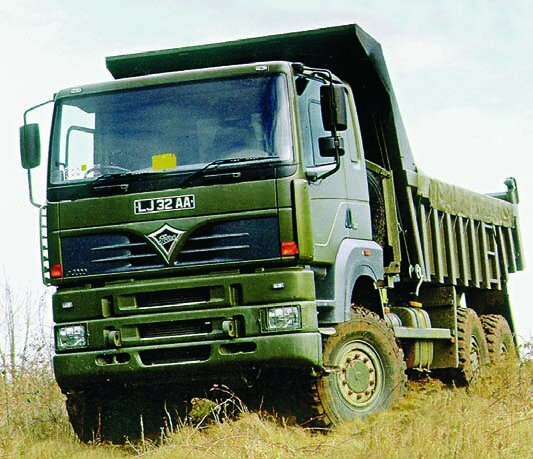 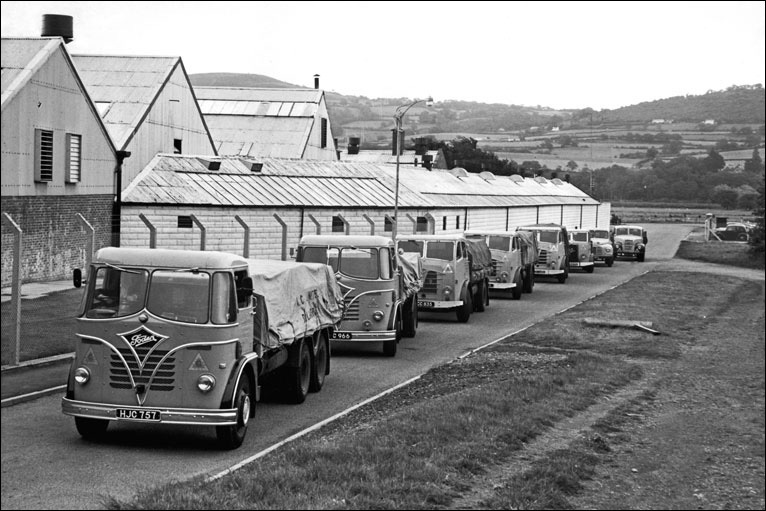 Over the next four and a half years, 34 of these vehicles entered the Ledgard fleet. 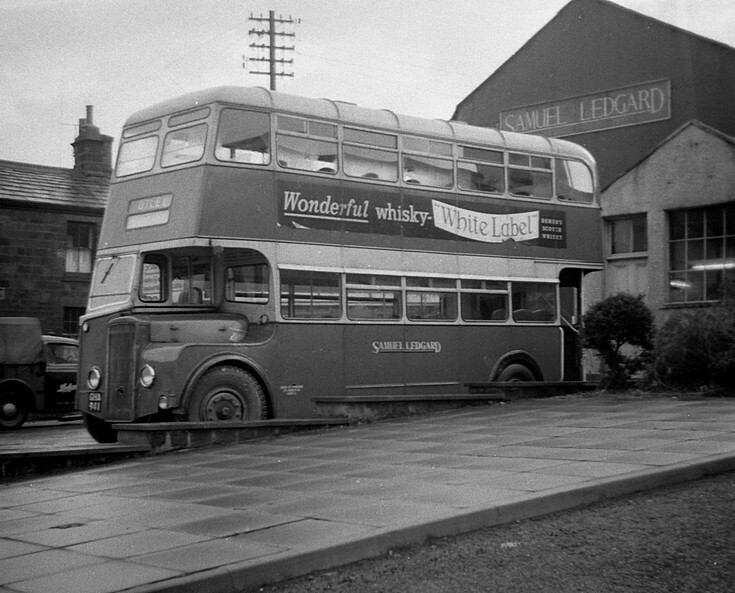 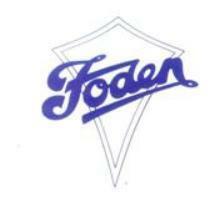 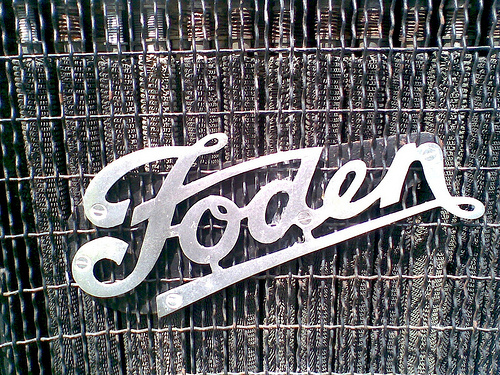 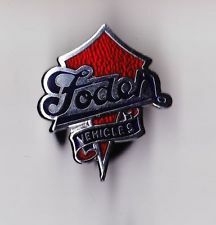 In August 1967, it was announced that West Yorkshire Road Car Company would acquire the Ledgard business. 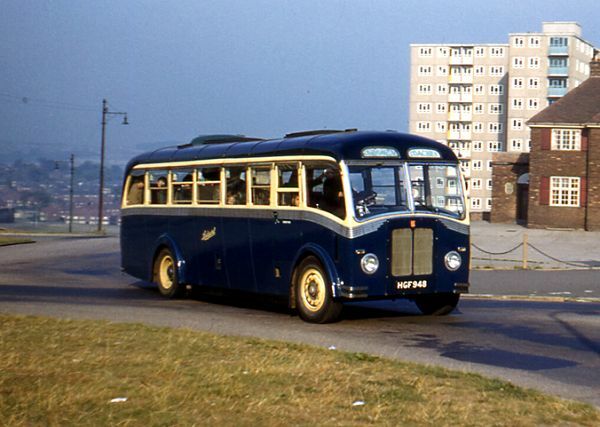 The date for this was set to be midnight on Saturday 14 October 1967. 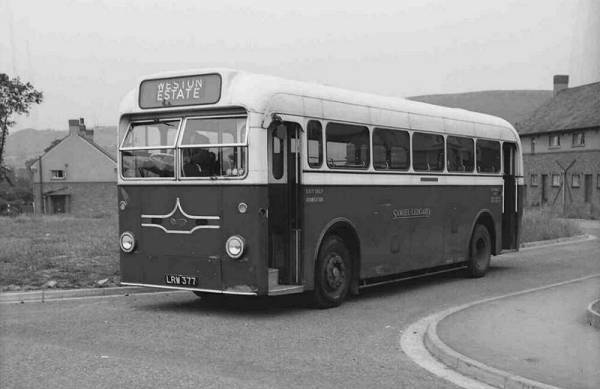 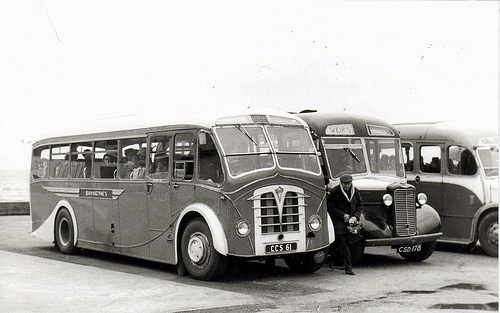 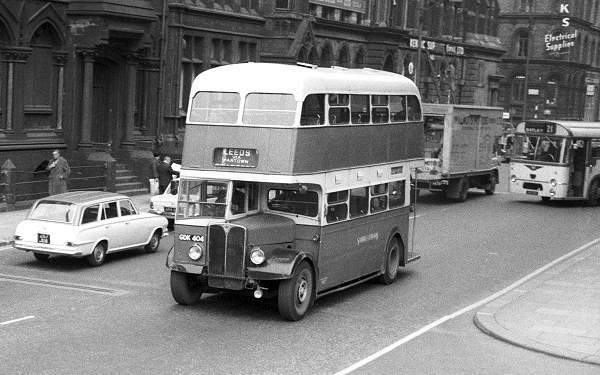 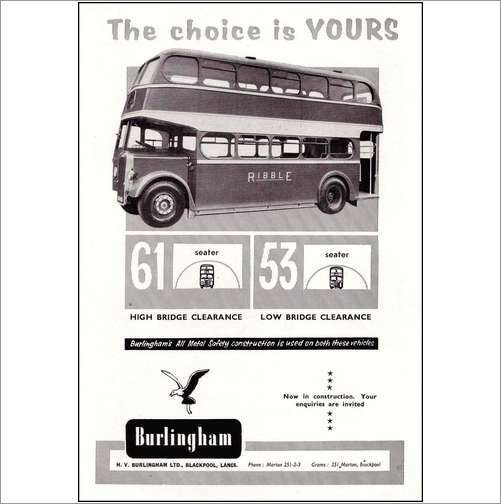 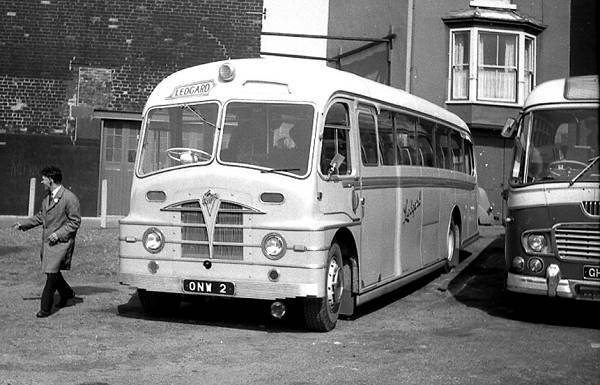 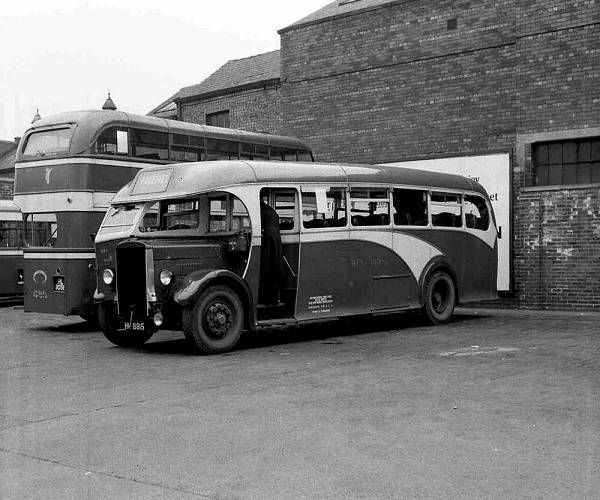 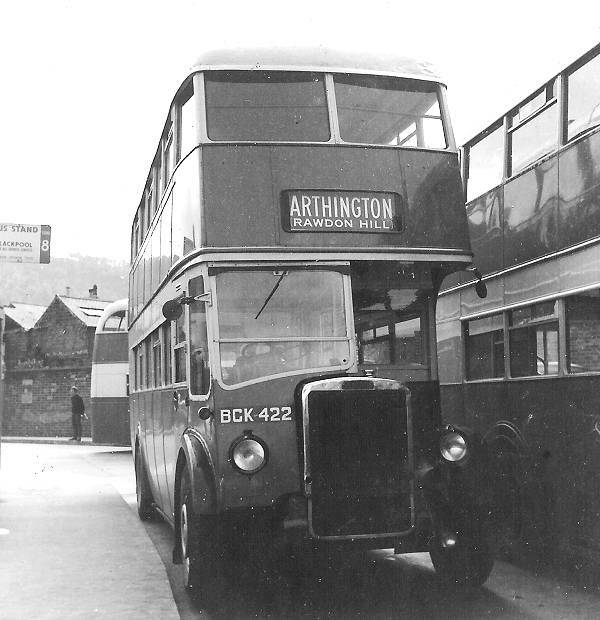 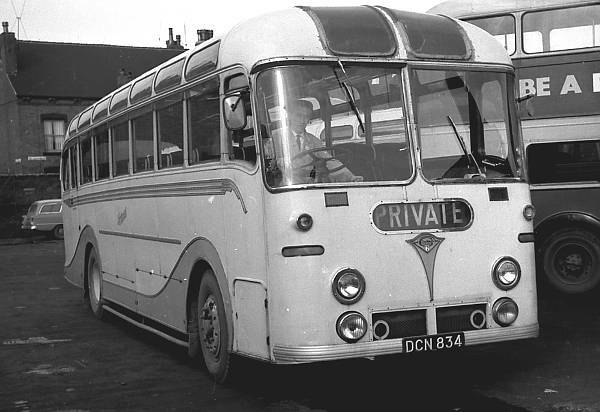 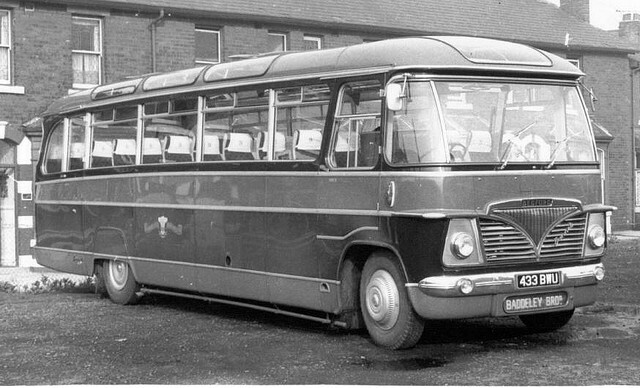 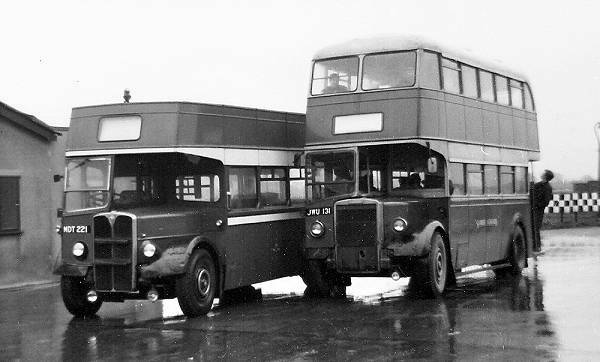 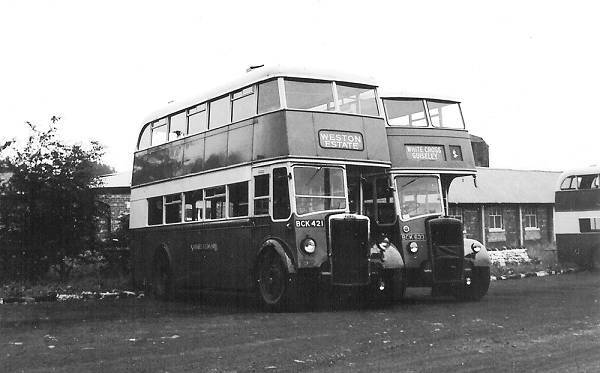 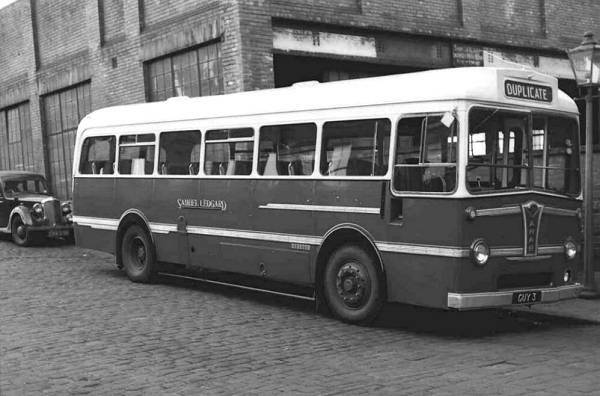 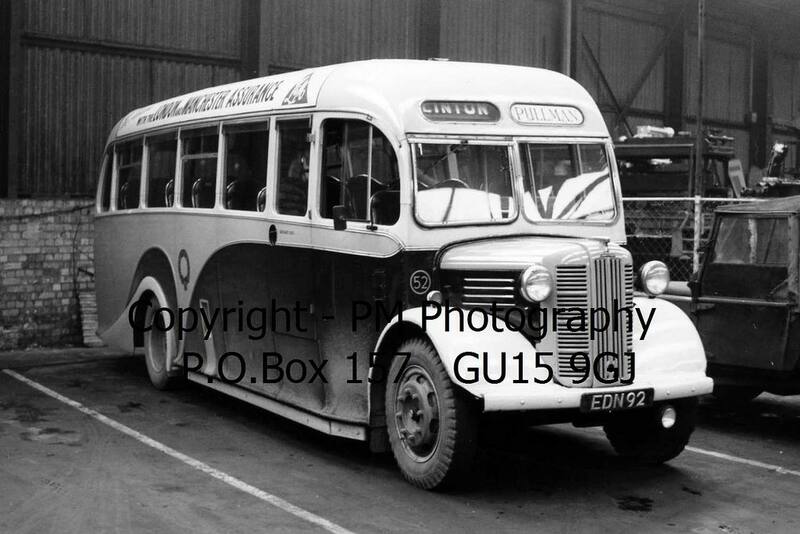 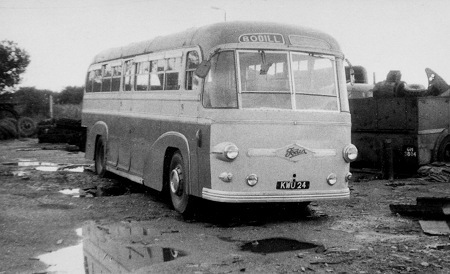 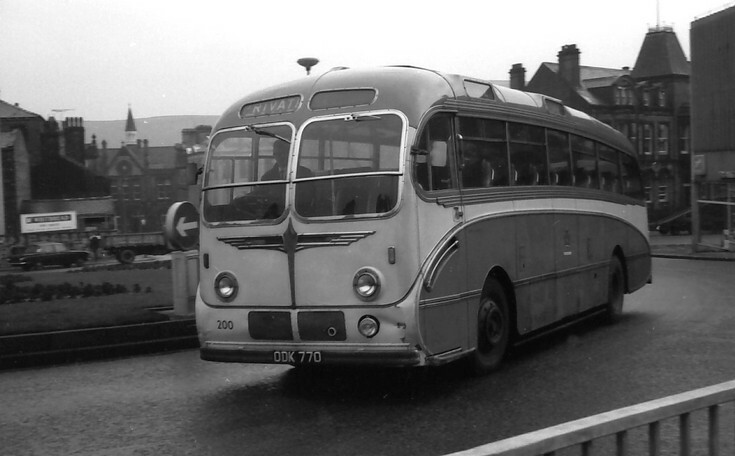 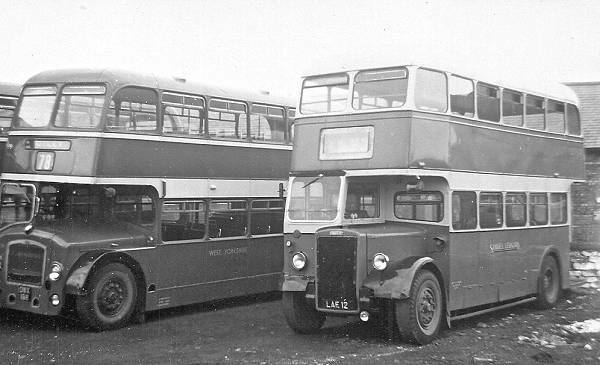 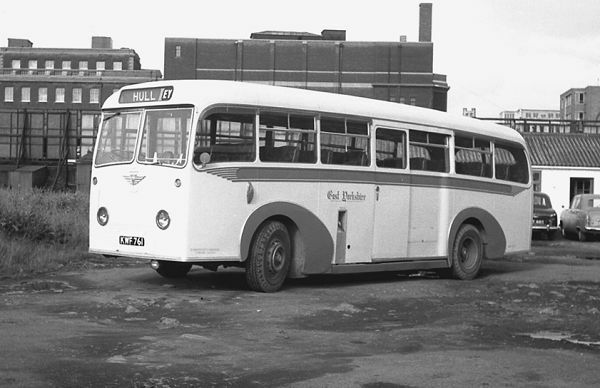 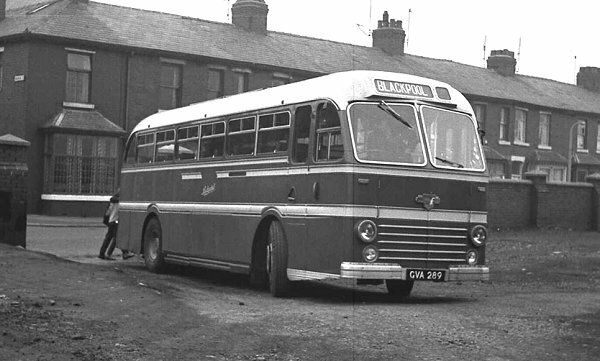 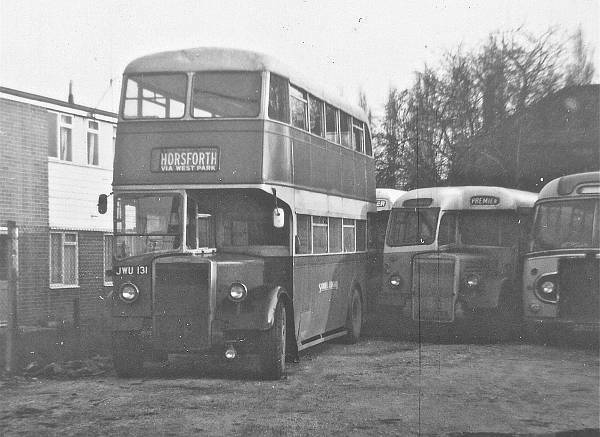 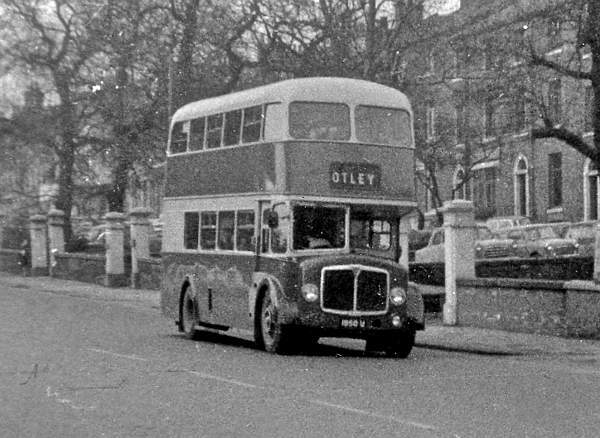 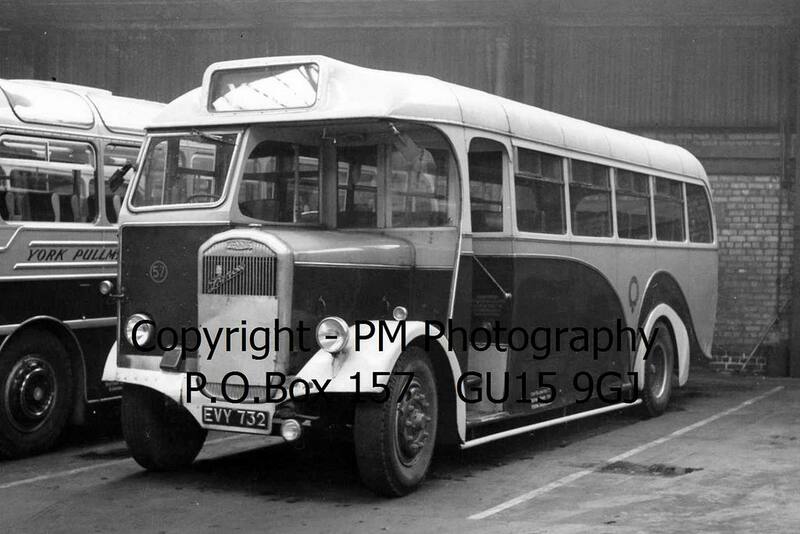 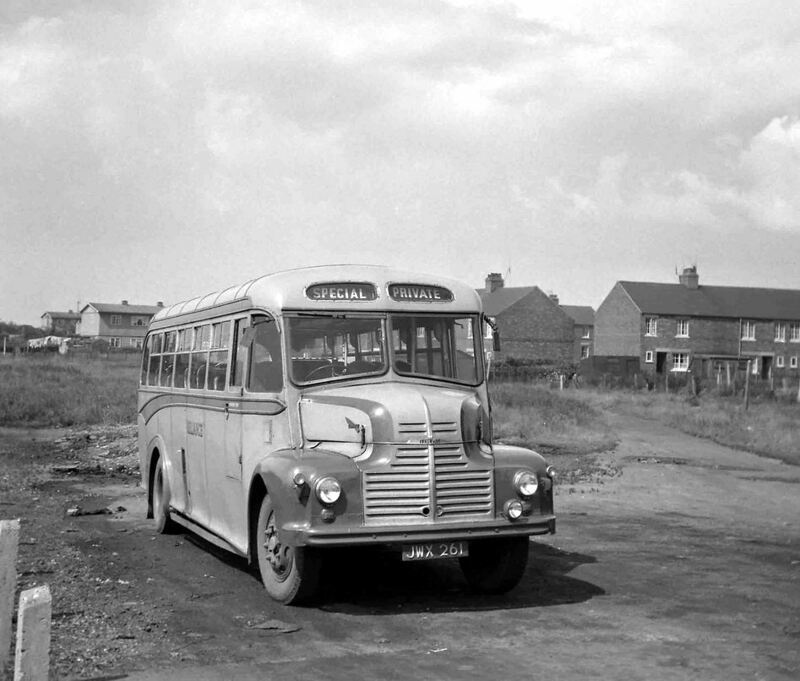 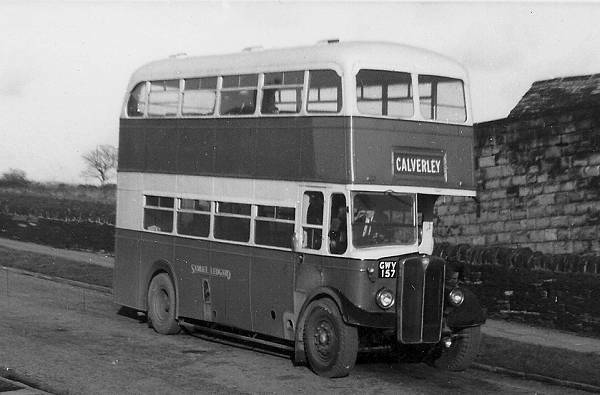 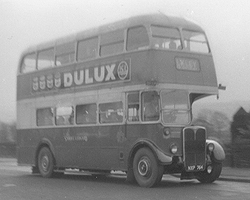 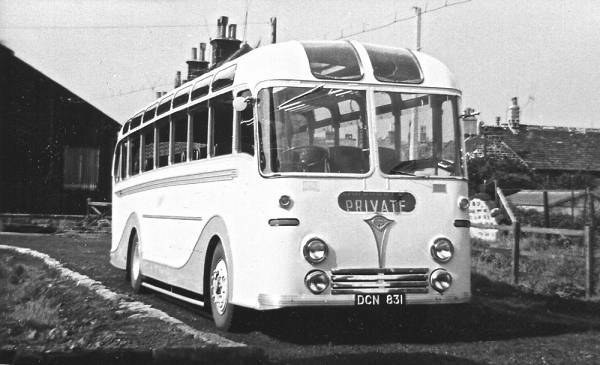 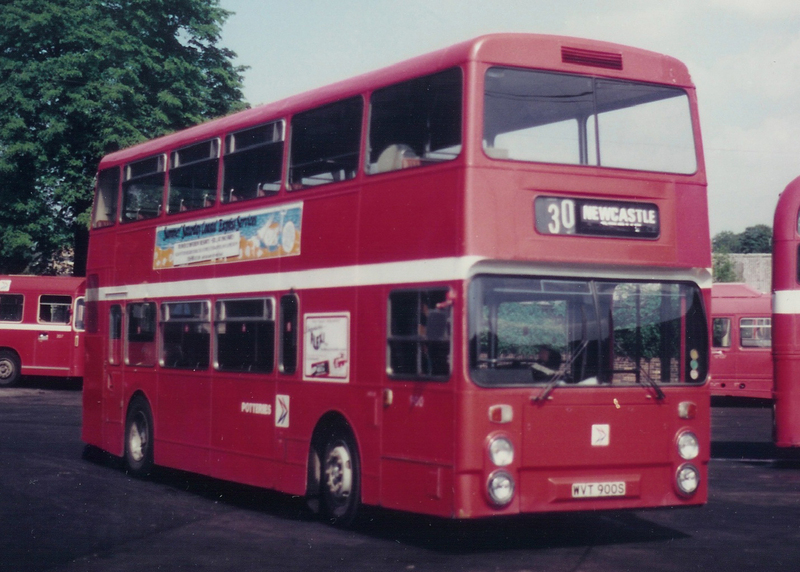 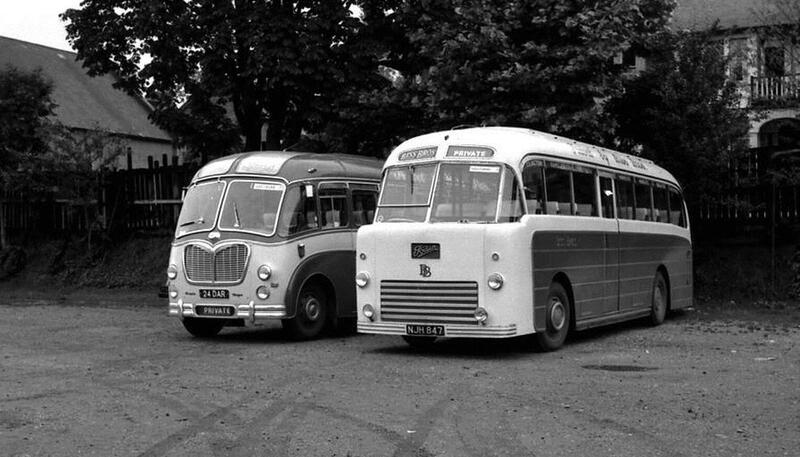 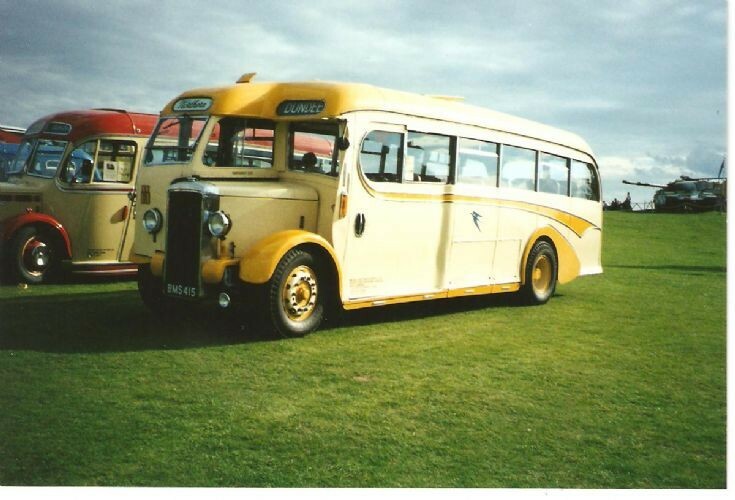 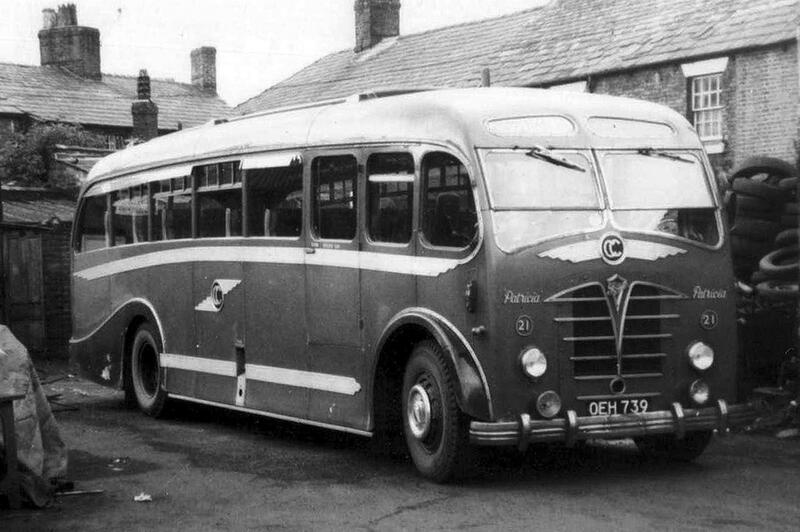 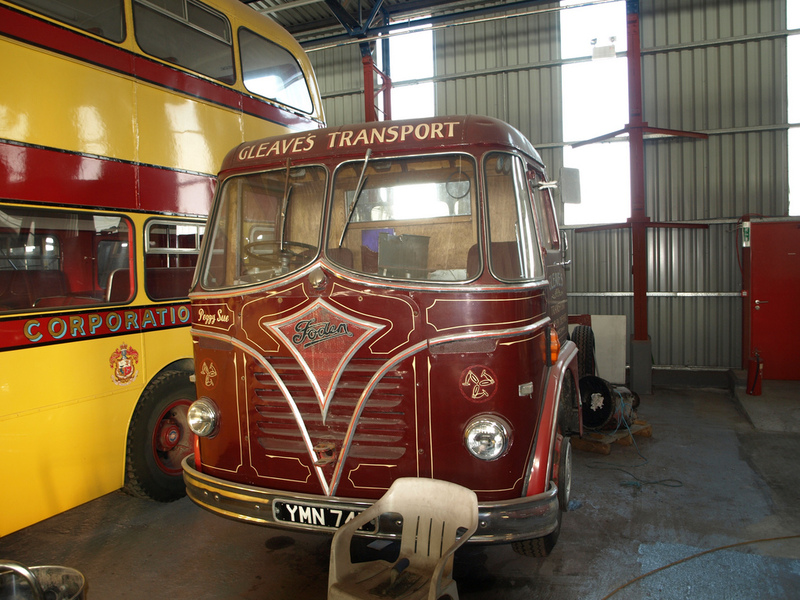 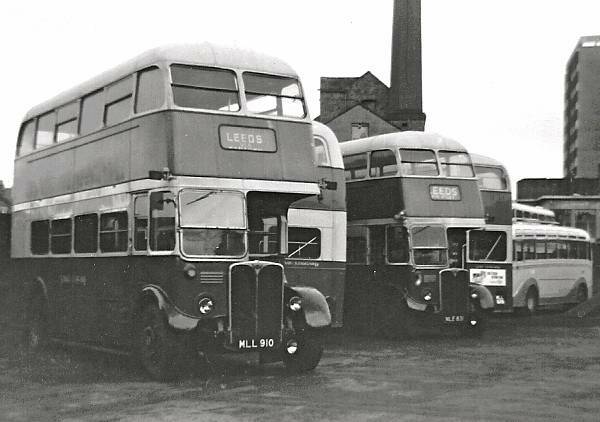 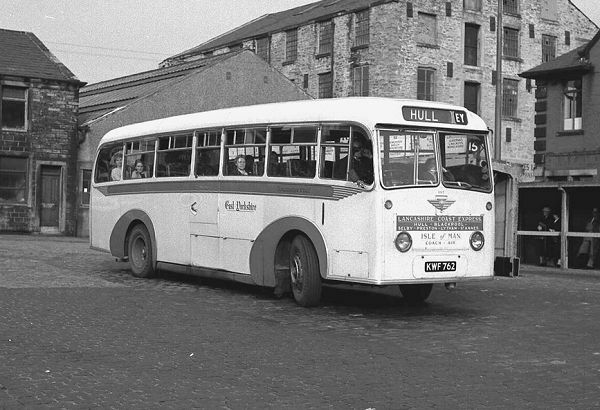 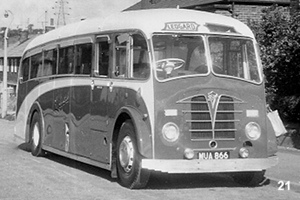 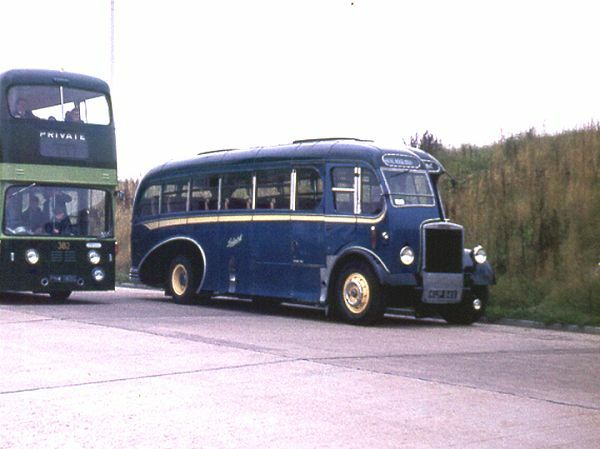 Whilst Ledgard’s staff were offered employment with West Yorkshire, only 14 of over 100 Ledgard vehicles acquired by West Yorkshire entered service – ten AEC Regent V and two Daimler CVG6 buses, plus two Duple-bodied Ford coaches. 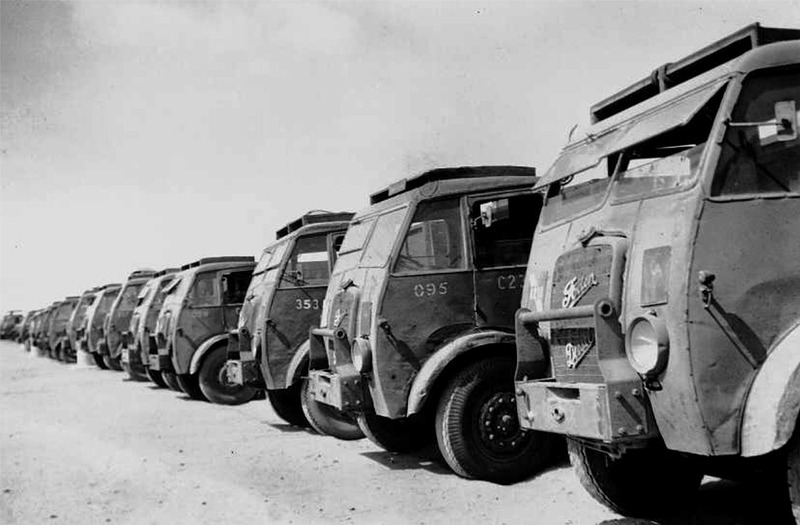 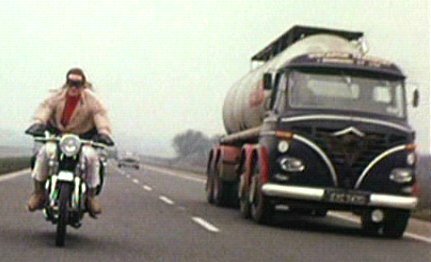 By 1970, even these vehicles had been sold. 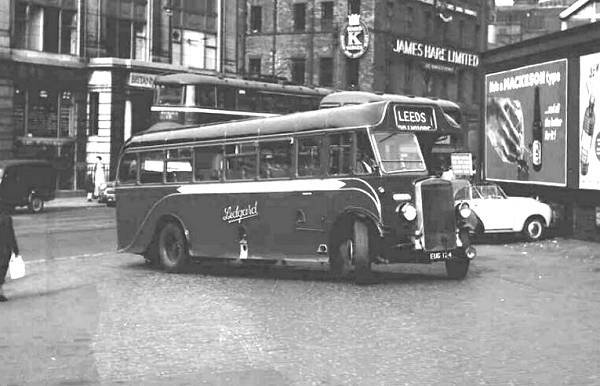 I was working as a bus conductor for Leeds Corporation in 1967 and the union shop steward was gloating over Leeds intending to take over Ledgards so I am surprised to hear that West Yorks took them over. 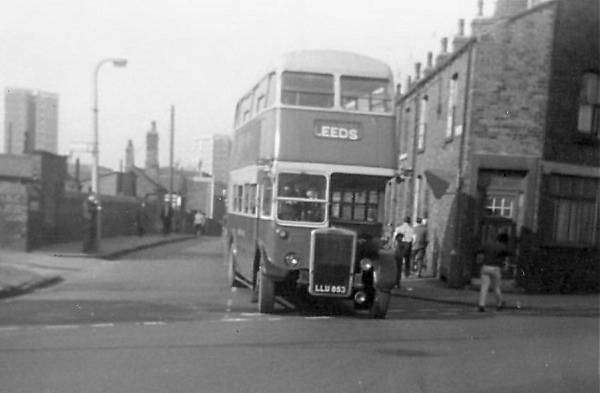 Their garage at Armley had a very steep little slope out onto Kirkstall Road that must have been a nightmare in snow and ice. 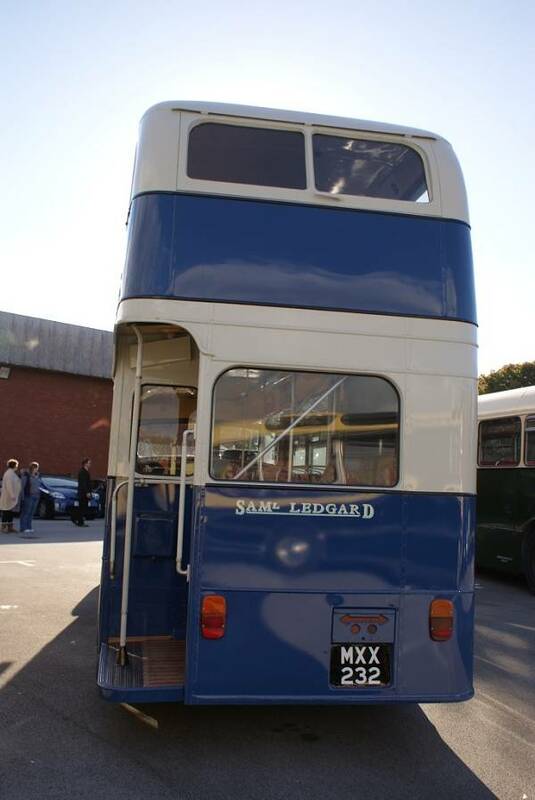 An active enthusiasts society (the Samuel Ledgard Society) was formed in 1998. 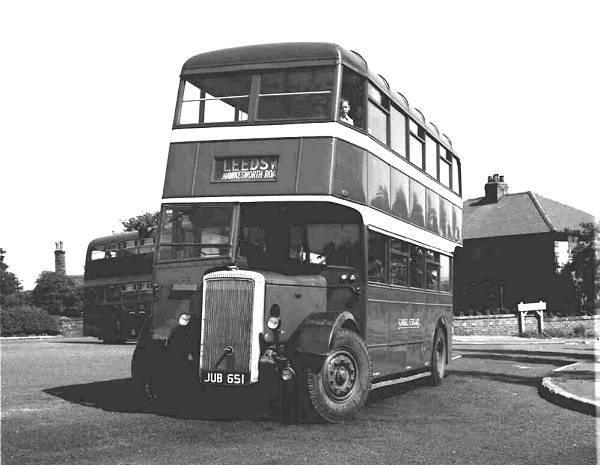 The society holds an annual reunion, social events and publishes a quarterly magazine: The Ledgard Chat. 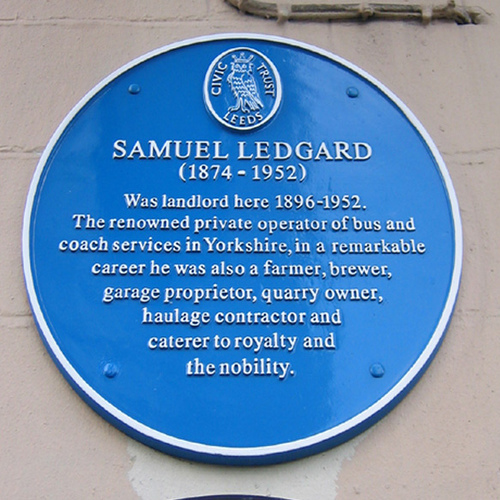 The Nelson Hotel survives, and bears a blue plaque in Samuel Ledgard’s memory. 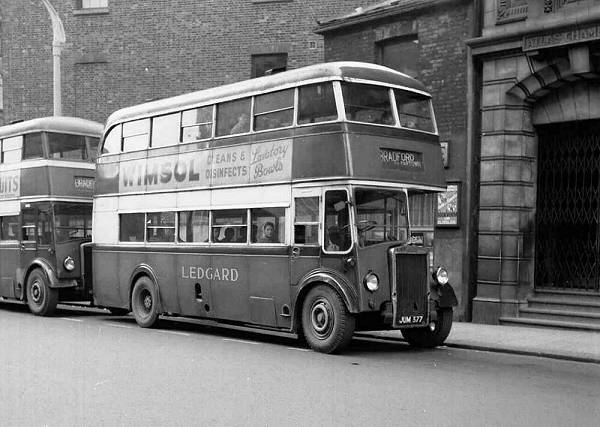 A nearby road is named Ledgard Way. 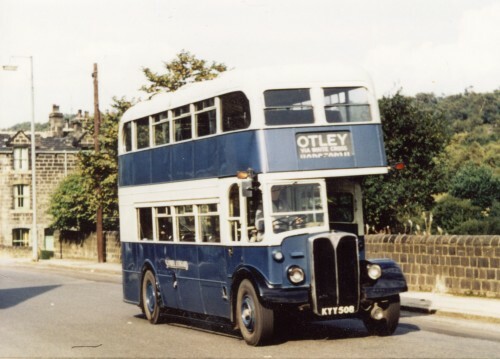 The Otley depot building is still in existence and is now used by a tyre-fitting company. 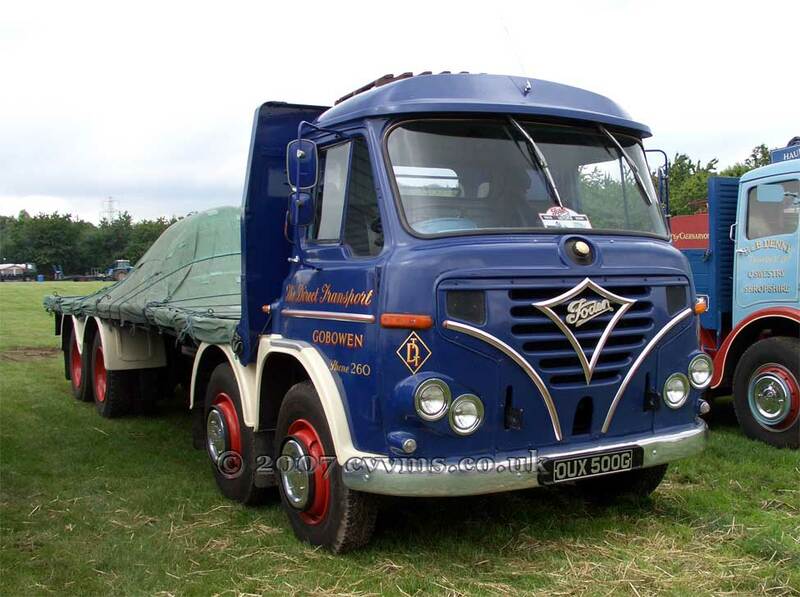 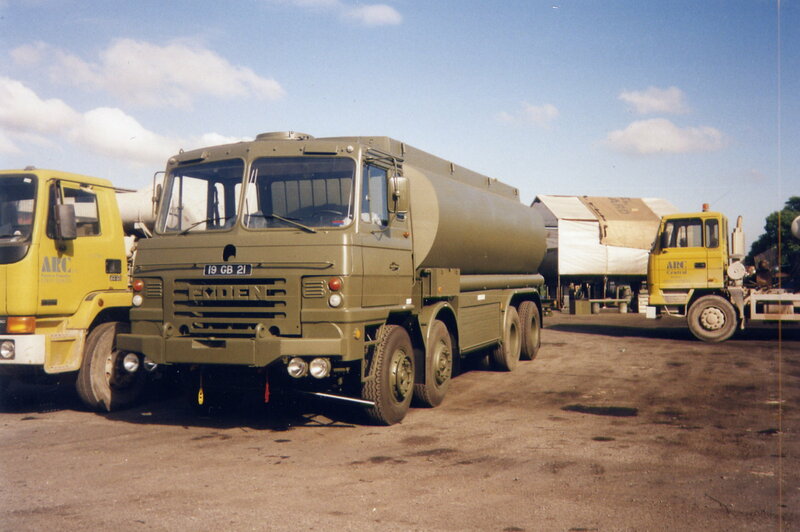 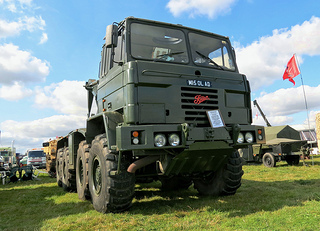 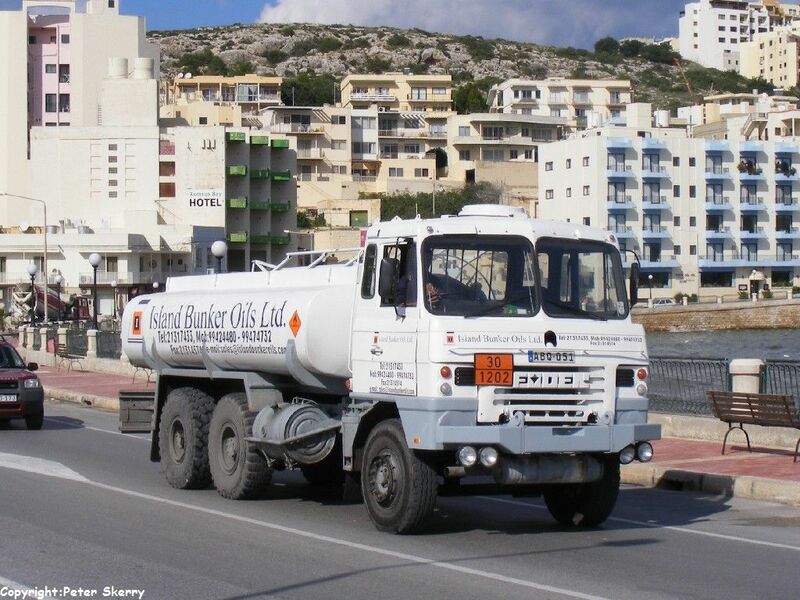 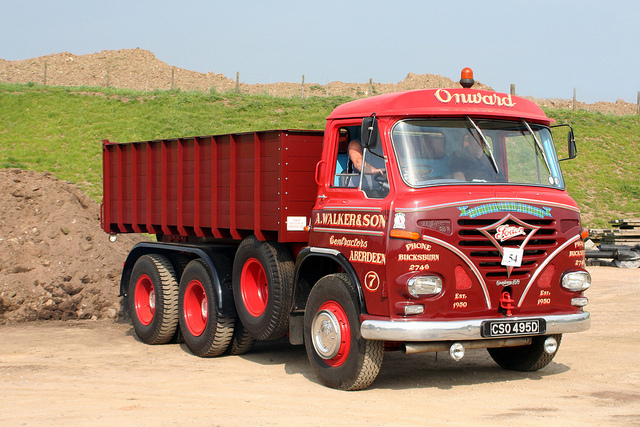 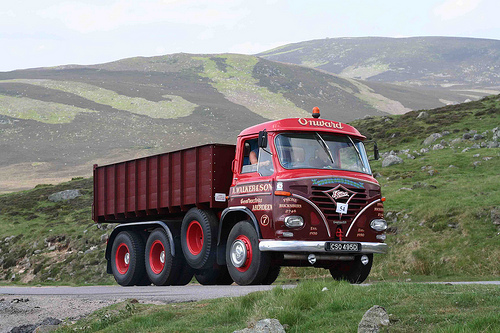 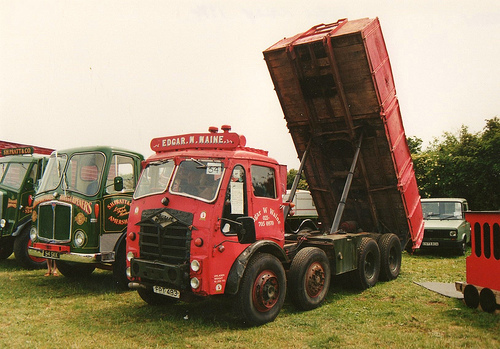 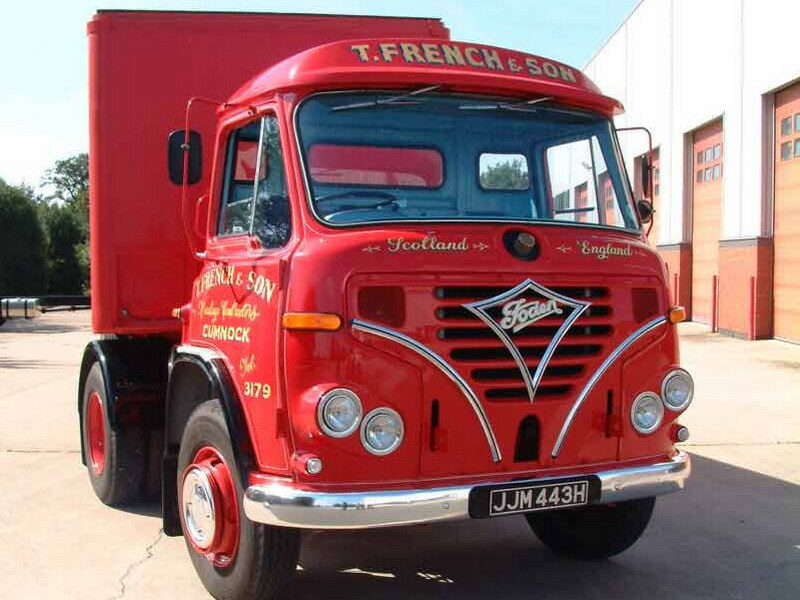 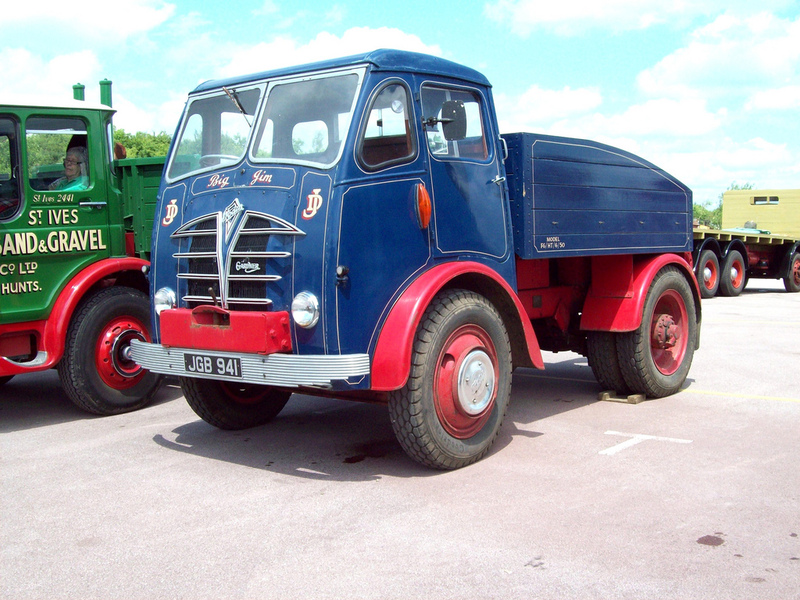 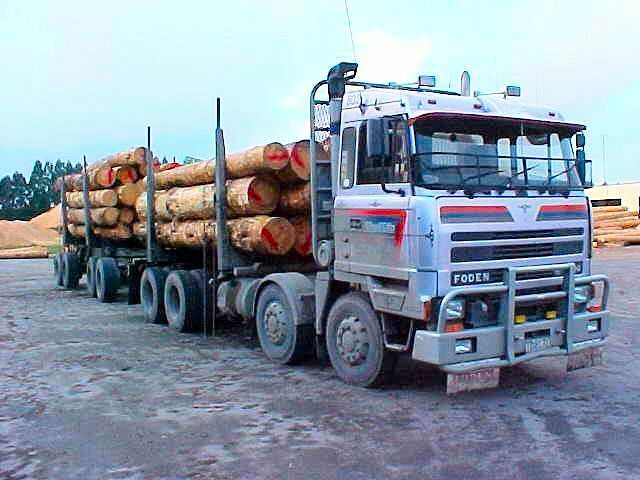 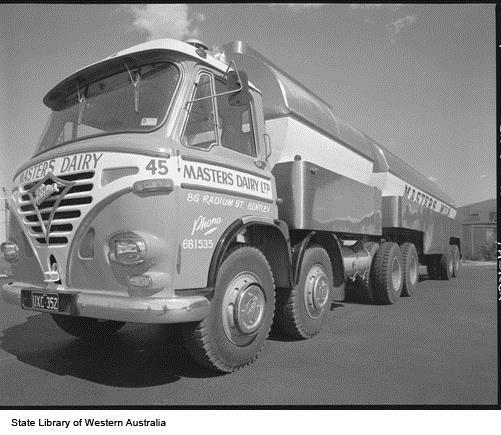 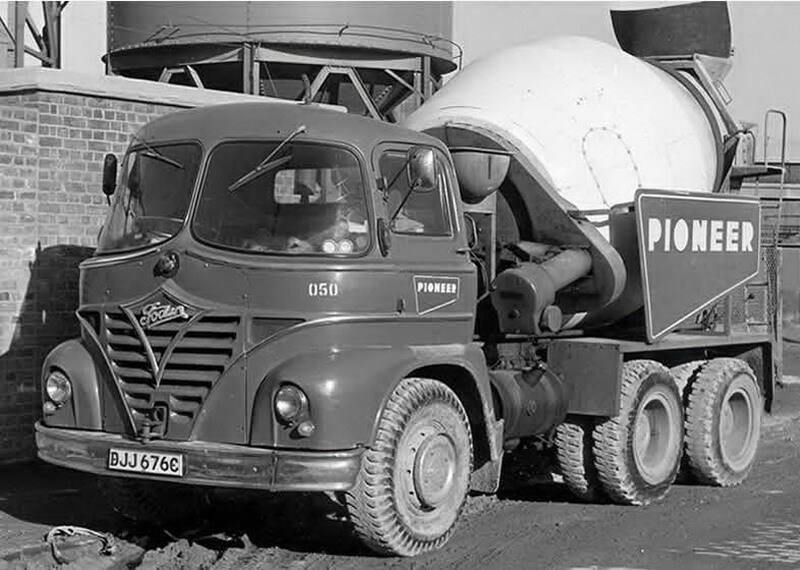 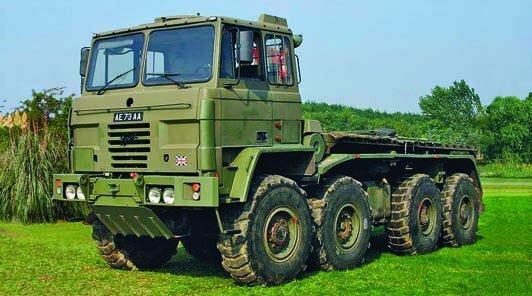 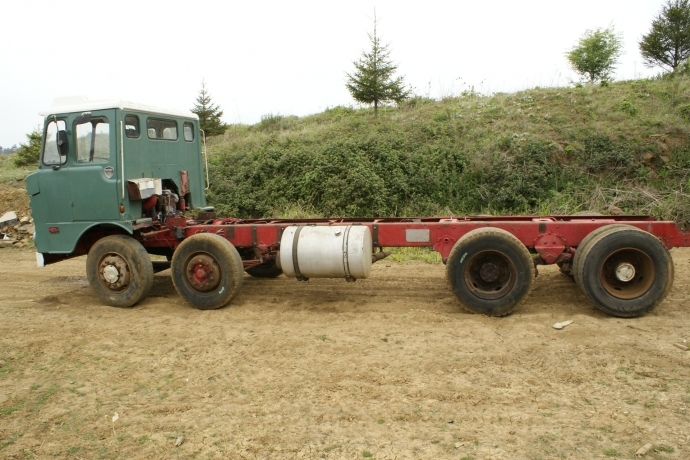 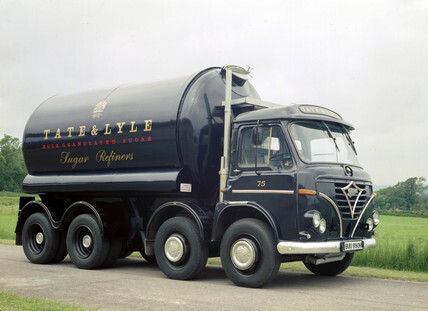 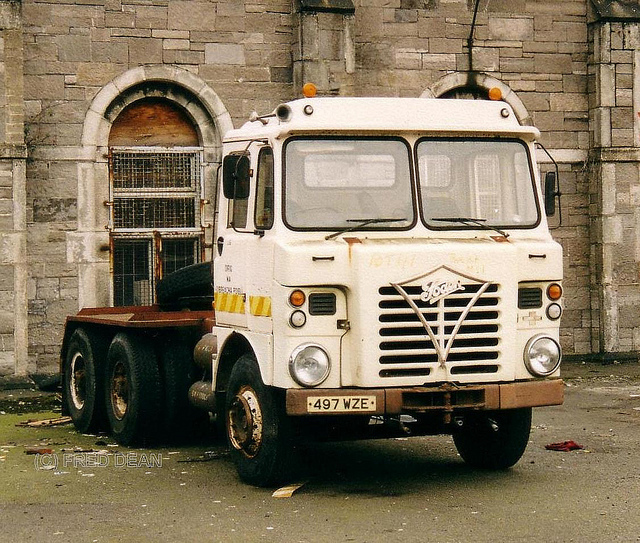 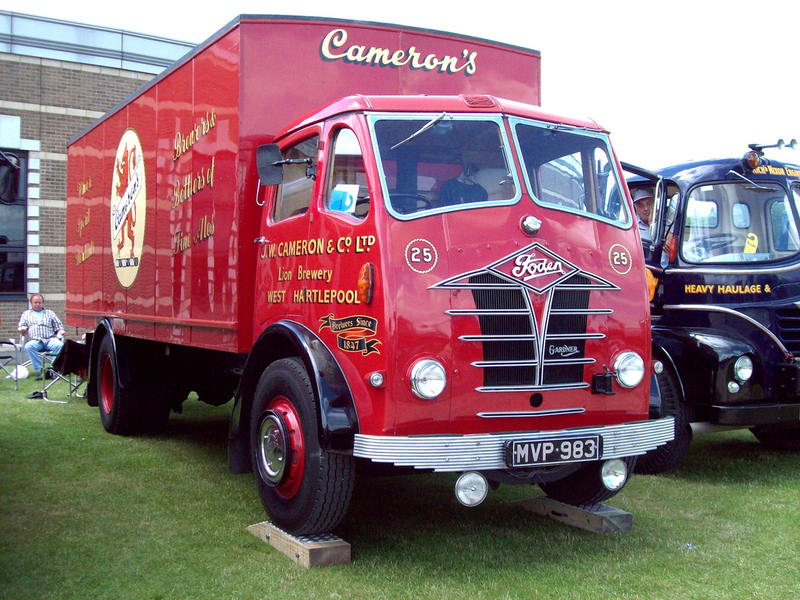 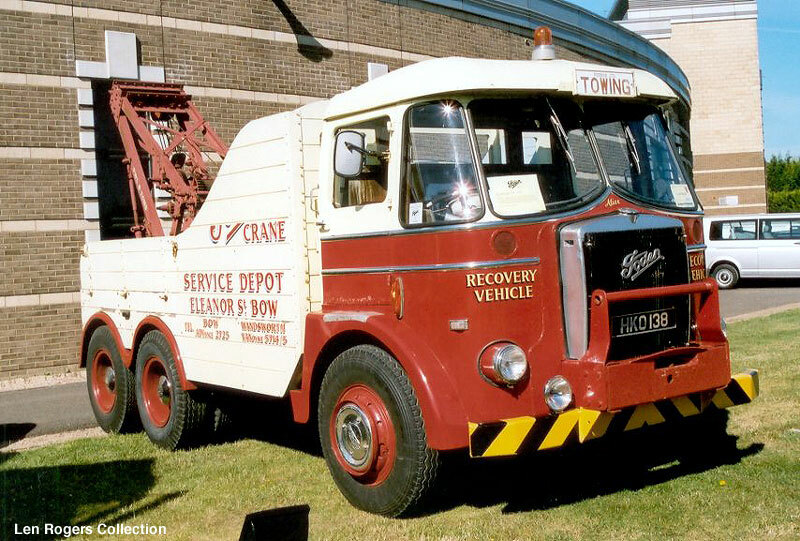 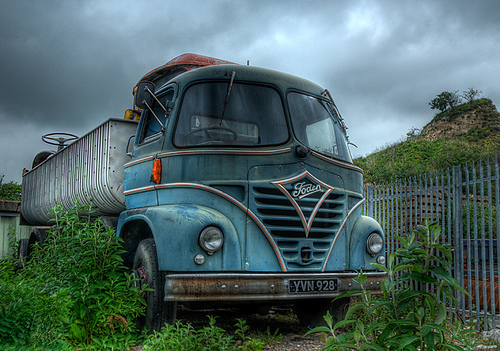 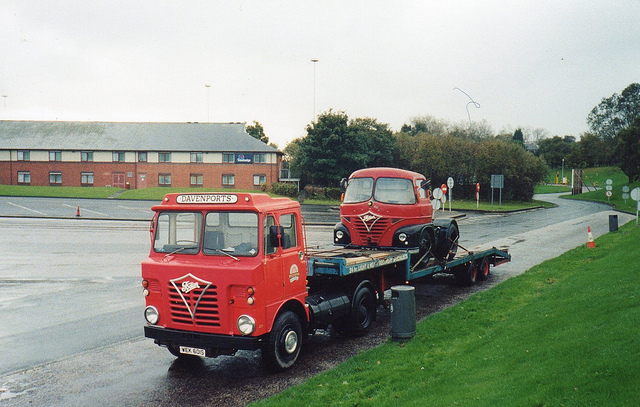 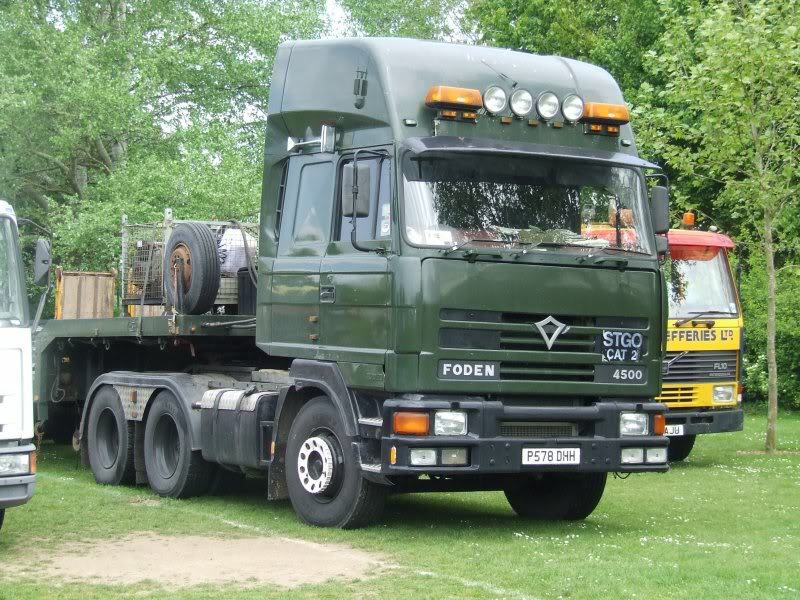 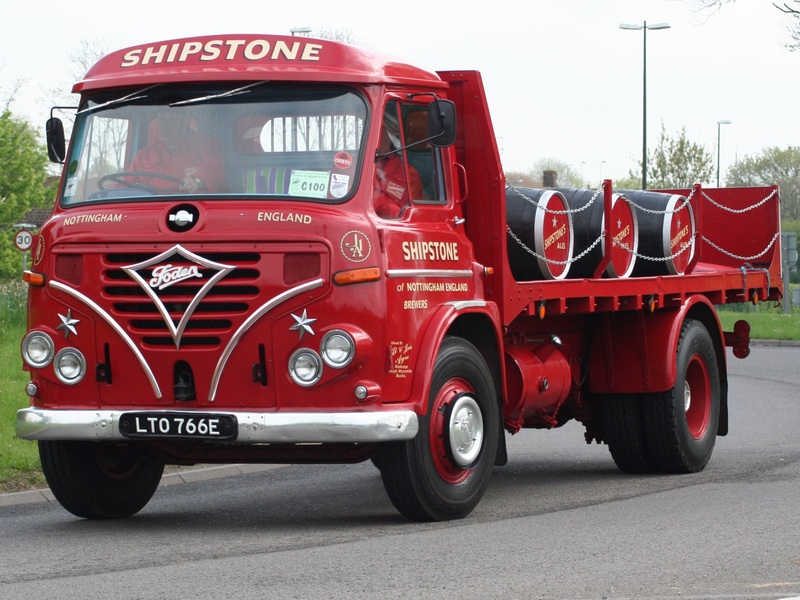 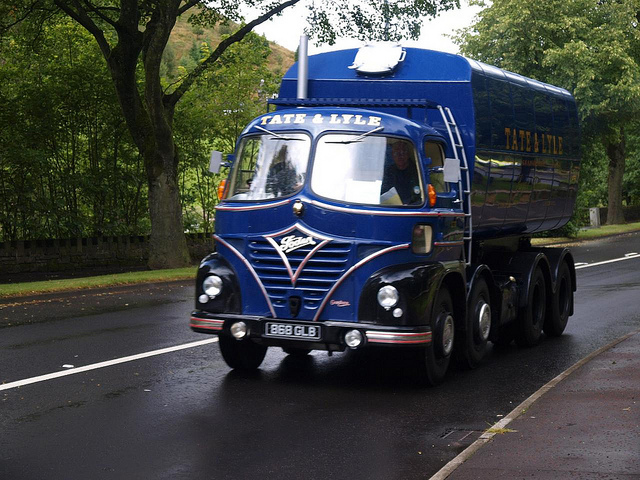 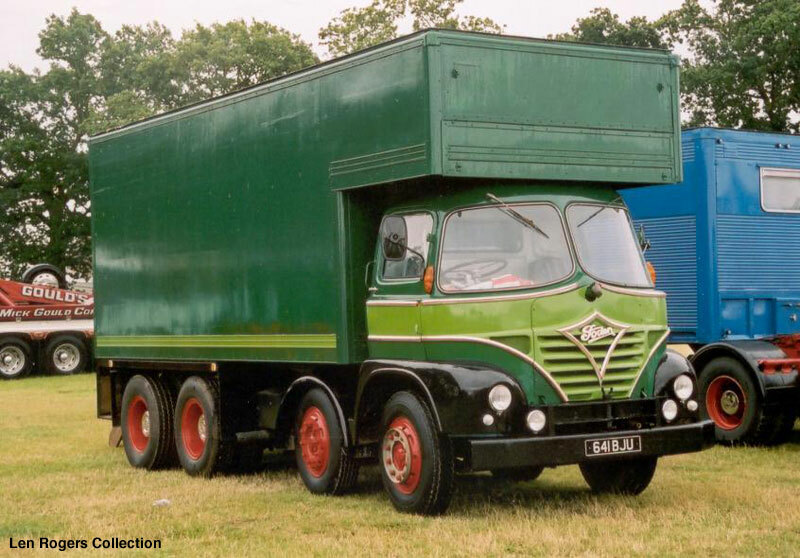 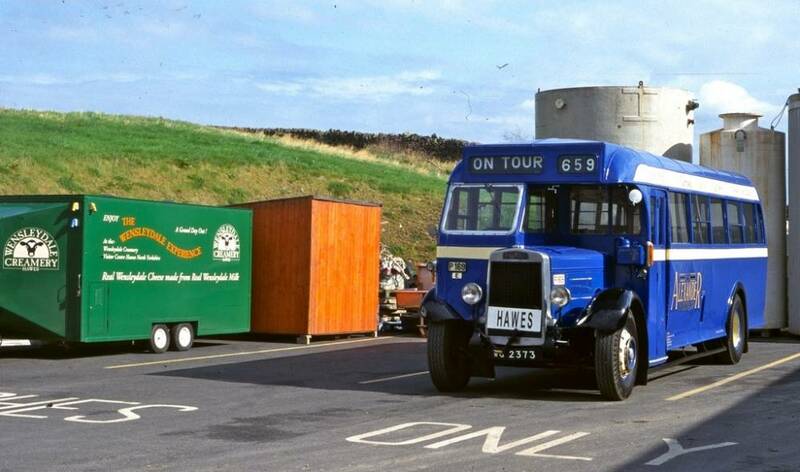 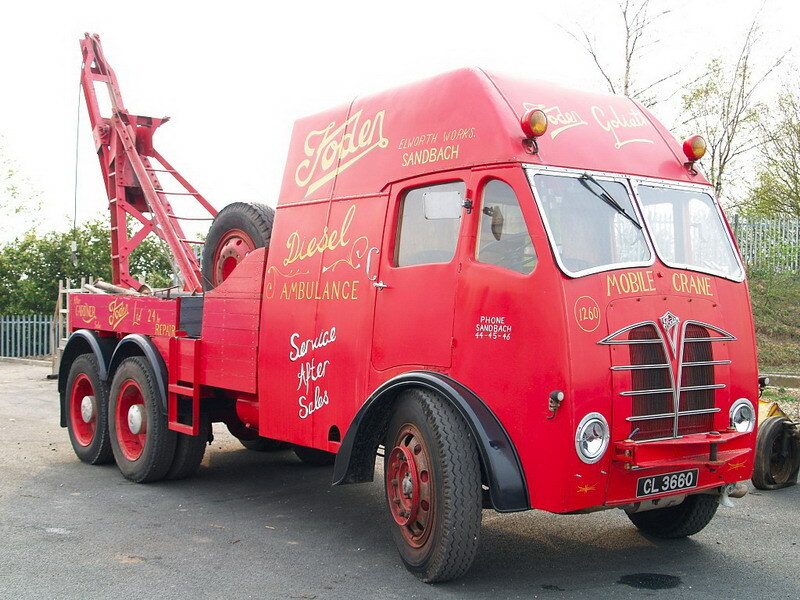 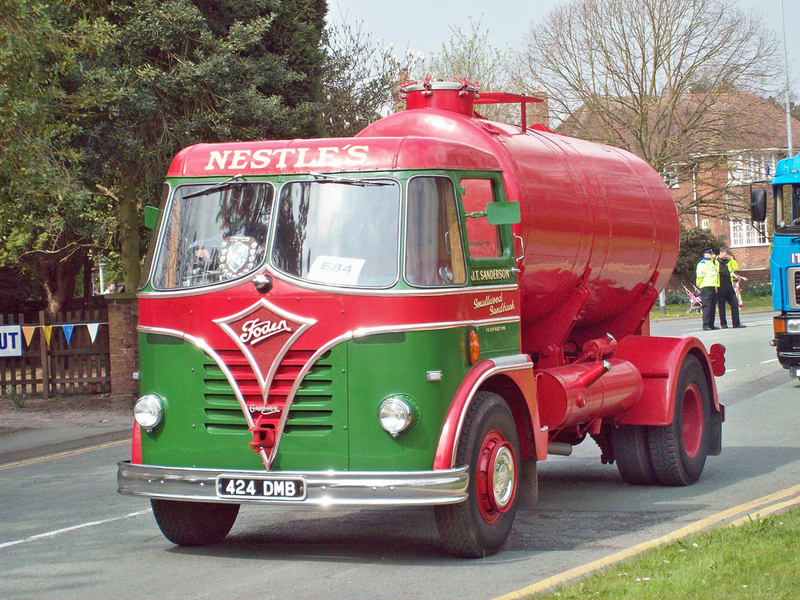 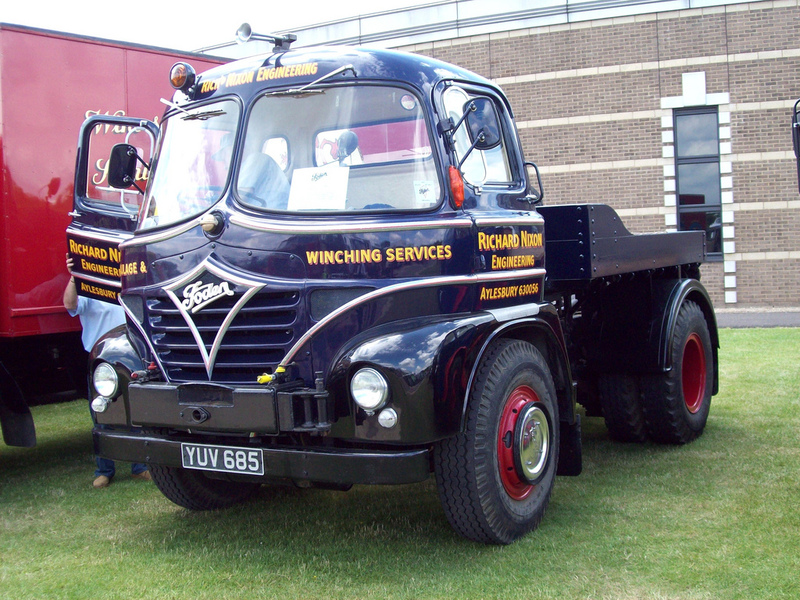 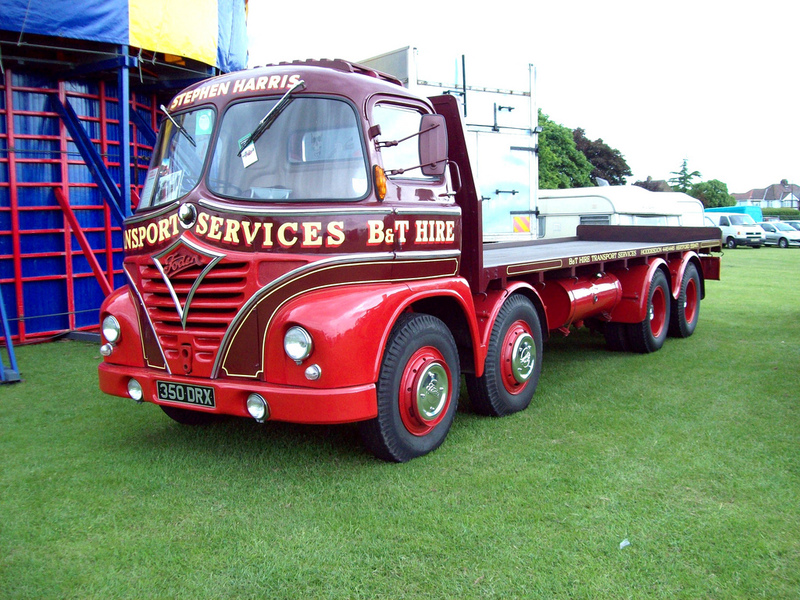 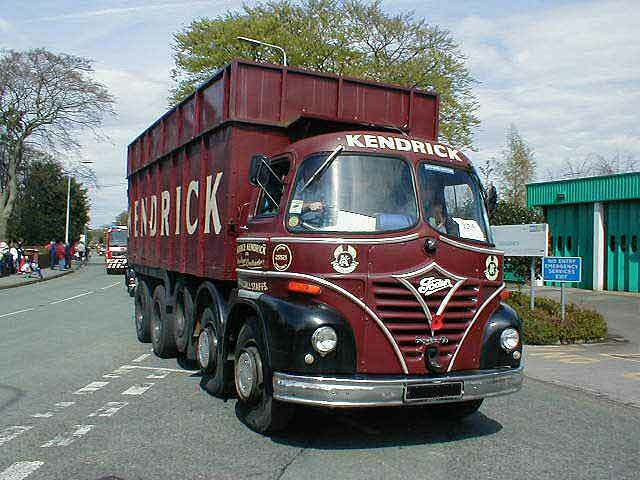 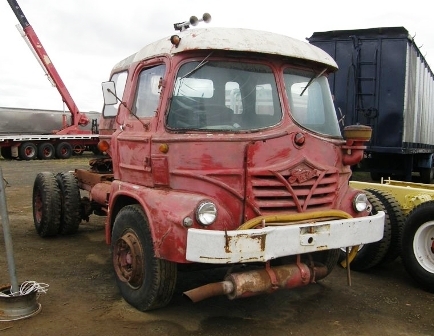 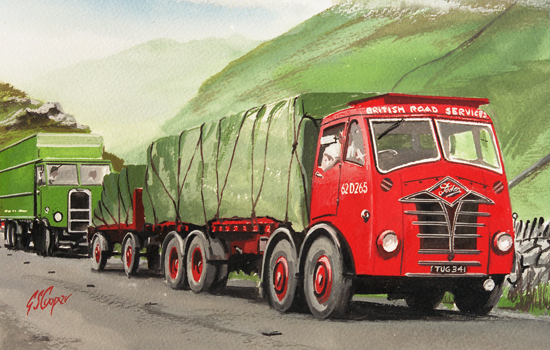 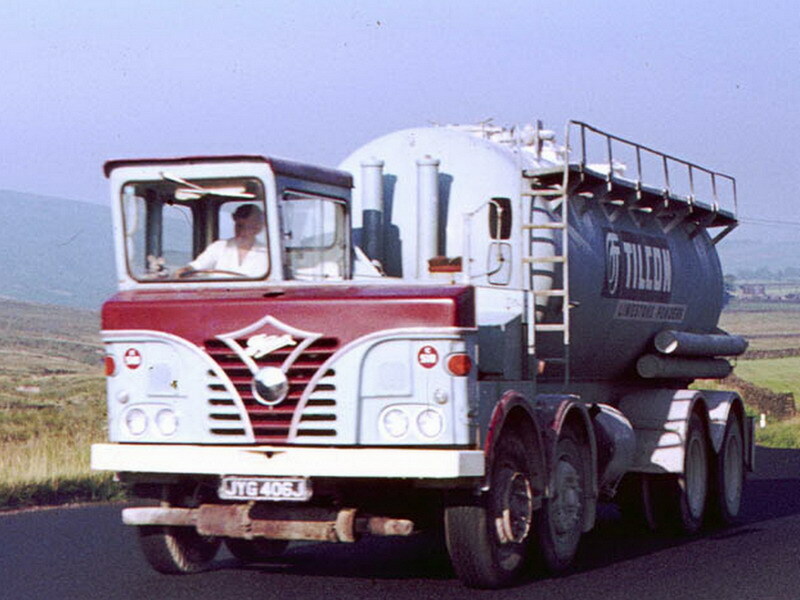 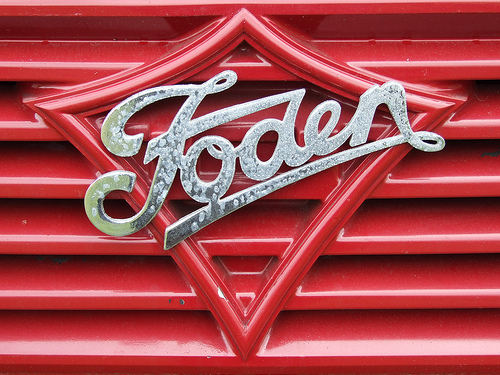 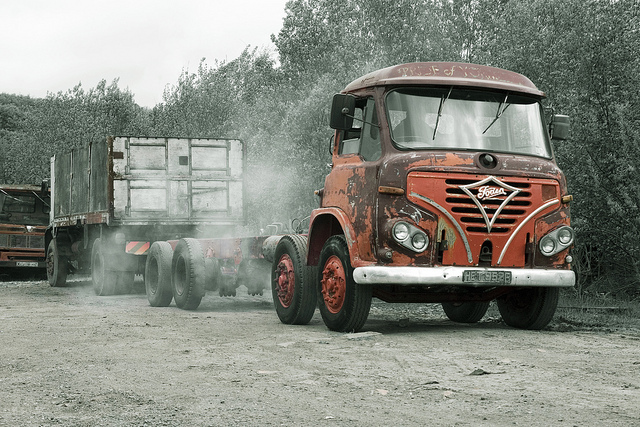 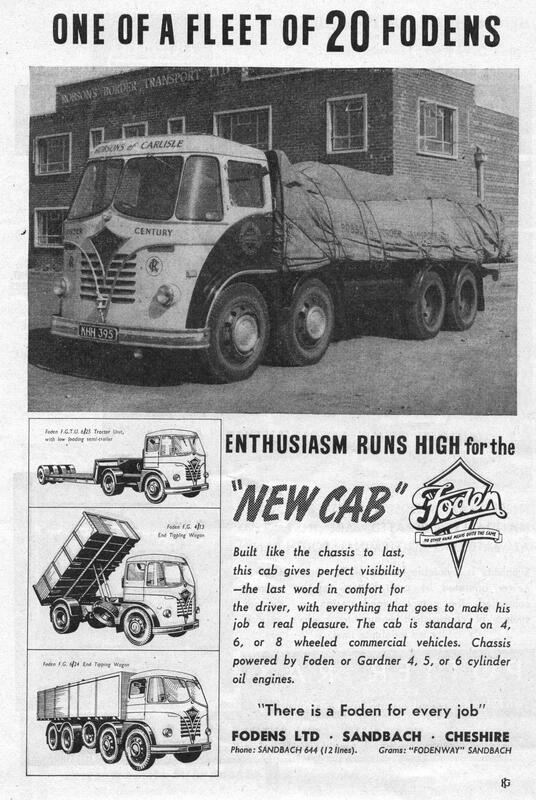 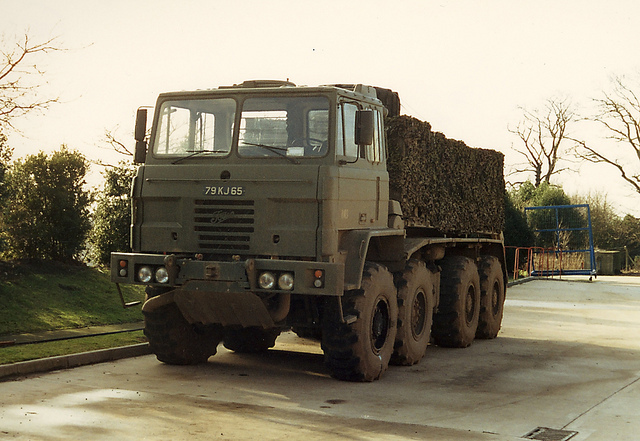 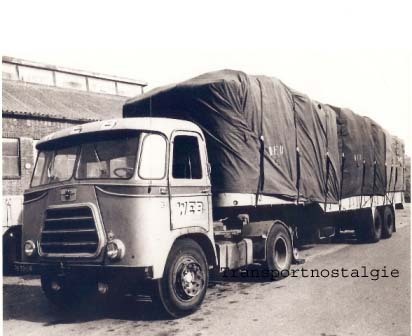 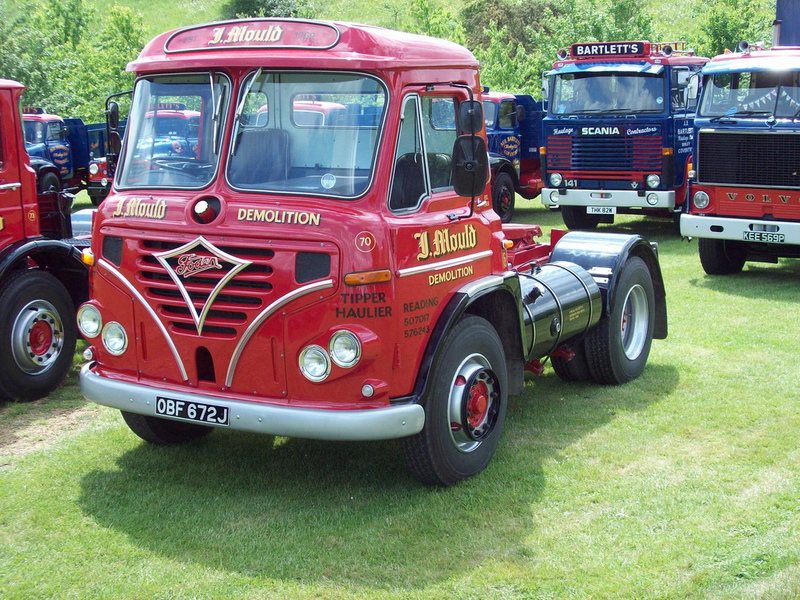 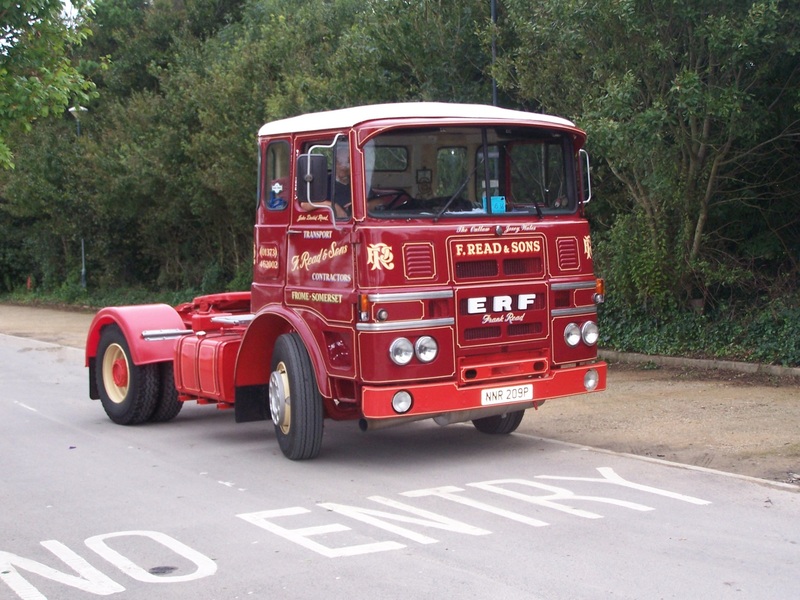 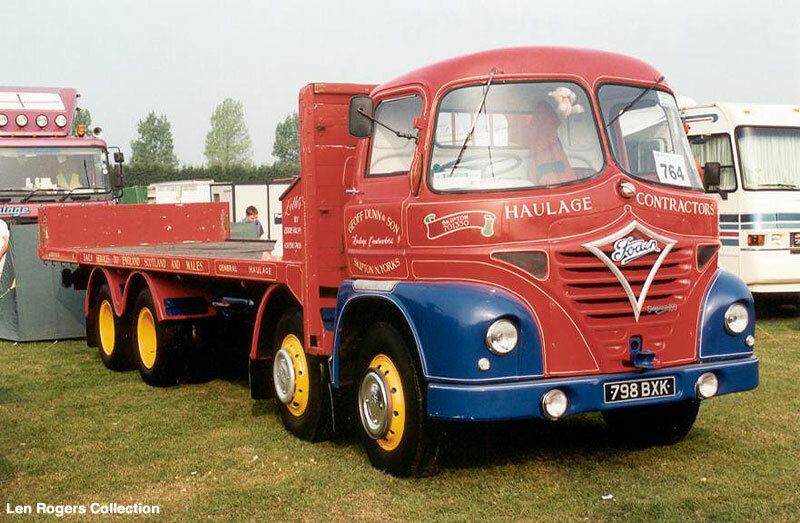 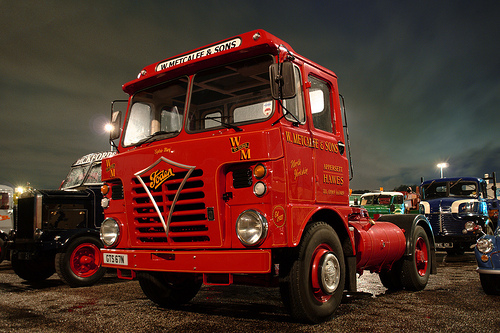 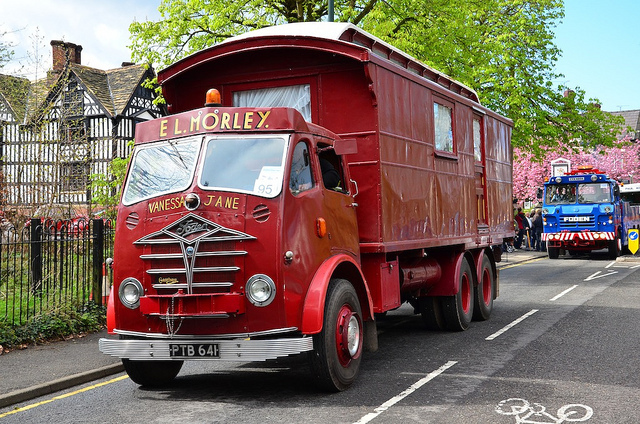 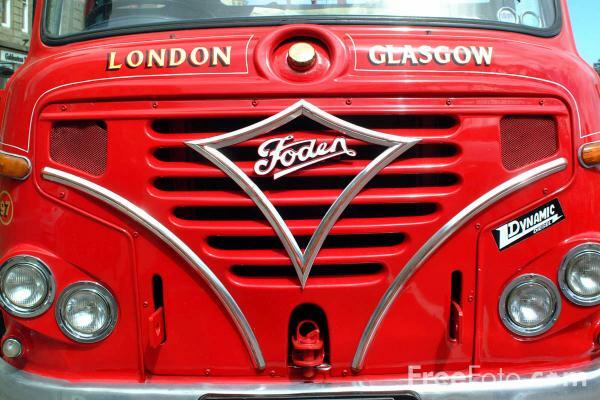 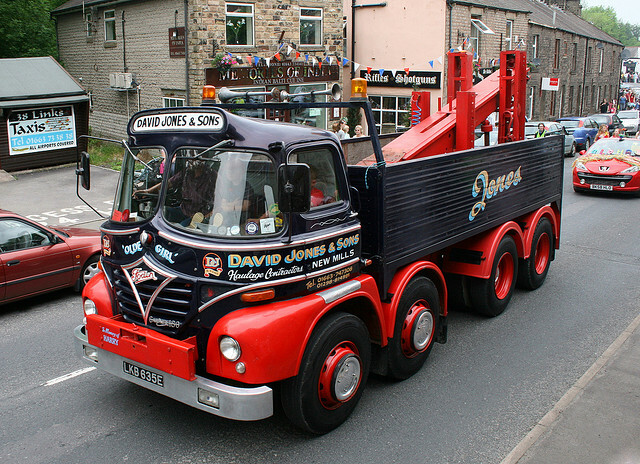 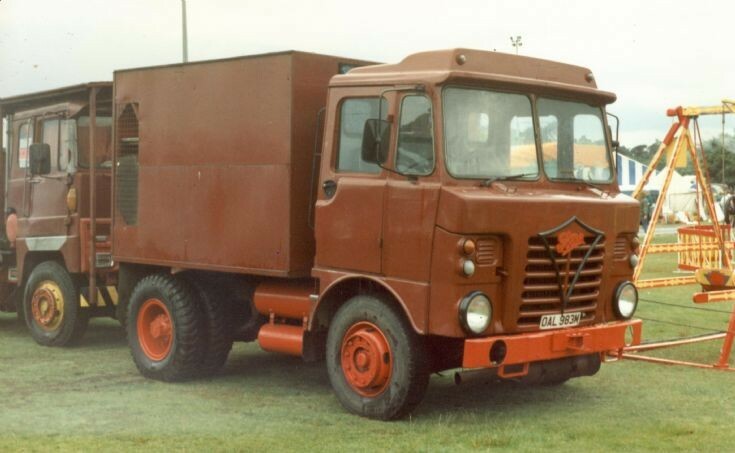 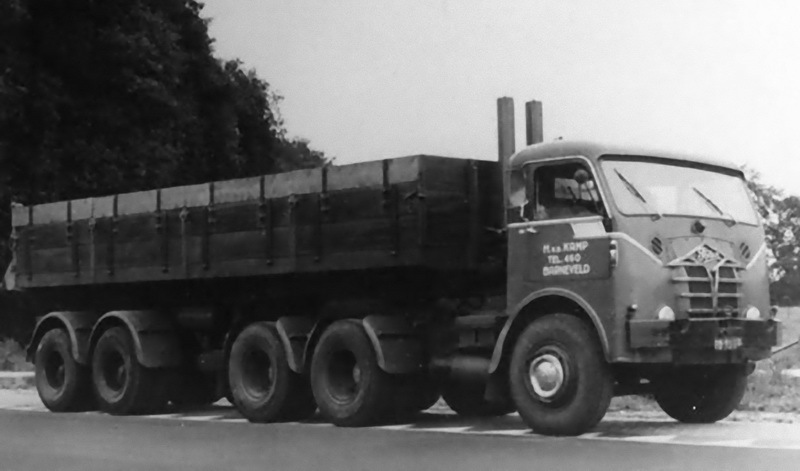 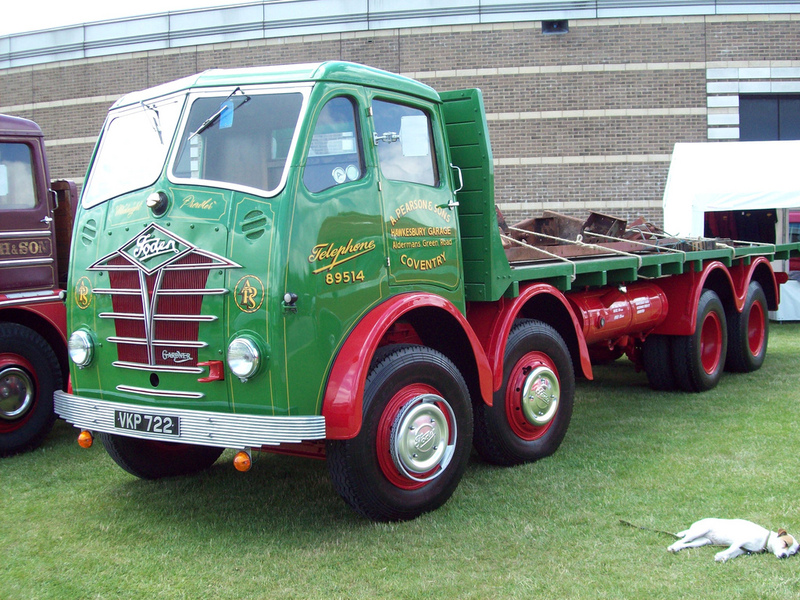 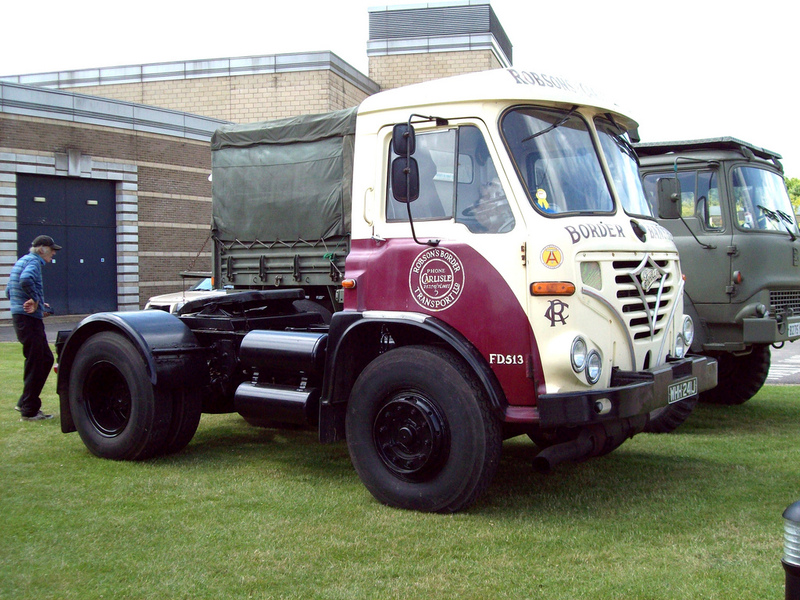 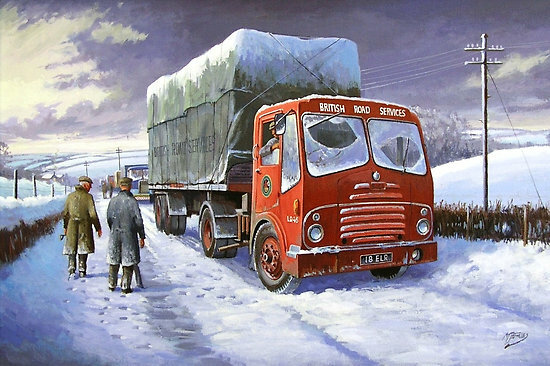 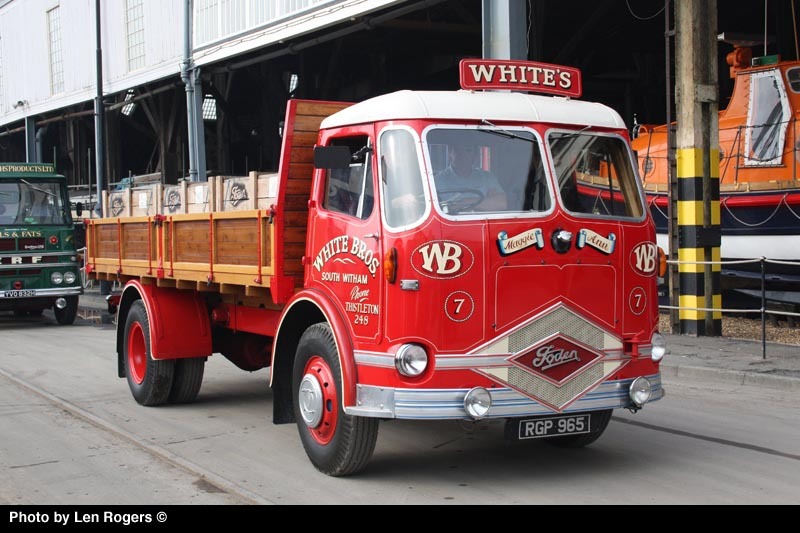 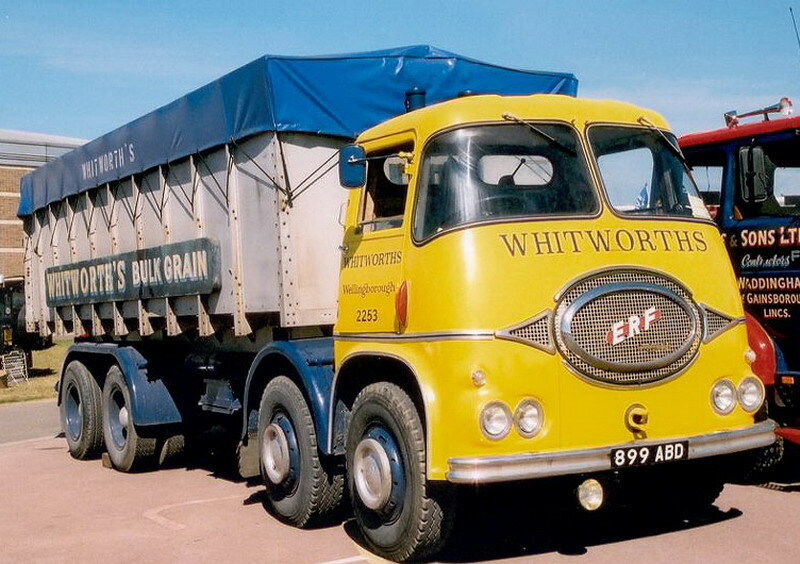 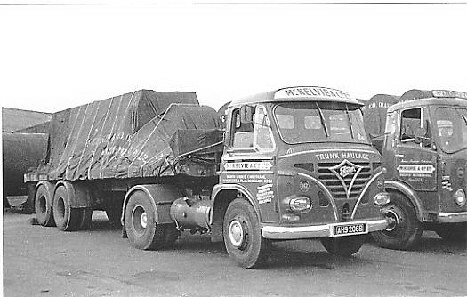 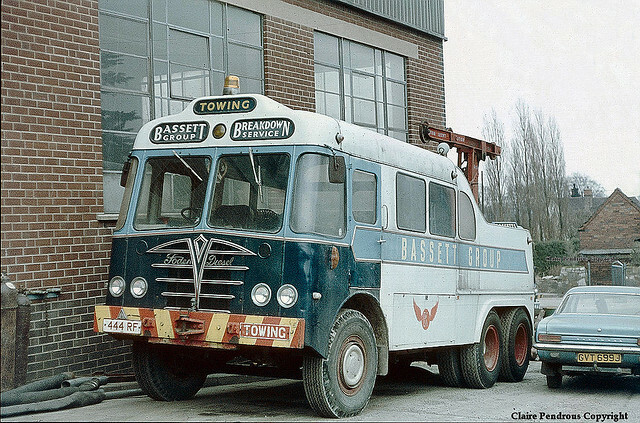 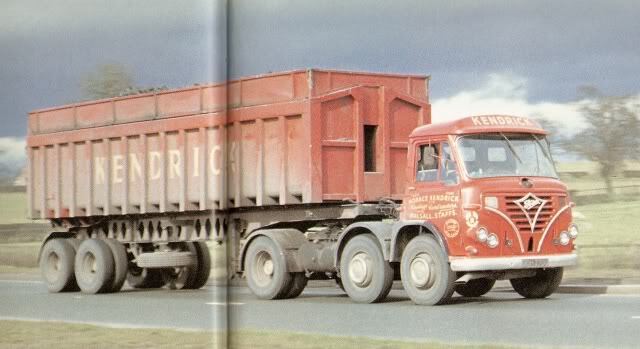 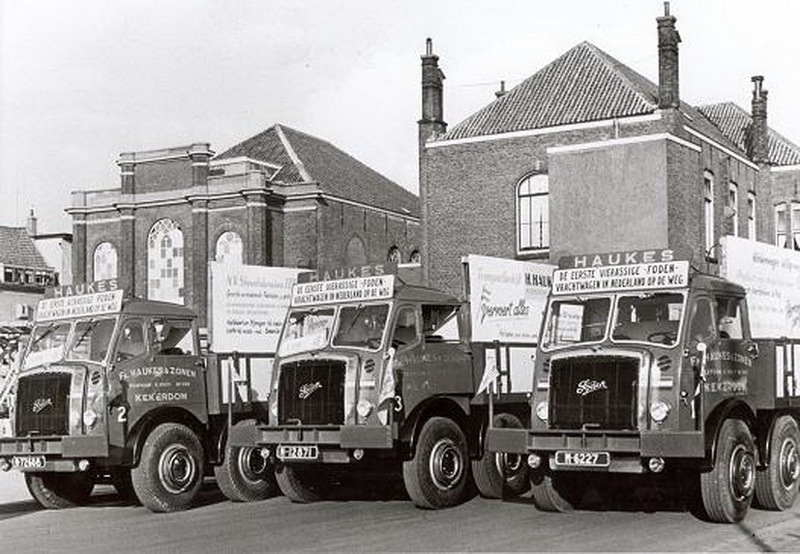 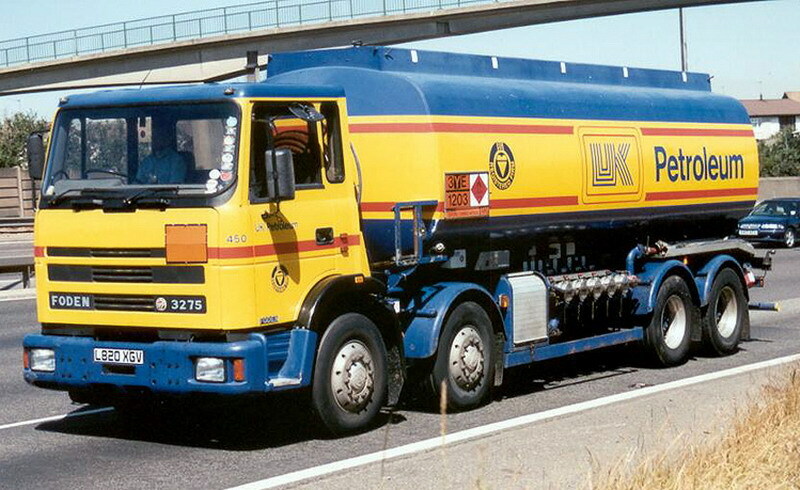 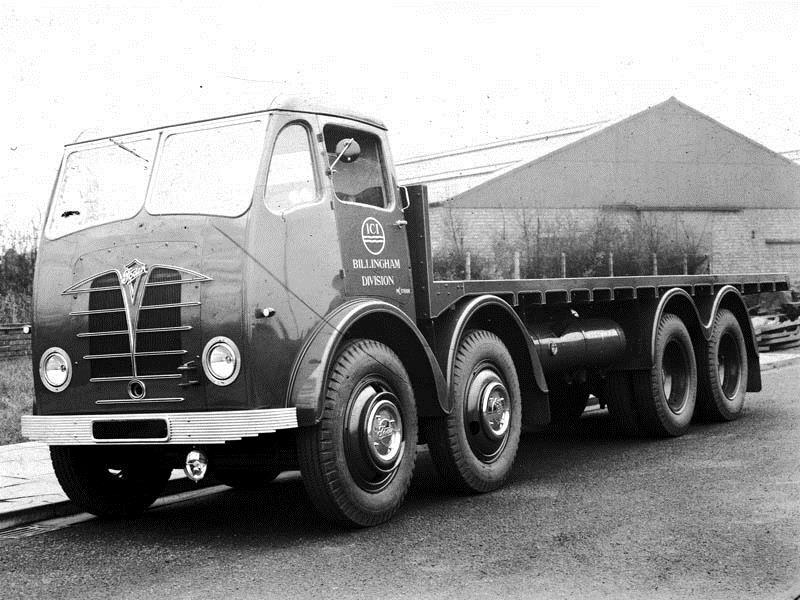 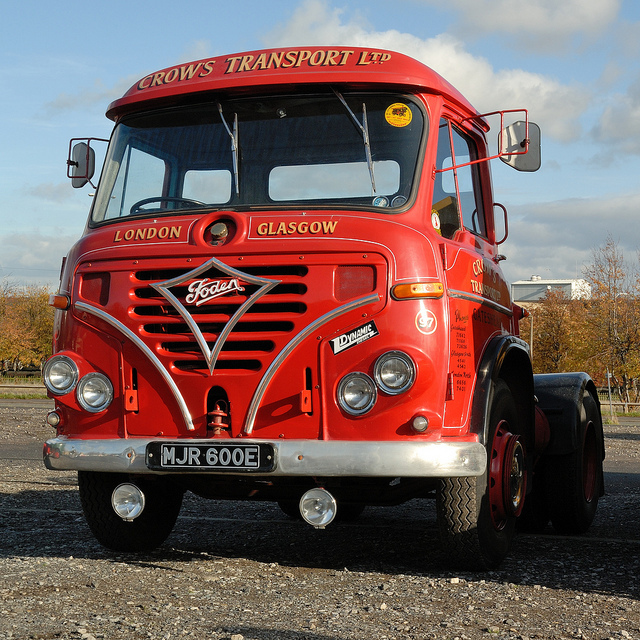 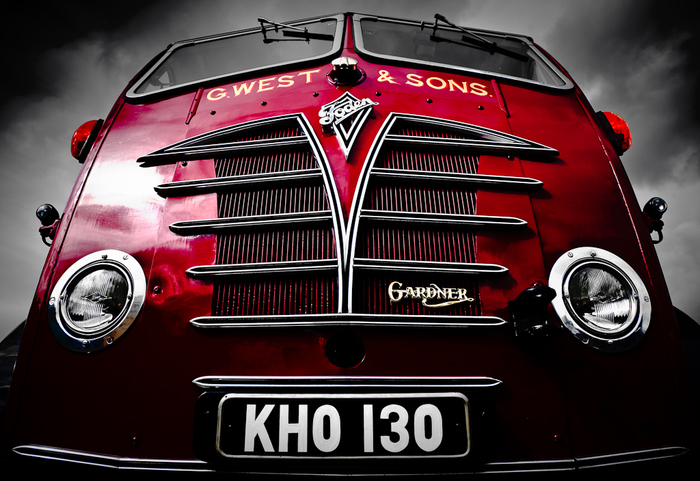 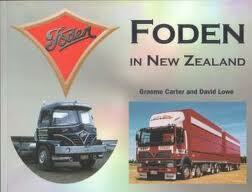 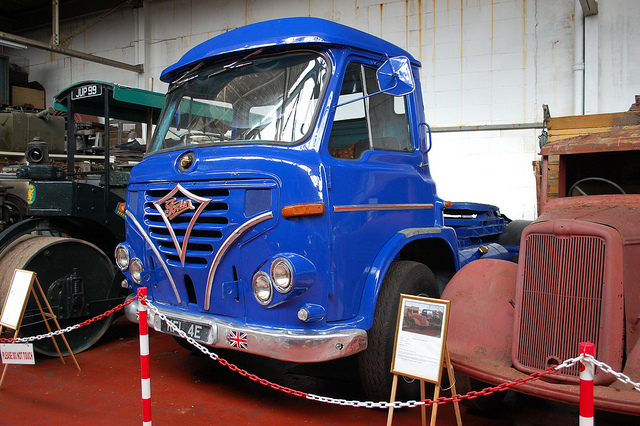 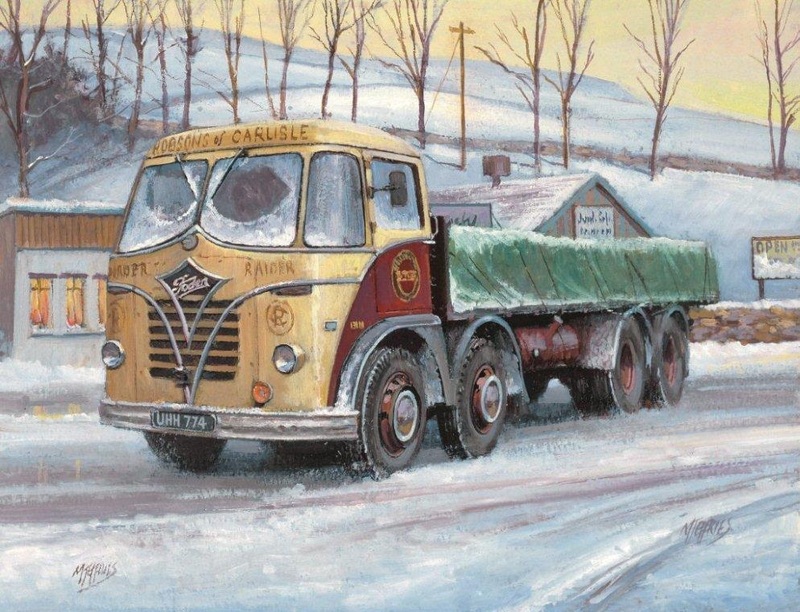 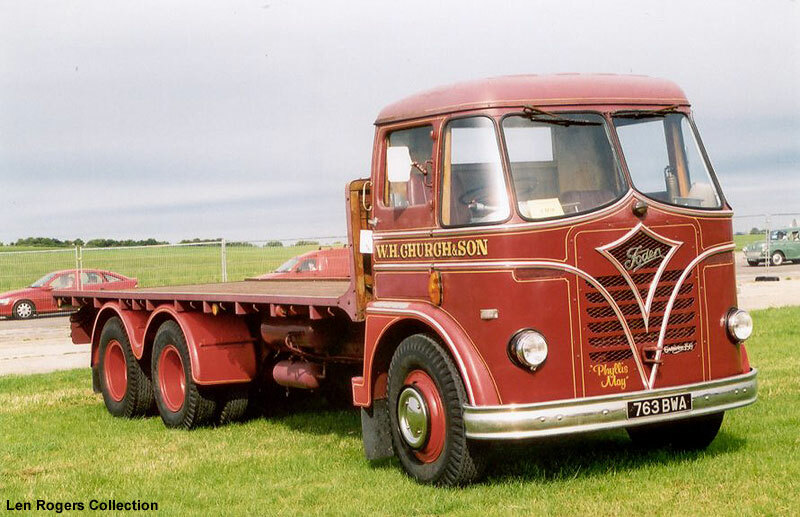 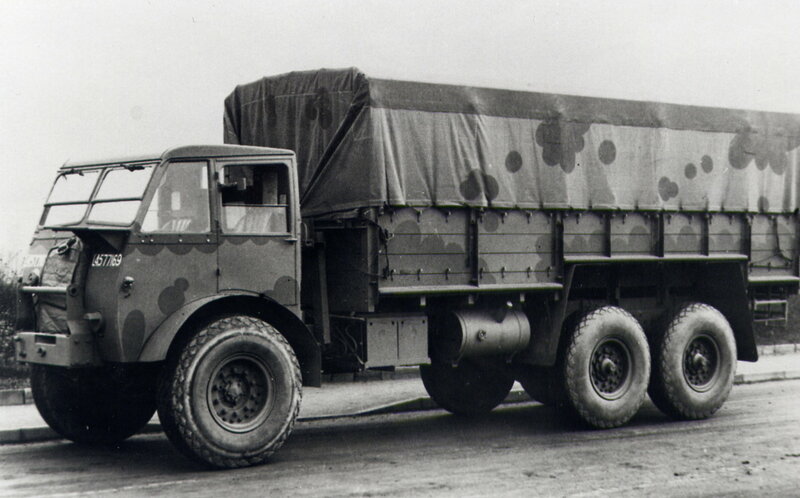 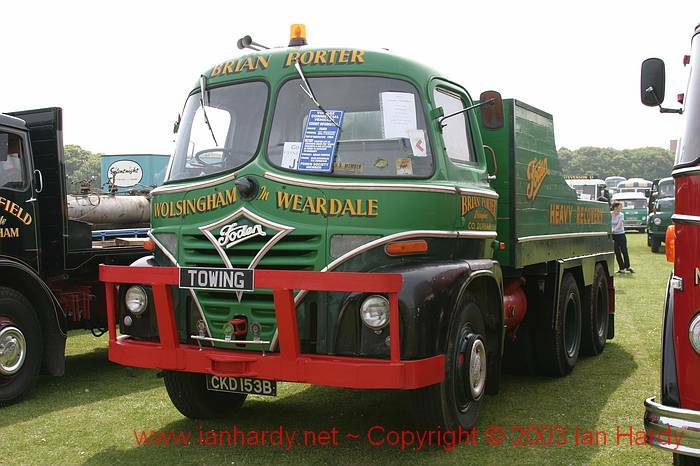 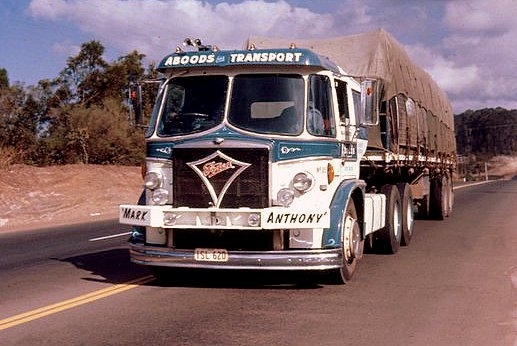 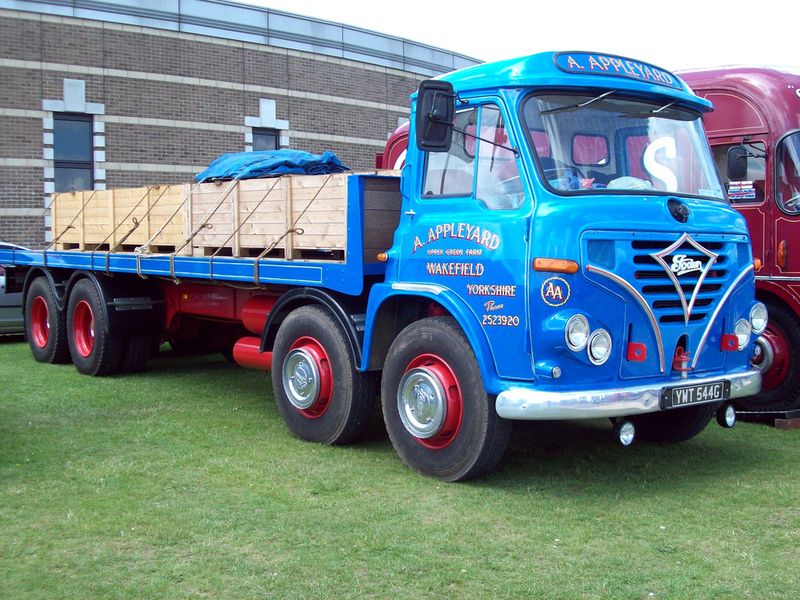 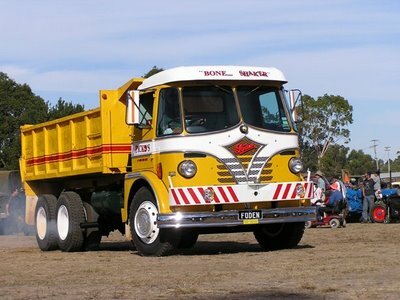 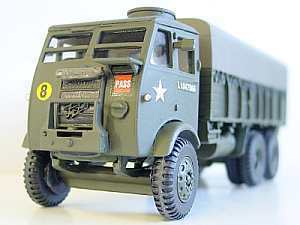 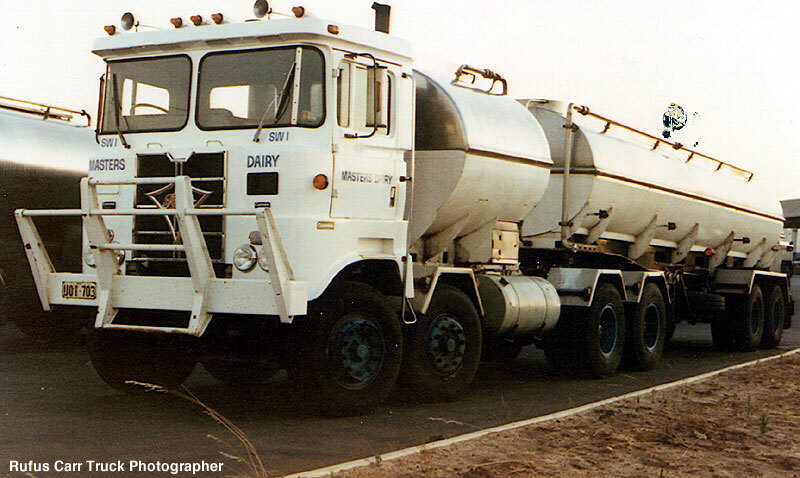 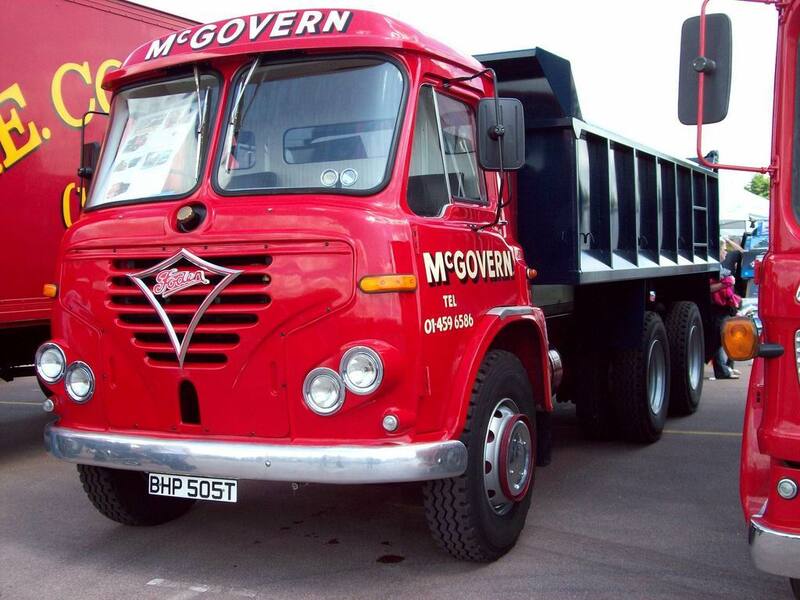 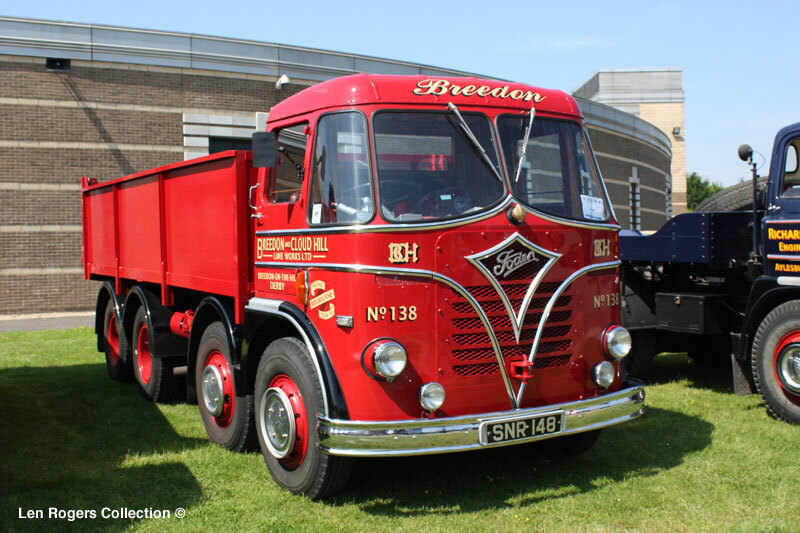 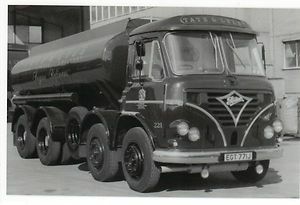 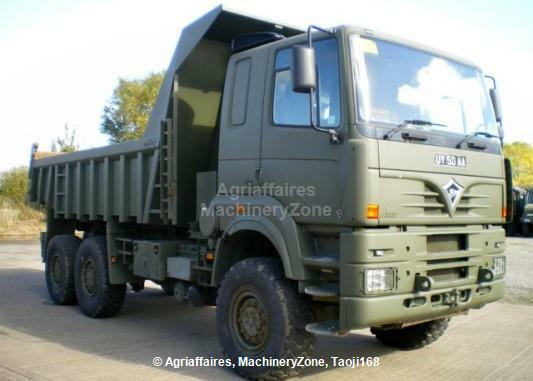 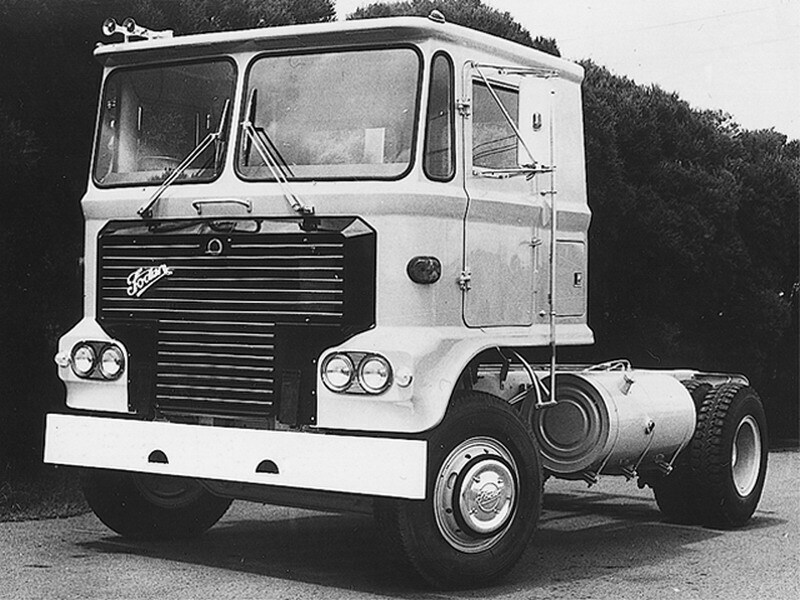 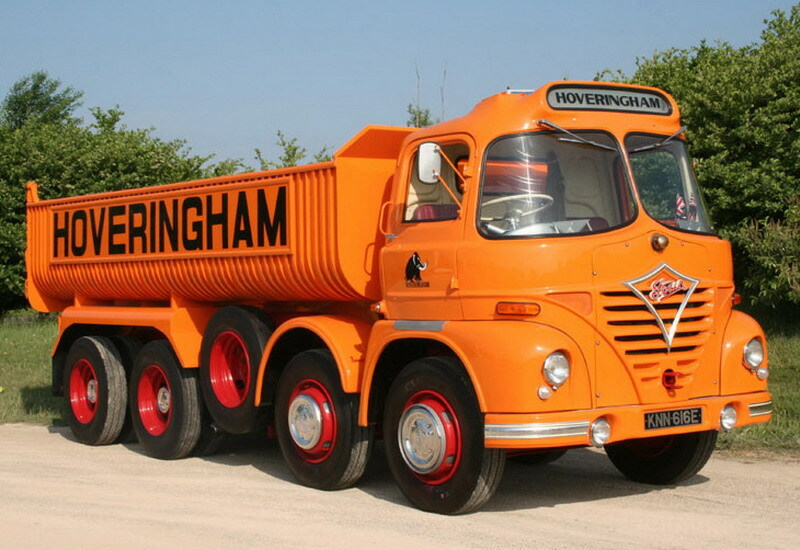 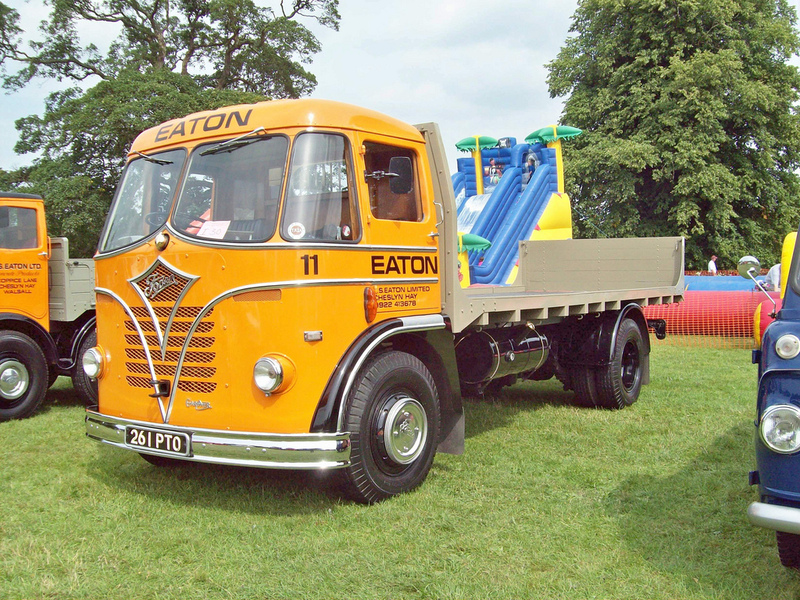 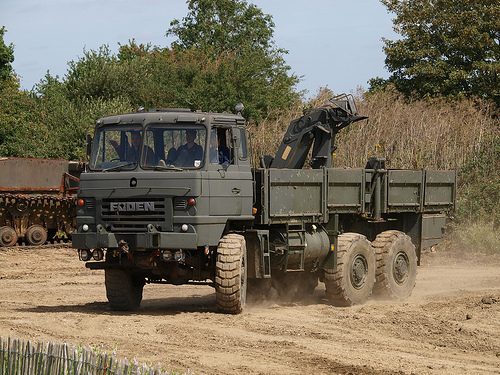 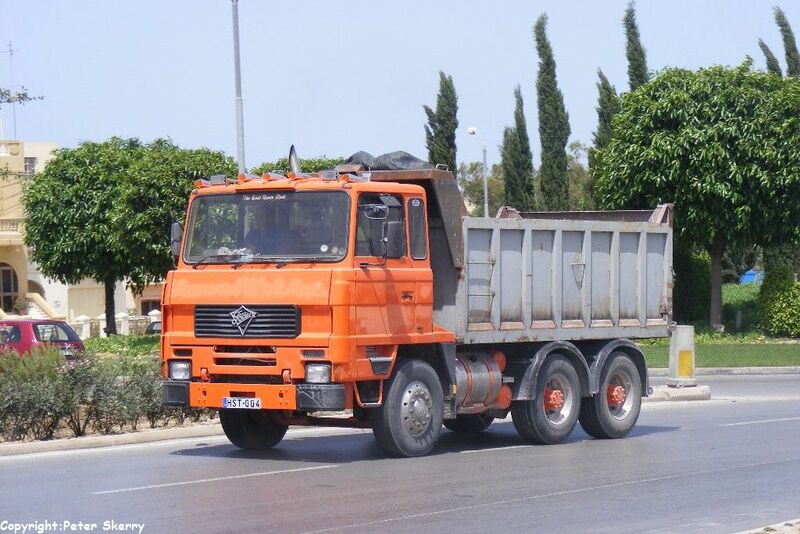 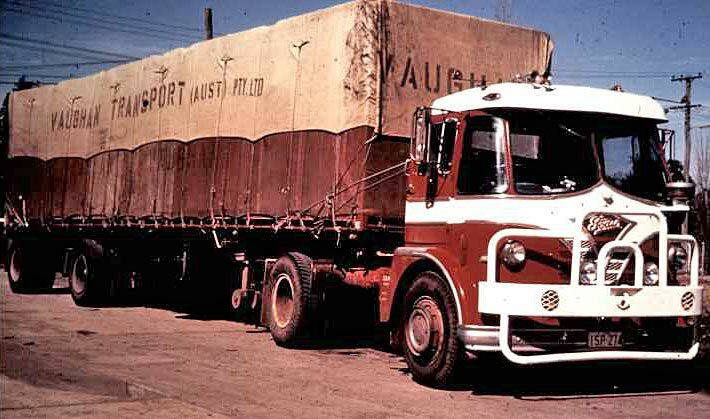 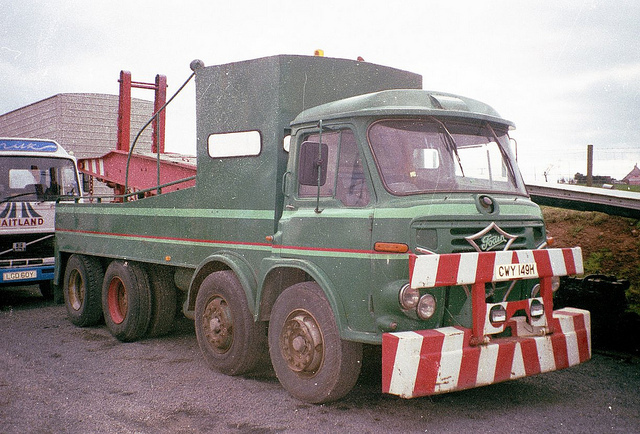 1958 Foden FG5-14 Tanker of Nestle. 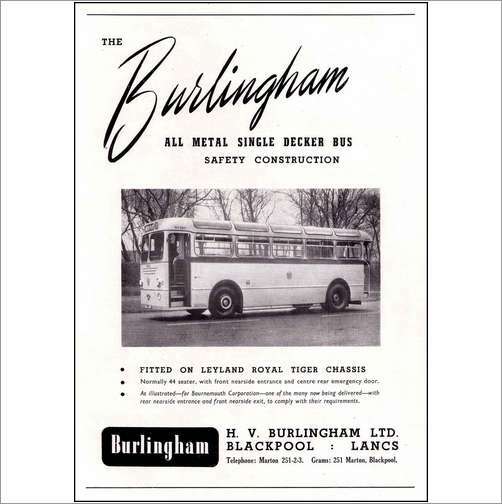 http://en.wikipedia.org/wiki/H._V._Burlingham Ik kan nergens een logo vinden van Burlingham.. Wat ik wel weet is dat het een coachbuilder was from Blackpool, Lancashire. 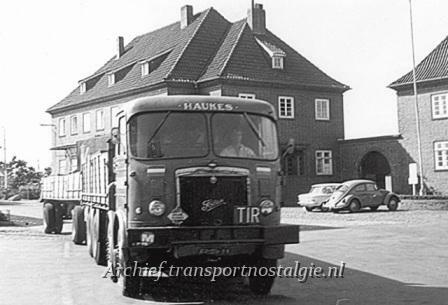 Ze begonnen in 1928 en dat duurde tot 1960 toen Duple het overnam. 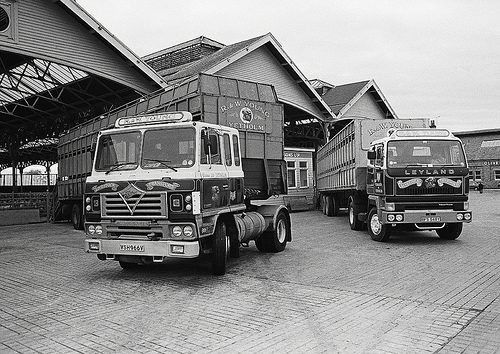 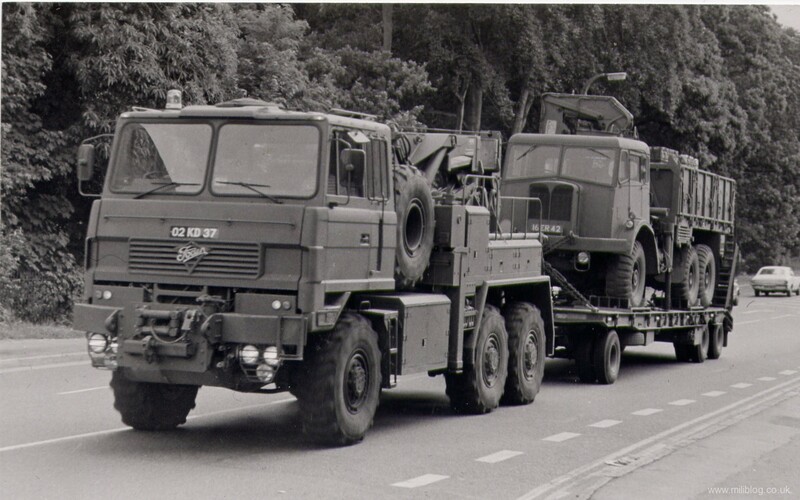 Dat was maar voor 29 jaar, want toen hield het helemaal op, ook bij Duple. 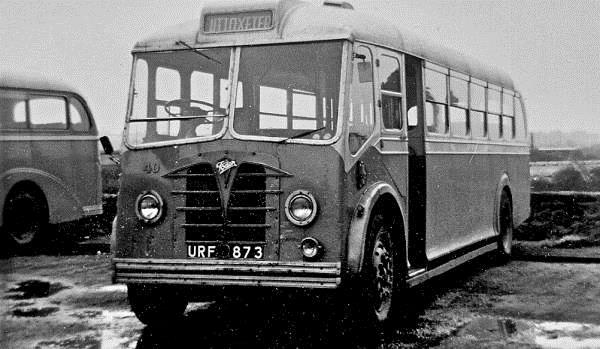 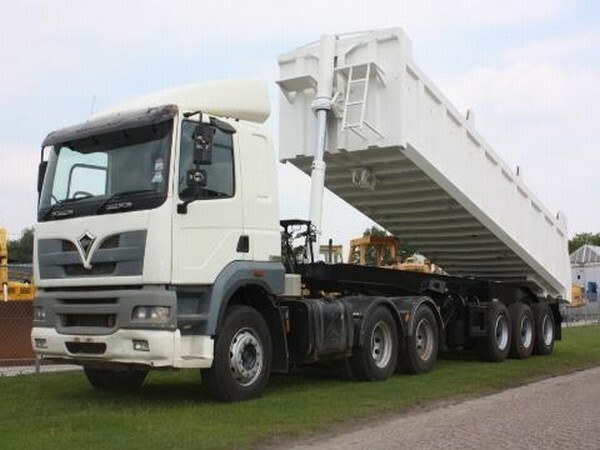 Nu dan naar de plaatjes van bussen. 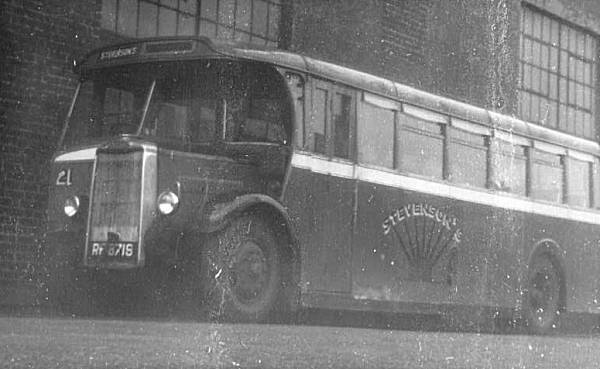 TS7 which was converted to an engineers tender.